[DG]: According to the preview at the end of Episode 23, this episode begins with 199 days left (“hyakku-kyuju-kyu nichi”). Taking that at face value, it would place the start of this episode eleven days after the start of Episode 23. Everything in that episode appears to happen real-time, inside of one day. There’s no indicator anywhere of what went down during those eleven days, but it’s likely that the bulk of it was spent on or around Garmillas with lots of “what now” discussion. Fertile fanfic ground, perhaps. 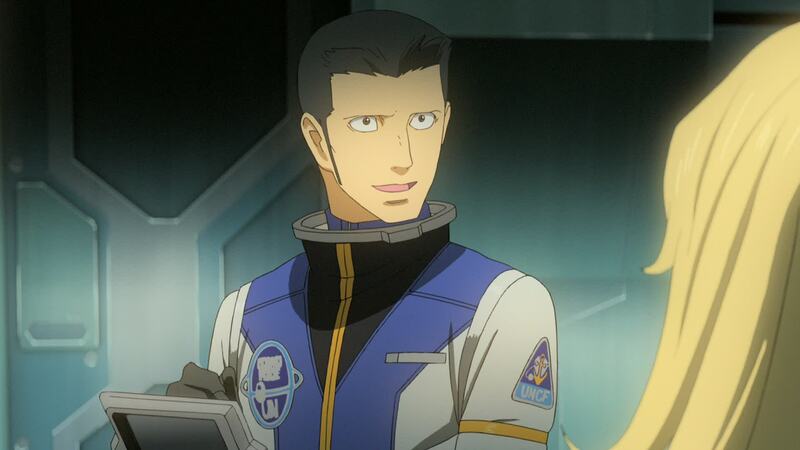 While it’s possible that some time dilation occurs as a result of high-sublight speed, even if Yamato is travelling at 0.9 of the speed of light, the time dilation over such a short distance would not amount to anywhere near the 11 day difference. 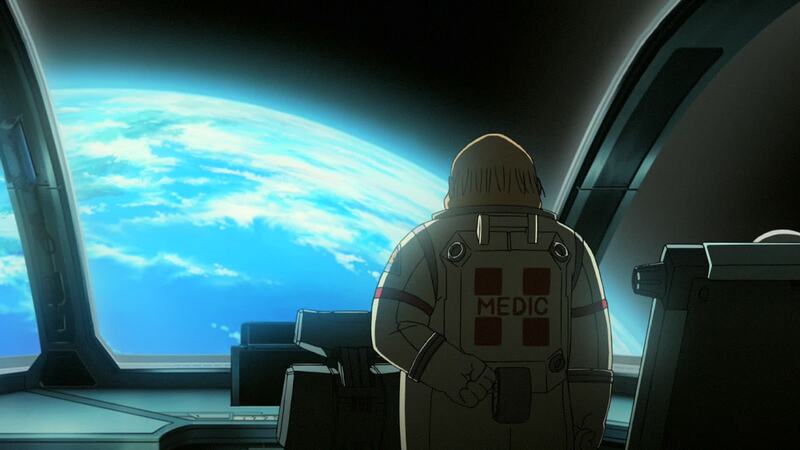 Assuming everything in Episode 23 happens on the same day, Yamato arrives at Iscandar on or around July 17, 2199; Day 156 of the mission with 210 days left. The sun shines over Garmillas’ horizon. 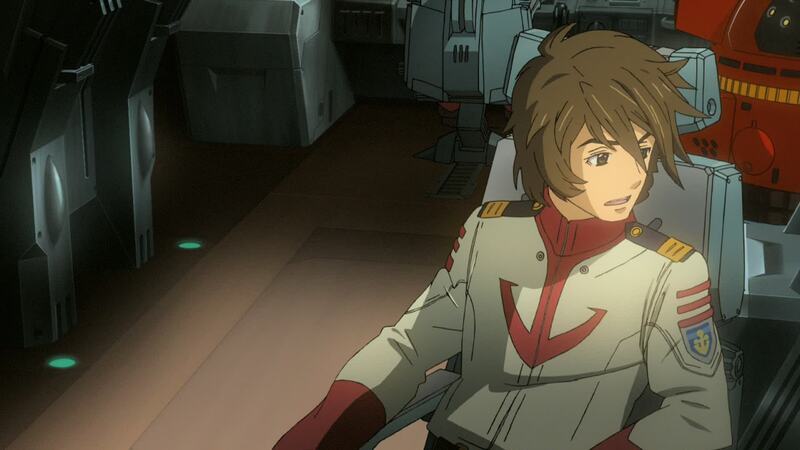 Yamato has left the enemy capital behind and flies through the vast debris field left by the destruction of Dessler’s space fortress, Baleras II. [LC]: This is a beautiful shot. 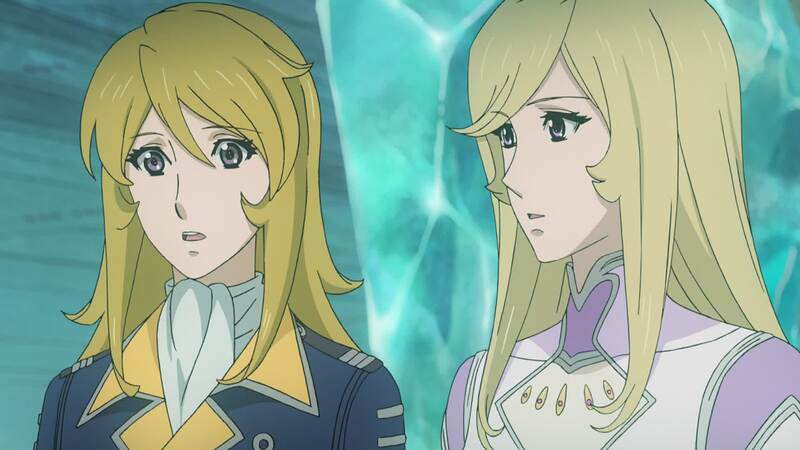 Not only is Yamato perfectly rendered – as usual – but they’ve spruced up Garmillas. Instead of the usual fully lit view of the planet, we get this amazing helf-light rendition. Garmillas never looked better. 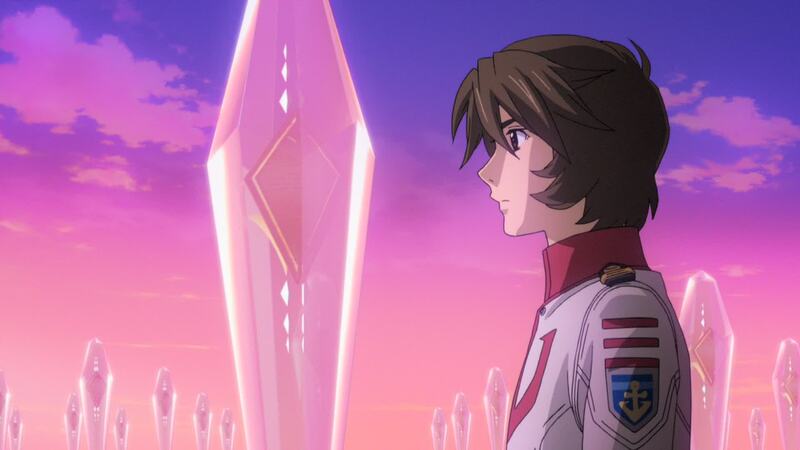 Kodai’s damaged Zero has been recovered and is now being stored in its hangar, just as Yamato flies on toward its goal, the blue orb that is Iscandar. [DG]: Maybe they just weren’t going to bother trying getting the gear down or folding the wing in – it doesn’t look like there’s external damage that would prevent the wing folding. Given the shape the plane’s in, it’s almost certainly written off. The cover for volume 7 features a beautiful character illustration of Starsha and Yurisha, made by Nobuteru Yuuki. The 3D renders used as the illustration’s background seem to have been lifted directly from this shot. Not quite. 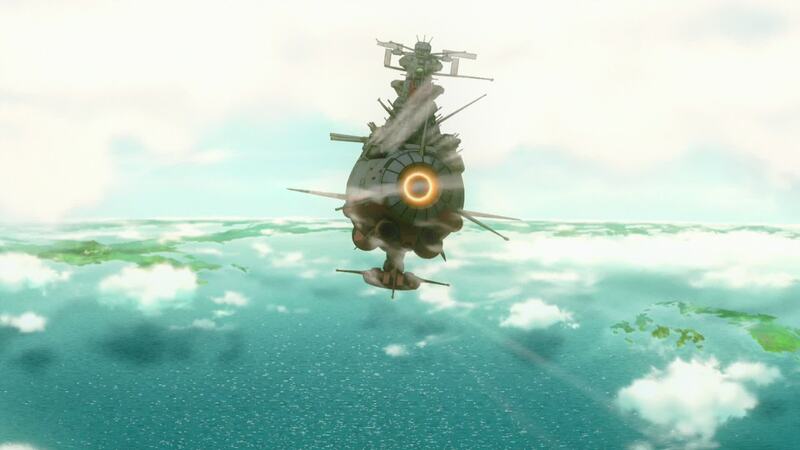 While it’s certainly the baseline, the Yamato on the cover art is intact (no damage to the port tail stabilizer), the #2 turret isn’t slung out to port like the footage, and in the footage Yamato always stays to the right side of Iscandar. The crew looks silently at the approaching planet they fought so hard to reach and where the future of mankind lies in wait. Kodai, Yuki and Yurisha arrive and are welcomed by the smiling faces of their friends. 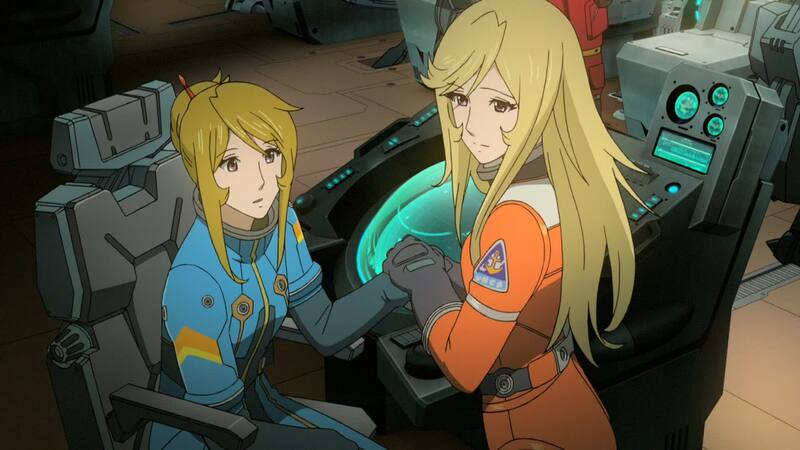 Misaki gets off the radar console, welcoming Yuki as she passes the controls to her. 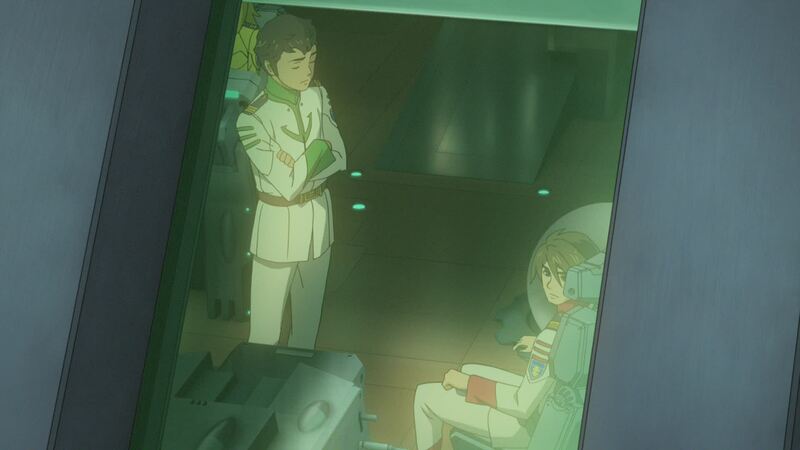 Kodai stands next to Shima, Nanbu still at his post. Yuki sits at her console as an elated Misaki looks on. Eventually, everyone goes back to gazing at Iscandar. 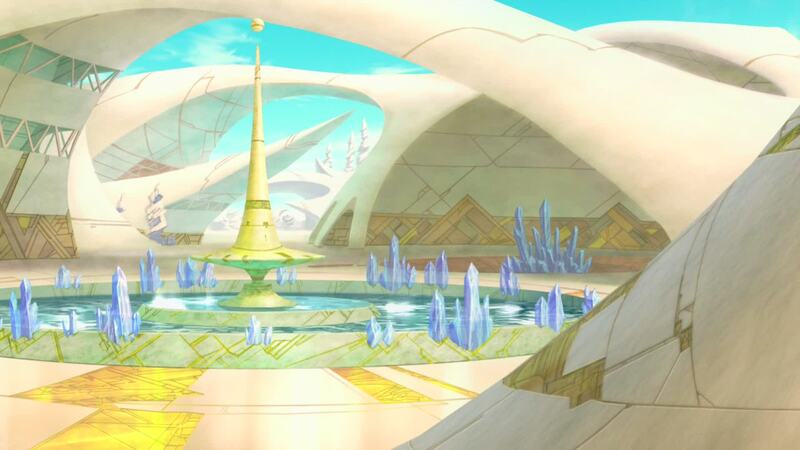 Ota reads the data coming through on his display, describing Iscandar as an Earth-type planet, with eighty percent of its surface covered by water. [DG]: When Ota mentioned that 80% of the surface of Iscandar is water, I scratched my head. The majority of the land must be on the opposite side to the one we always see then, because it looks more like 90-95% of the surface, especially when taken in the context of Earth’s surface being over 70% water – it looks to be much, much less land than Earth. Smiling, Shima says they’ve made it. Kodai happily concurs. Lying in his bed, Captain Okita takes in the landscape before him. Dr. Sado watches as he takes the PA in his hands and addresses the crew. He says they have finally reached their goal and urges them to look at the beautiful planet. He says there is only one thing he’d like to tell them… “Thank you.” He puts the PA down and turns his attention back to the planet. Sado smiles. [DG]: This scene was in the original Episode 24 as well, except that it was at the end of that episode, which actually depicted the Battle of Gamilas. Most of the events here are depicted in Episode 25 of the original. 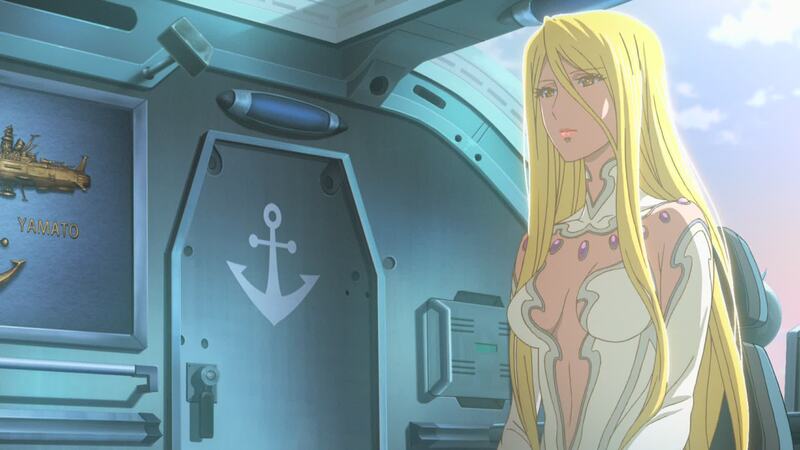 Yuki takes over the air waves, announcing that Iscandar will now take over the ship’s controls and guide them down. She also shares a few technical details of the planet. 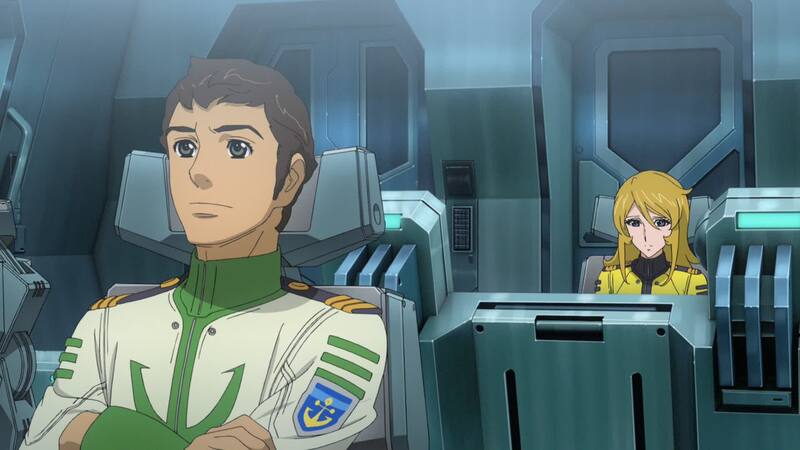 Having stowed their planes, Yamamoto and Melda join Kato, Shinohara and the other pilots in the starboard observation deck, looking in wonder at the spectacle beyond the windows. Throughout the ship, the crew uses whatever is at hand to enjoy the moment, be it a window or the images being relayed to the ship’s screens. 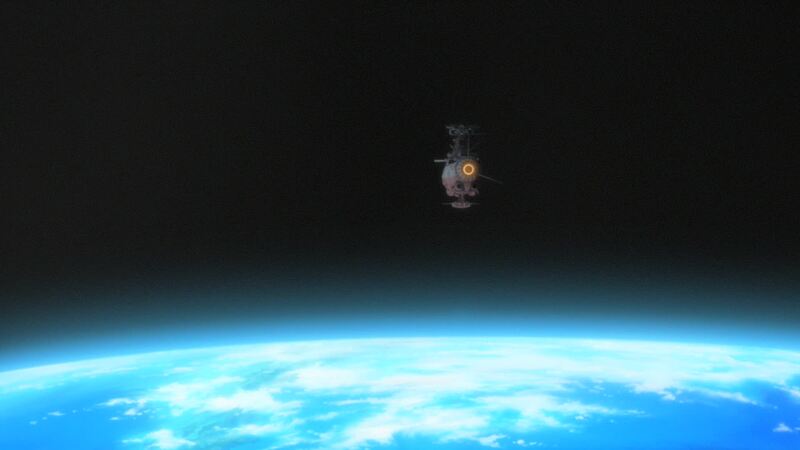 Yamato enters the calm atmosphere, overflying the deep blue ocean. Breaking through a cloud bank, the ship descends toward the lush green continent in the distance. It keeps descending, overflying a large artificial ocean pool, leading to what is apparently the only construction on the planet. 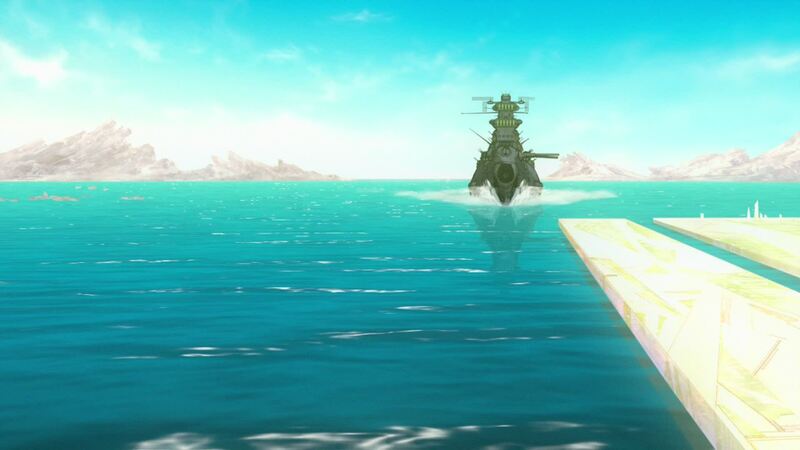 Yamato splashes down and is maneuvered toward a large dock, underneath the imposing structure. [LC]: I use the term “ocean pool” because that’s what it looks like. 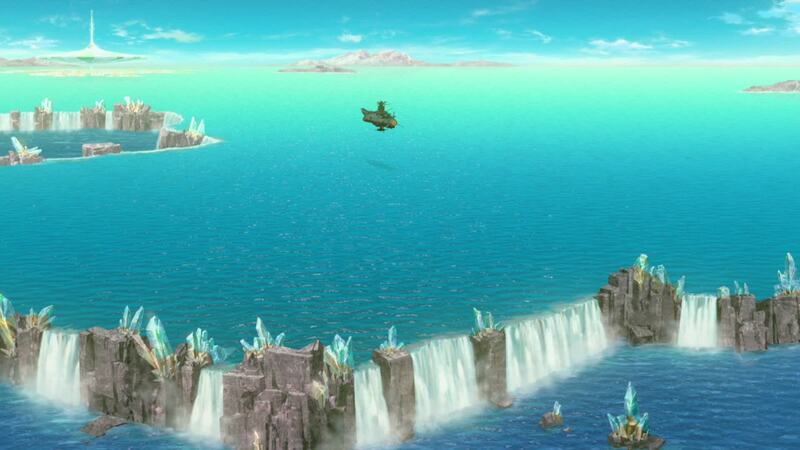 In the wide shot, we see that Yamato set down on a large mass of water bordered by some sort of crystal wall. The water level inside the wall seems to be higher than the surrounding ocean. My theory is that serves to maintain a constant water level on the city’s coast and port. Given the amount of ocean surface and the gravity influence of its planetary neighbor, Iscandar must be subjected to some extreme tides, probably enough to lower the water in that port to a point where it can’t be used. Walling the coastal line at the correct level allows the ocean to cover the wall at high tide and refill the “pool”, while keeping the water at sufficient level during low tide. I caution that this is just my conjecture to justify the visuals, not an official description. A smaller vessel is docked in a side channel, manned by a single Iscandroid. 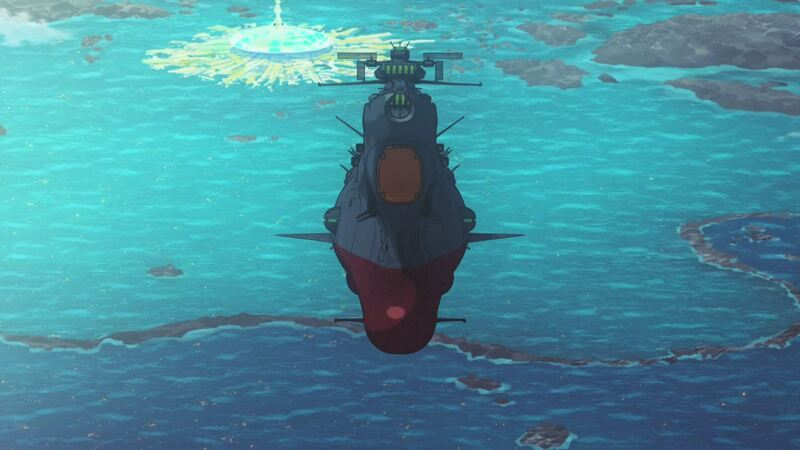 The anchor drops and Yamato comes to a stop. The first half of their journey is finally over. [LC]: I have just one issue with the way Yamato docks. Though at this point it’s missing , the rear port stabilizer (destroyed by the Dessler Cannon) might be an issue when fixed. As we’ll see in a shot at the end of the episode, this would intersect with the peer. Unless that peer is floating, it could cause some trouble. That whole city, though visually impressive, looks like an accident waiting to happen. Good thing 2199 left out those freak earthquakes we saw in the original. Sanada says they’ll return Yurisha and orders Kodai and Niimi to accompany them. Yurisha holds Yuki’s hand and looks at Sanada. 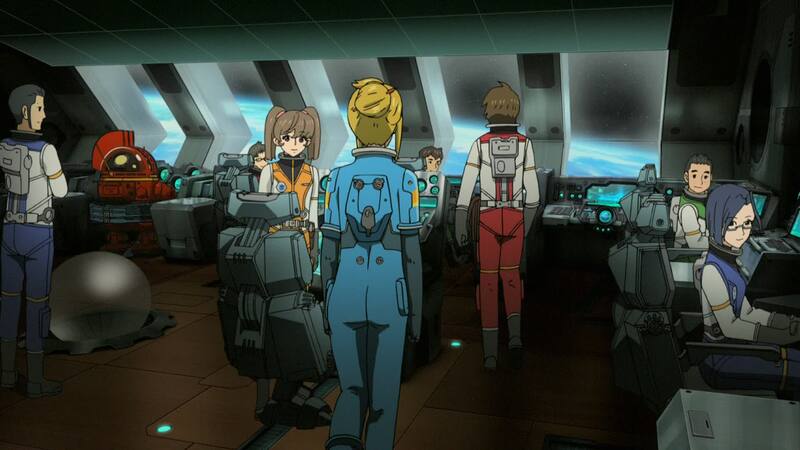 Even though no words are spoken, the XO understands her intention and has Yuki join the landing party. [LC]: Of course Yurisha wants to take Yuki, Sanada. Haven’t you been paying attention?! Now in dress uniforms, they board the small barge and the Iscandroid pilots it through the channels in the lower level of the massive city. Despite its size, something becomes apparent to them… there is no one on the streets. Not a single soul in sight. The capital of Iscandar is a veritable ghost town. 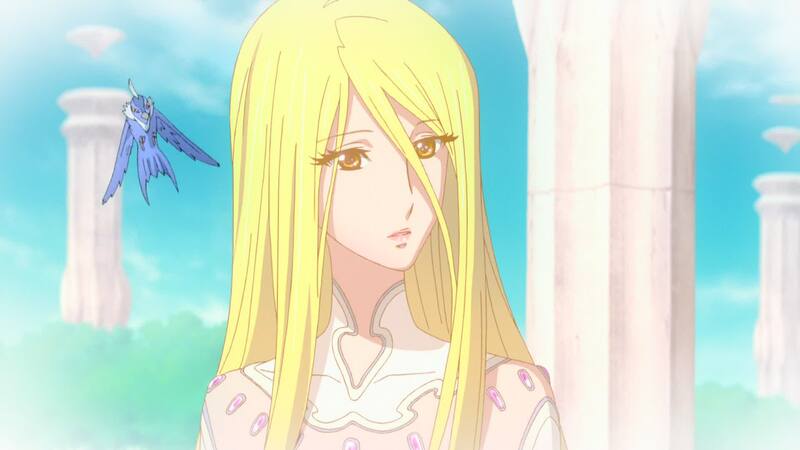 Eventually they make their way to the main tower, where Starsha’s palace is located. 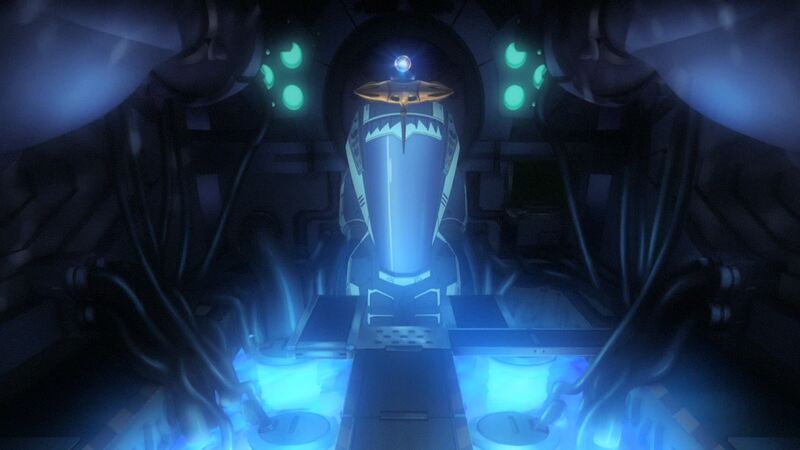 They’re taken to the large and imposing throne room, and the Iscandroid tells them she’ll be with them shortly. 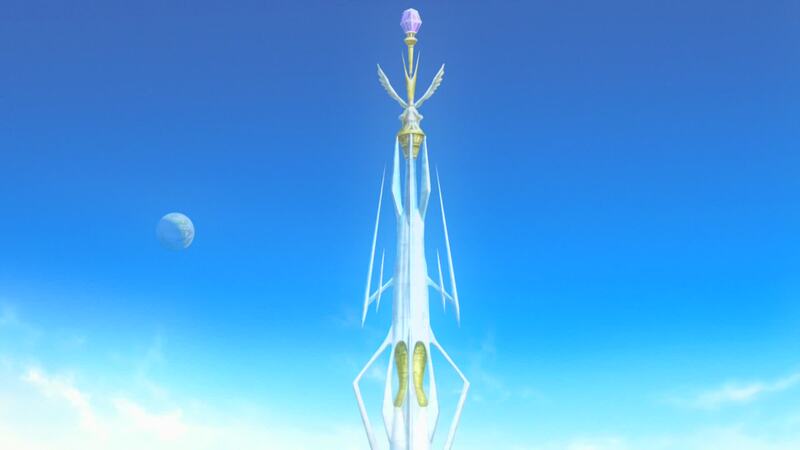 [DG]: The spire of Iscandar City (for want of an official name) looks to represent the hado-core on one hand, andthe spires of Garmillas on the other. The presence of the wings atop the spire is an interesting addition. 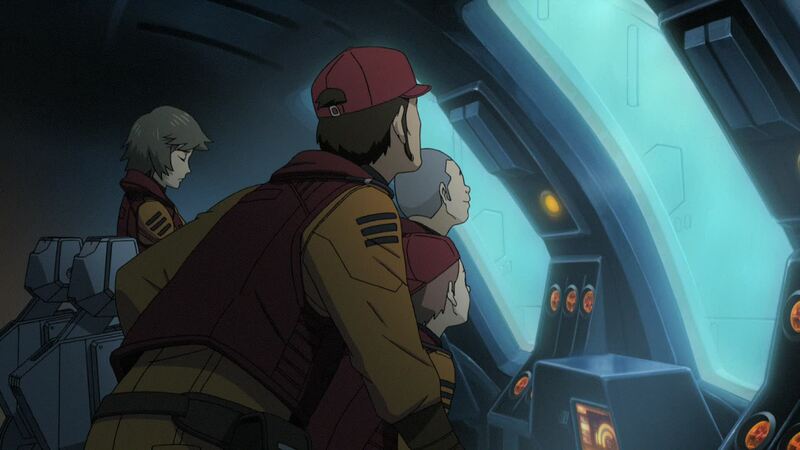 To me, they seem somewhat out of place with the rest of the Iscandarian architectural aesthetic (I’d mention something about their looking too much like the wings of Terran birds as well, but the presence of a bird in Dessler’s quarters takes care of that). I can’t help but think this is a subtle nod to one or more anime involving the cast in this scene. One possibility is it’s a tribute to the classic Ah! 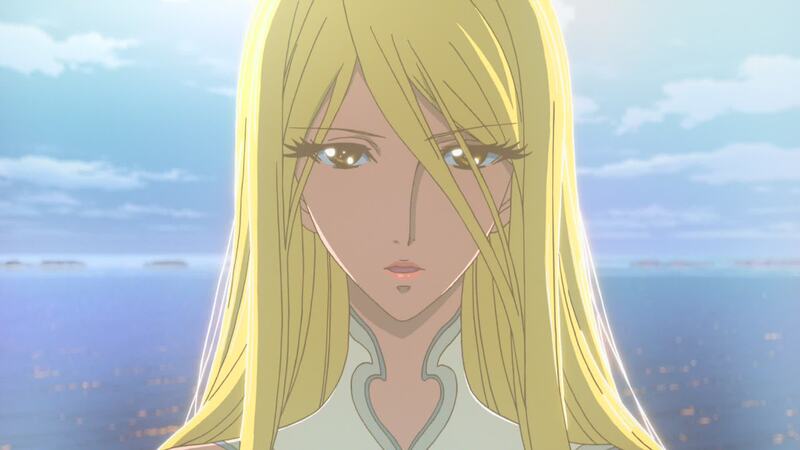 My Goddess anime, which starred Kikuko Inoue (Starsha) as the Goddess Belldandy and Aya Hisakawa (Kaoru) as her younger sister Skuld (which, as I alluded to in previous episode commentaries, has interesting character connections of its own). 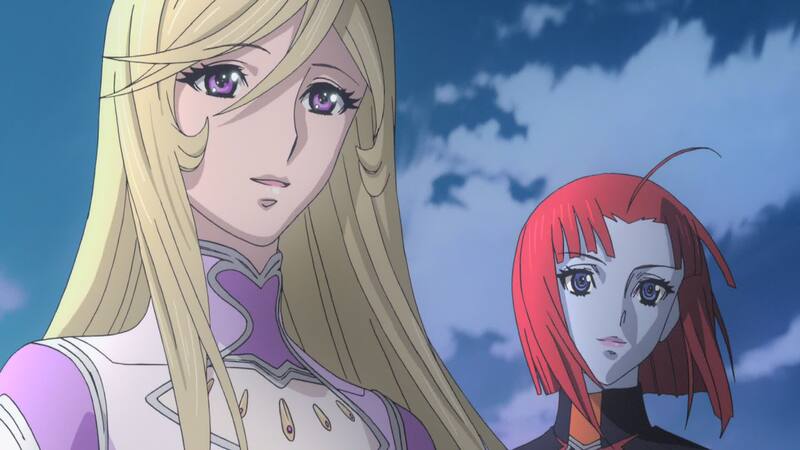 The other anime this could invoke is Angelic Layer, in which Kikuko Inoue and Houko Kuwashima voiced major characters. 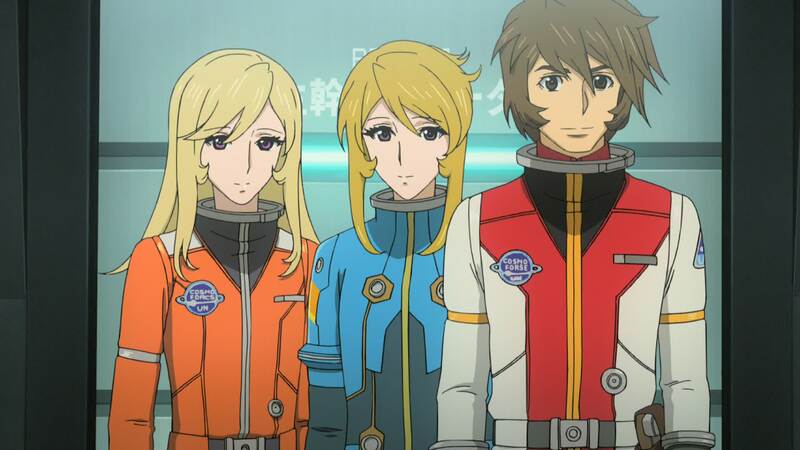 A capsule descends from above, opening to reveal Starsha and two Iscandroids. 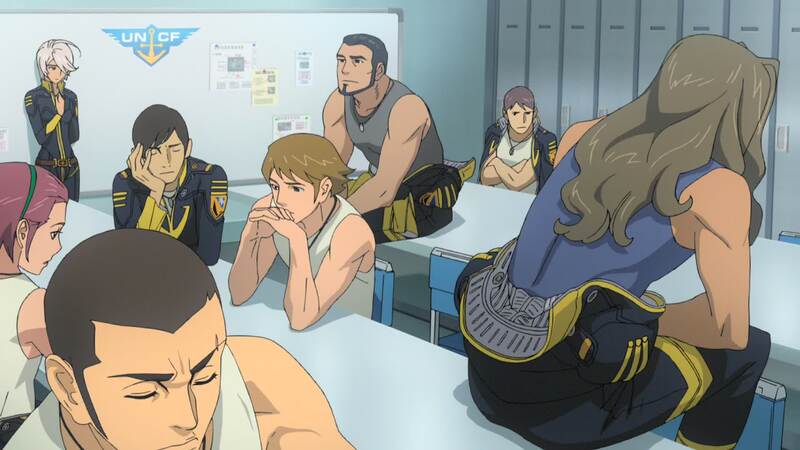 Sanada and the others stand to attention. 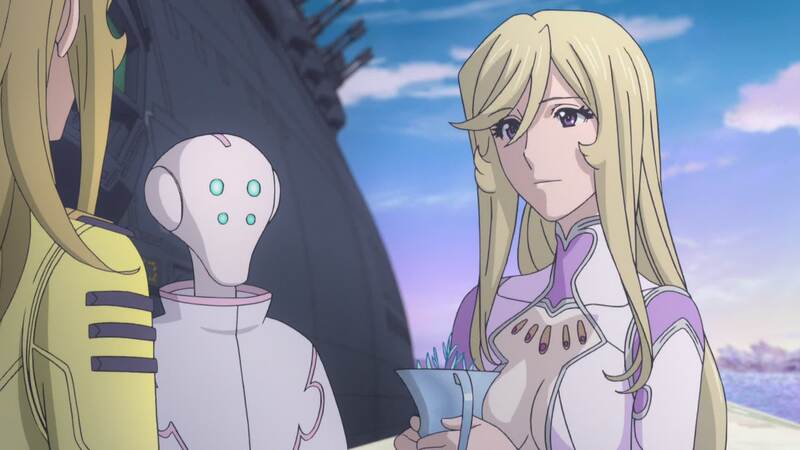 Speaking in Iscandarian, Starsha welcomes Yurisha back home. Confusing Yuki with Sasha, she extends the compliment to her, too. 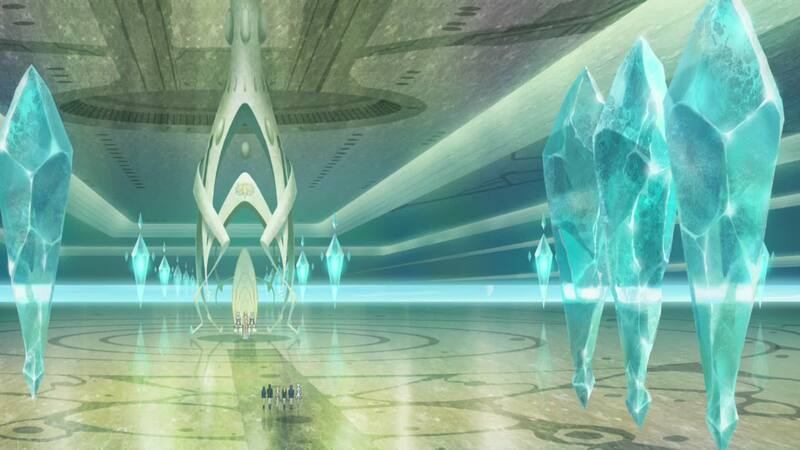 [LC]: Wow, Starsha’s throne room makes Dessler’s look spartan in comparison. Good that they keep the use of alien languages in the appropriate context. Though slightly similar to Garmillan, Iscandarian is a bit softer in tone. 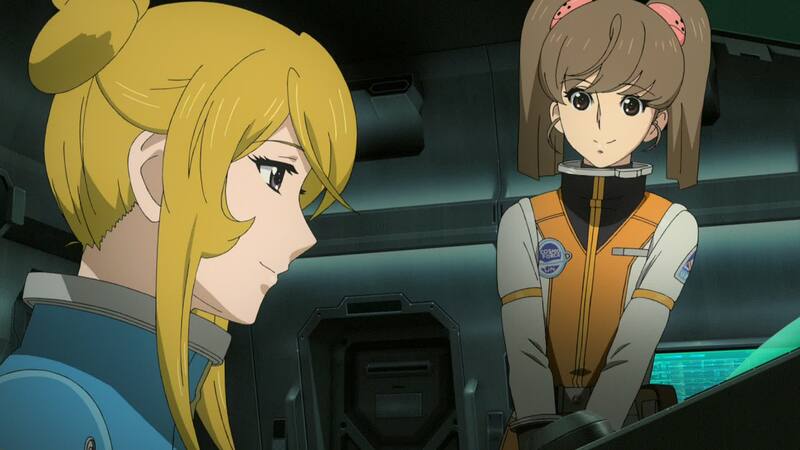 Yurisha explains that is not Sasha but a member of Yamato‘s crew, Yuki Mori. 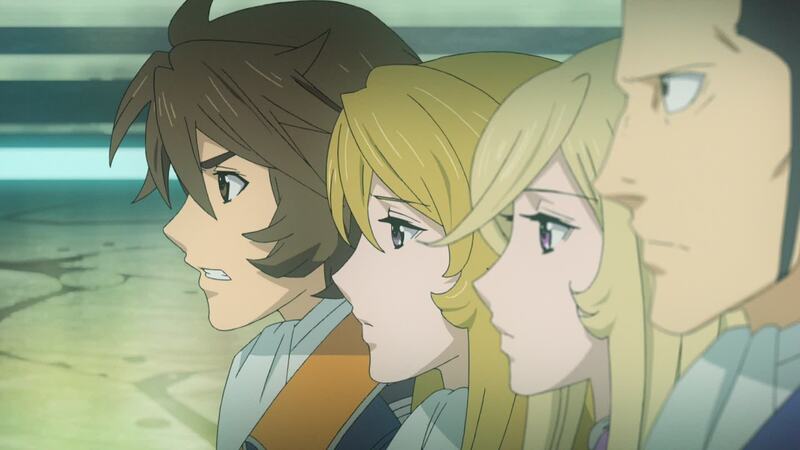 Starsha is surprised, as Sanada realizes what just happened and explains it to the others. 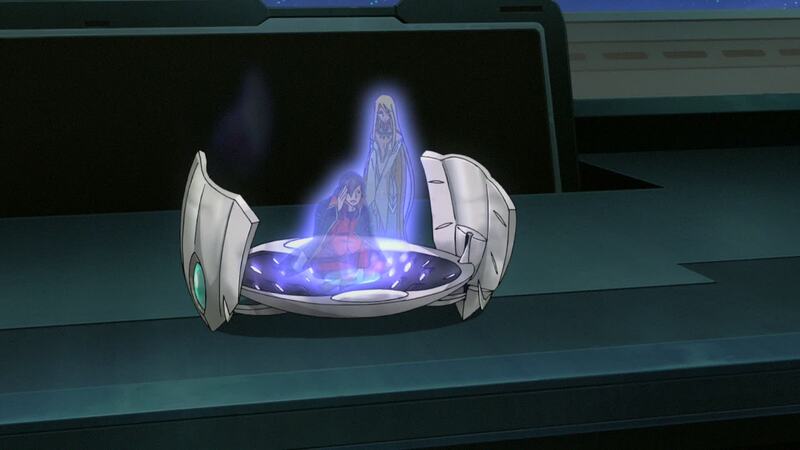 Kodai tells Starsha that Sasha lost her life on Mars, bringing them the Wave-Motion Core. [LC]: This replicates the original, where Starsha also confused Yuki with Sasha. Here they have Yurisha to clear things up, which is a small but important change. 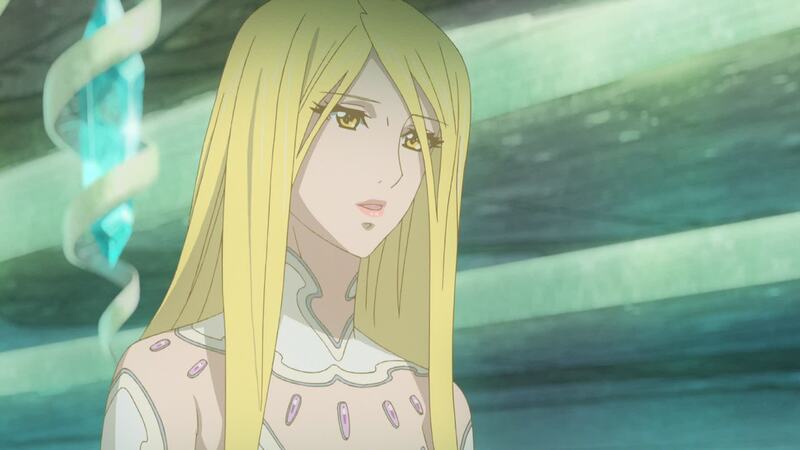 In the original, Starsha was confronted not only with the news of her sister’s demise but also with the fact she was now the last Iscandarian. Now at least, she has Yurisha around. Sure, not great news in the grand scheme of things, but a 33% population reduction is slightly better than 50%. [DG]: Does Yurisha merely say what Yuki wants (or needs) to hear with this phrase? Daniel, you really need to get over the “Yuki is an alien” thing. Let it die! [DG]: Not until we get closure on the matter. 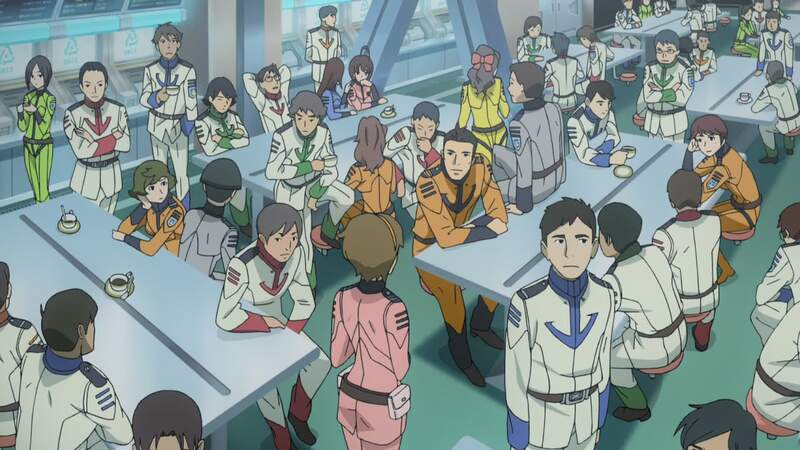 I think we can agree that the whole Yuki story thread was, at least from the context of 2199 as a single entity with no pre-planned followup, poorly written and/or executed. 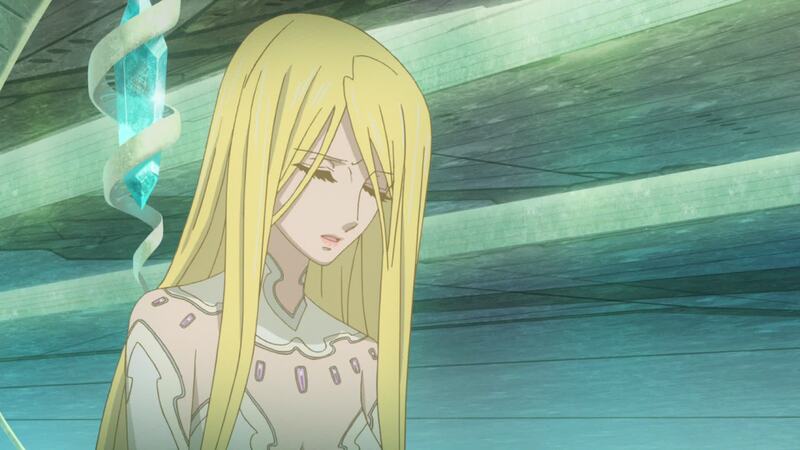 Starsha is obviously saddened by the news, whispering her beloved sister’s name. Kodai says Earth owes her its survival. 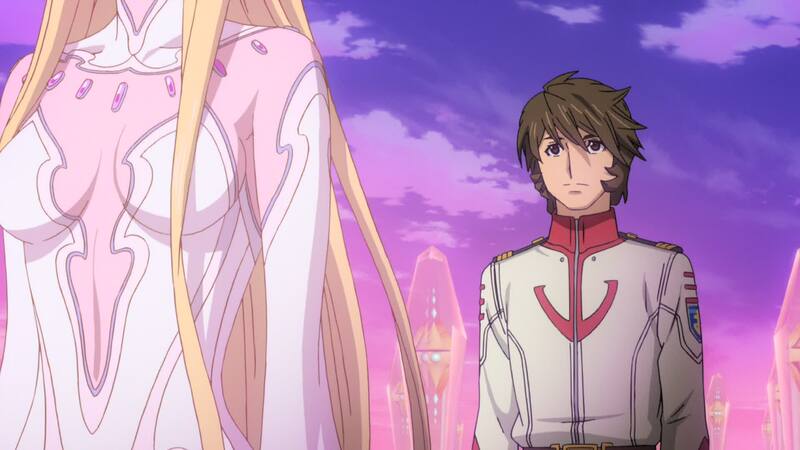 Raising her head, Starsha says that even so, they used Wave-Motion Energy as a weapon. Sanada and Niimi recoil at the queen’s comment. [LC]: Yep, she’s pissed about the Wave-Motion Gun. Who didn’t see that one coming? I’m surprised the original Starsha wasn’t, too. Having Mamoru around to keep her company must have made her more lenient. [DG]: For some reason, this whole scenario that using wave-motion energy as a weapon disqualifies them from getting the Cosmo Reverse System had me thinking that it was kind of like how Charlie Bucket was disqualified from the prize at the end of Willy Wonka and the Chocolate Factory until he returned the Everlasting Gobstopper. Don’t ask me why that comparison of all things came to me. 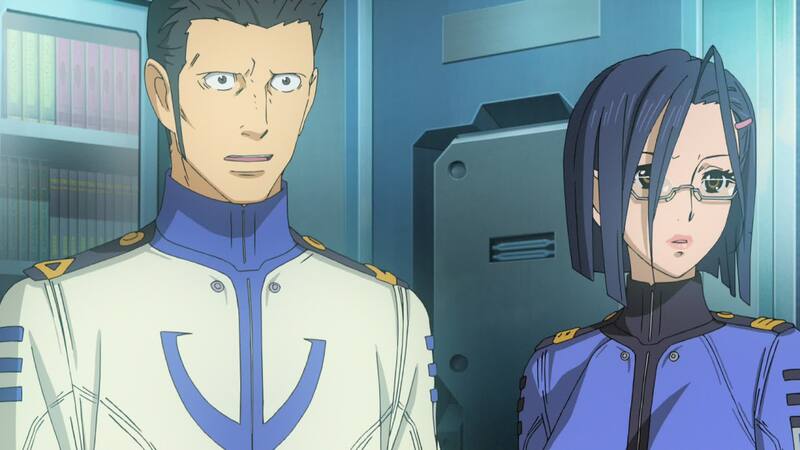 Sanada and Niimi’s reaction here is great. As the creators of the weapon, the fact that it might disqualify the entire voyage must weigh heavily on them. Kodai tries to reason with her, but Sanada stops him. 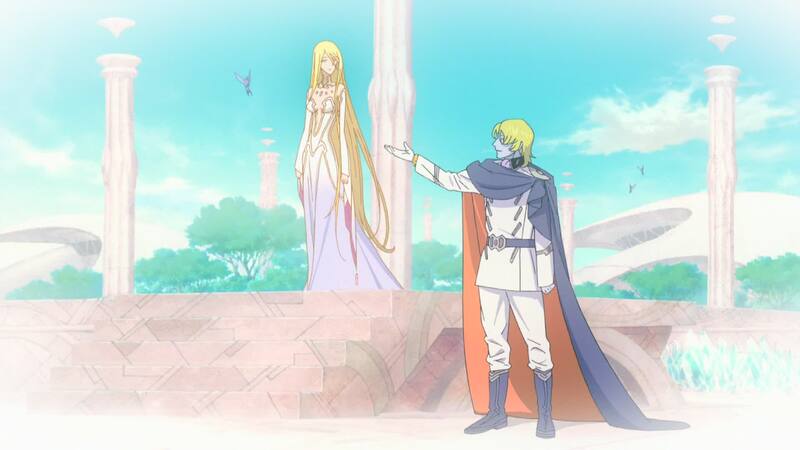 Starsha recoils in recognition, asking Kodai what is name is. He introduces himself and Sanada follows suite. 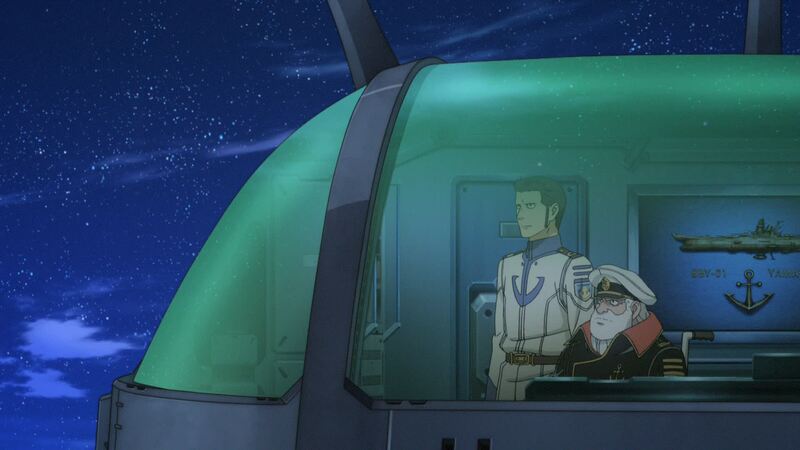 He says he’s Yamato‘s XO and is there on the Captain’s behalf. [LC]: Starsha’s reaction as Sanada says Kodai’s name is also very well played. Though all these reactions from the characters are very subtle, they speak volumes for the fans who know what is behind them. 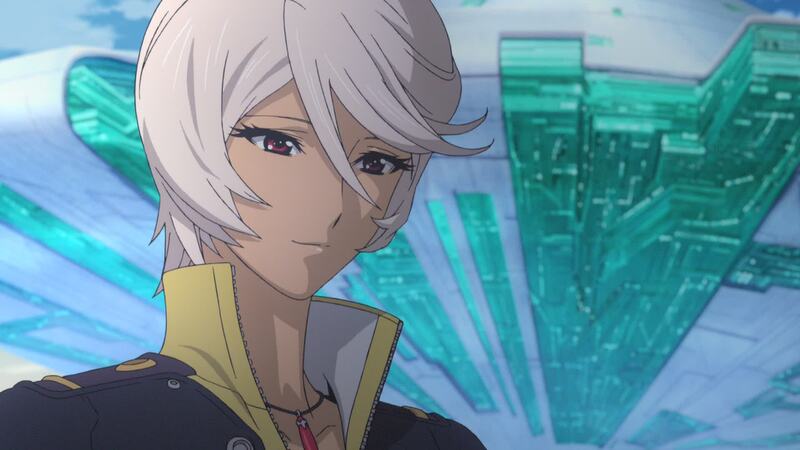 Niimi is next, though her name is met with a slightly different gaze from Starsha. She tells Yurisha to tell her what she has seen, after which she will speak with the people from Earth. Yurisha agrees with a concerned look on her face that is clearly noticed by Yuki. 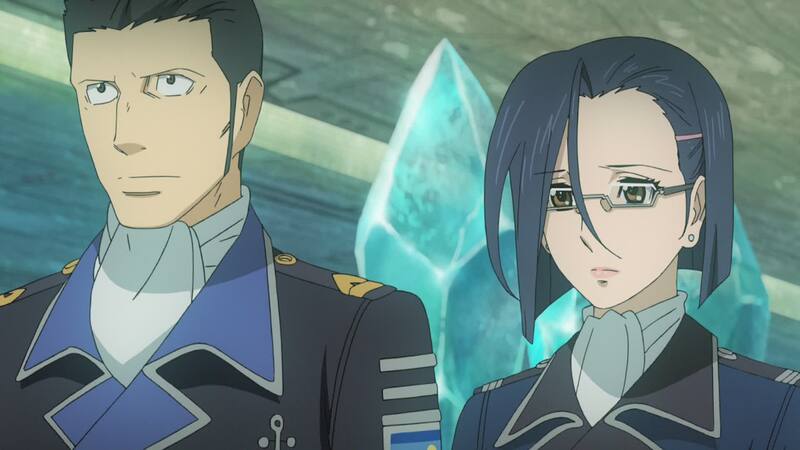 [LC]: Yep, Starsha gave Niimi the cold stare. And we all know why. Back on board, the dismayed members of the away team relay what has happened to the others. Shima can’t believe his ears. 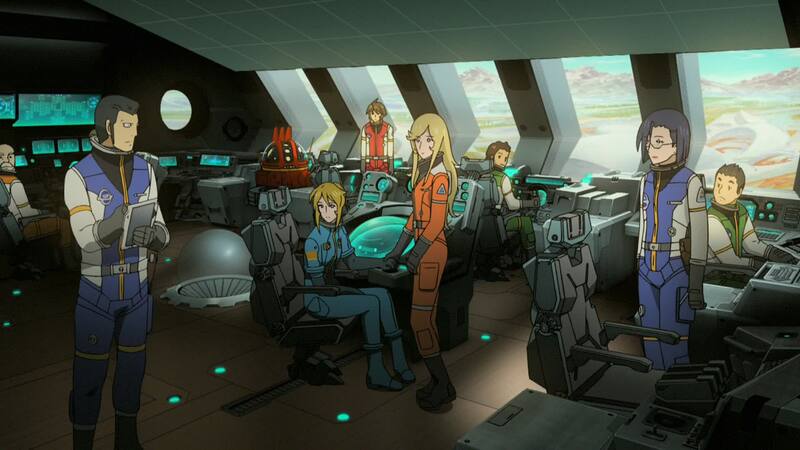 The news spreads quickly throughout the ship as the crew learns that Starsha might withhold the Cosmo Reverse System. As with all rumors, it changes as it goes along, from pragmatically stating she just needs time to think to dramatically saying she wants Earth to die. Some feel downright insulted. Shinohara says they just need to believe. Shima tells Kodai of everyone’s unease. Kodai thinks that’s natural, as everyone finally made it to Iscandar only to be confronted with this unexpected situation. Shima tells him to keep his feet on the ground, something he believes Okita would say. Kodai says they need to do something. Just then, Makoto comes in with a suggestion. 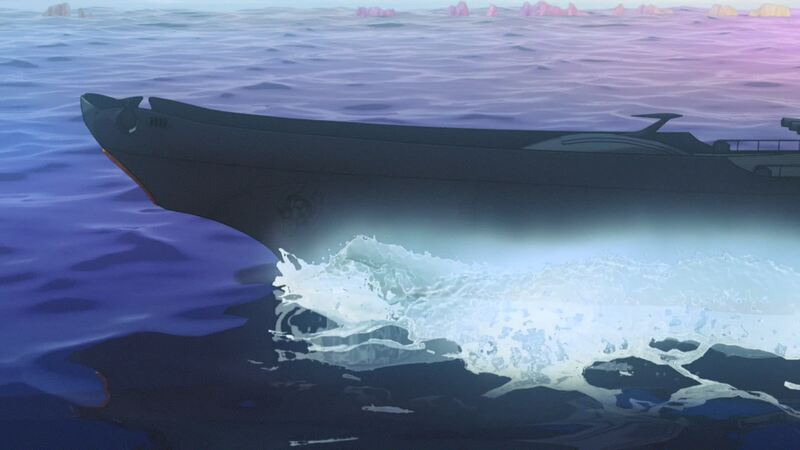 Later, members of the crew are in swimwear jumping off one of the repair barges, using it as a diving platform. 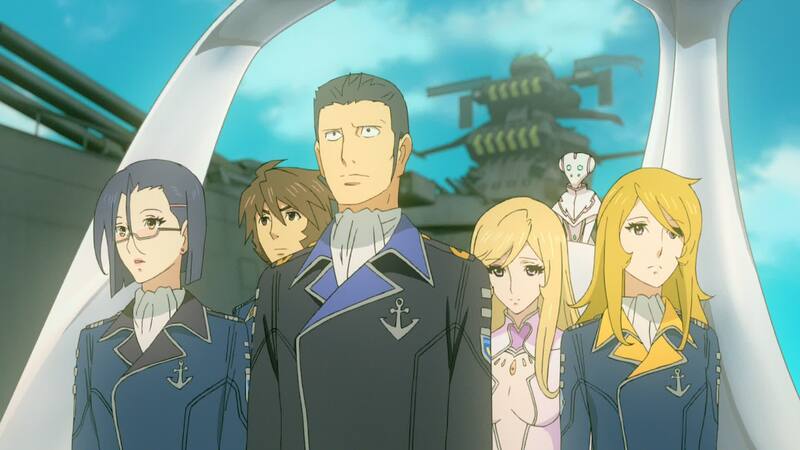 Misaki arrives with Hoshina, Kiryu, Makoto and Saijo. Saijo congratulates Makoto for her idea for the crew let off some steam. Kiryu asks Makoto if Kato isn’t coming, but she says Tokugawa got to him first. We see the two men sitting on the dock, holding fishing poles. [LC]: I just assume they had the clothing equivalent of the O.M.C.S. 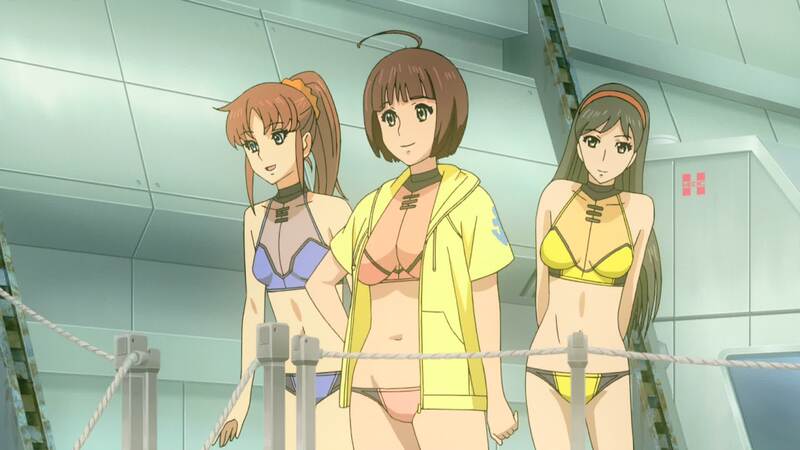 make all these swim suits, much like the cosplay costumes we saw in Episode 7. I doubt it’s part of the Cosmo Navy uniform package. 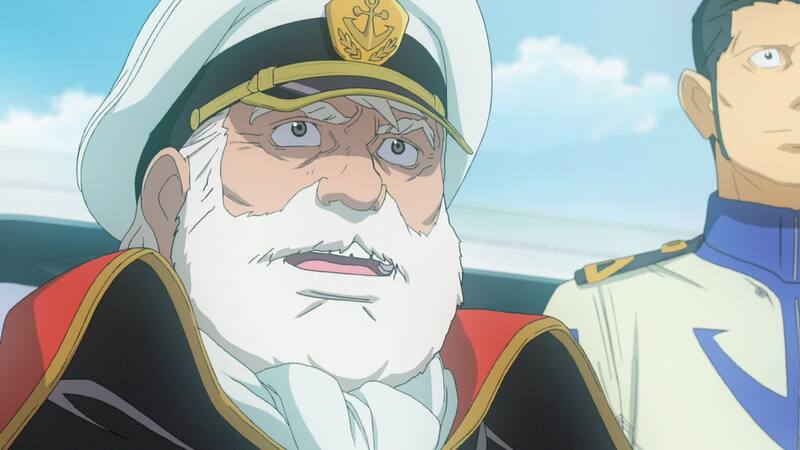 [DG]: The ubiquitous “Beach Episode” which has featured in most slice-of-life and rom-com anime over the last fifteen years has made its way into Yamato. 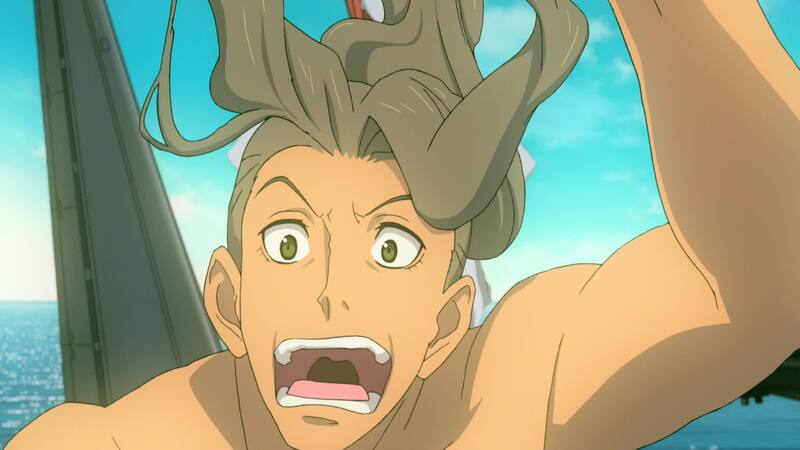 I guess many will see this as an extension of the fanservice culture anime has had in this time. On one hand, it doesn’t really feel like it fits in, but when you think about it a bit more, it does. 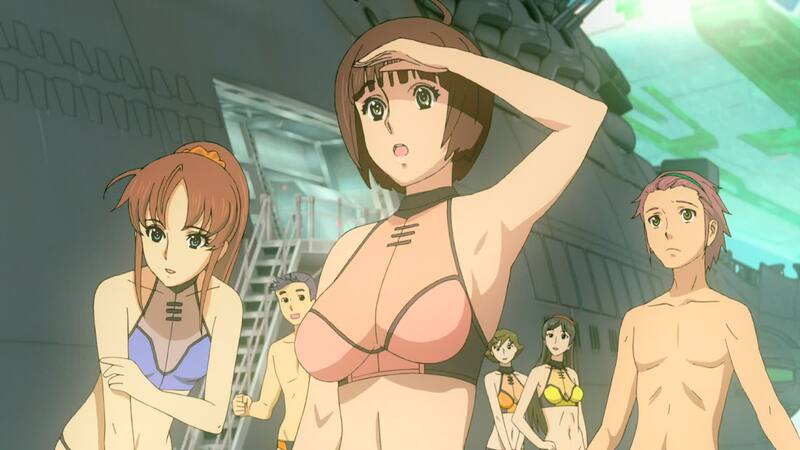 After all, no member of Yamato‘s crew has seen anything bordering on an ocean or a seaside beach in over five years. Is it just me or does Kato look absolutely bored? Isn’t that his default setting? Or is that angry? Yamamoto flies through the air with the grace of a bird, jumping off the starboard catapult and making a perfect dive into the sea below. The people on the barge applaud her as another figure walks onto the catapult. Sawamura recognizes Shinohara, who seems less than willing to jump, even when Yamamoto urges him to jump. The nervous pilot tells himself it’s too high, just before a swift kick from Melda makes him lose his balance and go plummeting into the water. [LC]: This scene is funny for a couple of reasons. 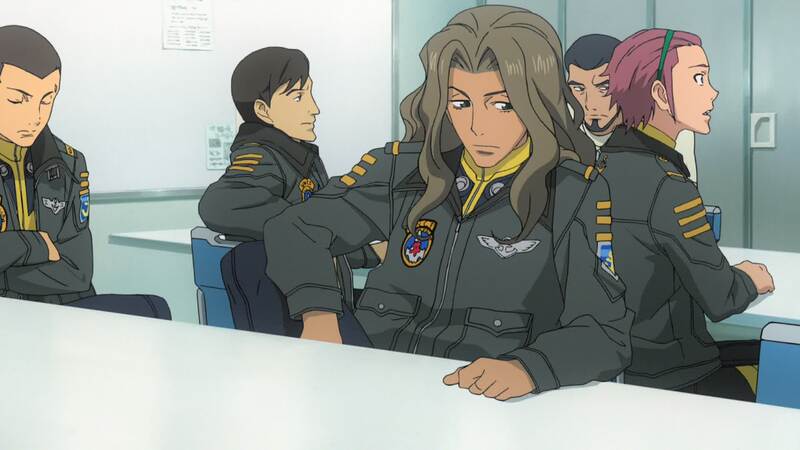 First, a seasoned combat pilot like Shinohara is apparently afraid of heights. Then Melda is absolutely merciless. Guess waiting in line is not something a pure-blooded Garmillan noble takes lightly. Shinohara’s face as he plunges is priceless. 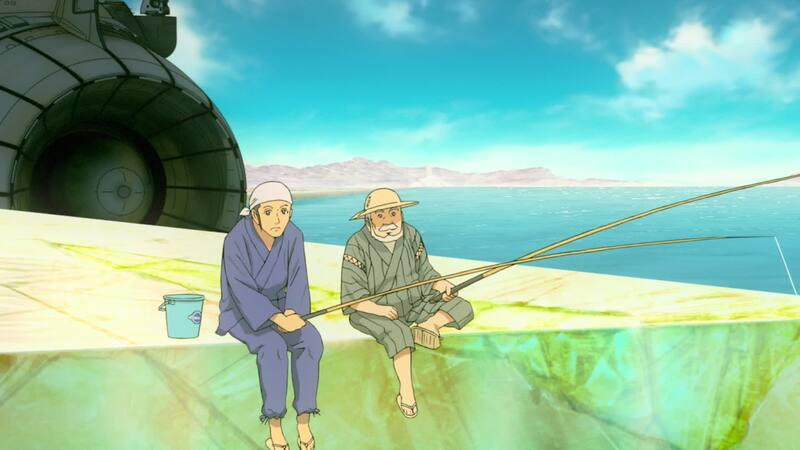 [DG]: Shino’s lucky that the laws of physics don’t apply in anime and/or Iscandar has lower gravity – a fall like that from that height (the catapult from the waterline is at least the same as a 20-meter diving platform) would cause severe spinal and internal injuries which could be fatal. Melda then executes a flawless dive, receiving thunderous applause from growing (male) audience. 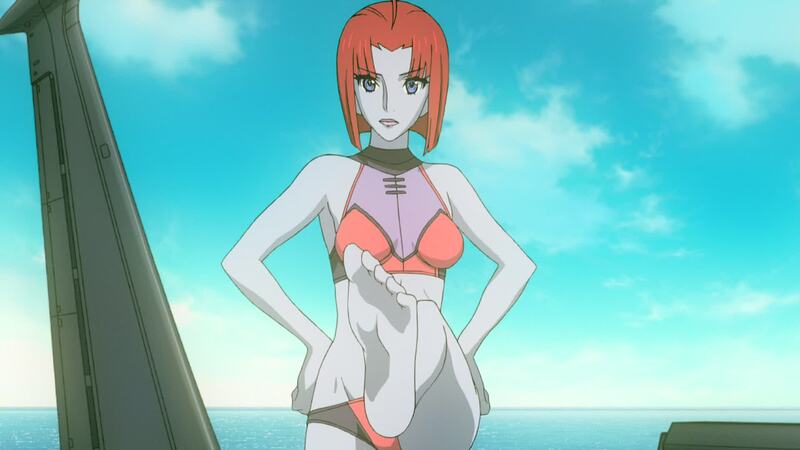 Yamamoto compliments her for her skill, which Melda says is only natural. They swim away, leaving a barely conscious Shinohara floating in the water. 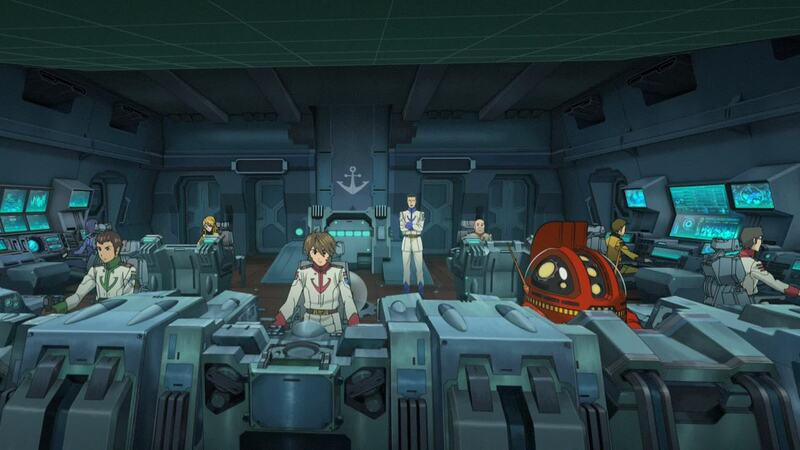 Below the waterline, Enomoto, Ayuto, Toyama and Miyazawa are on duty in bridge three. They spot movement outside and look through the windows. 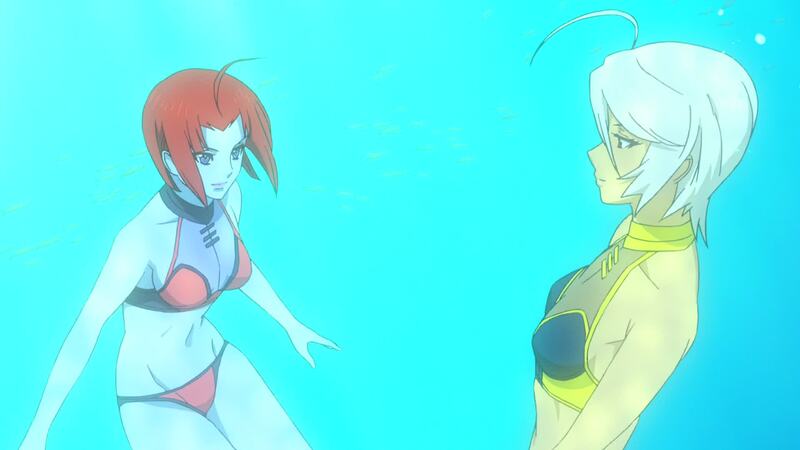 Yamamoto and Melda are swimming around like two mermaids. 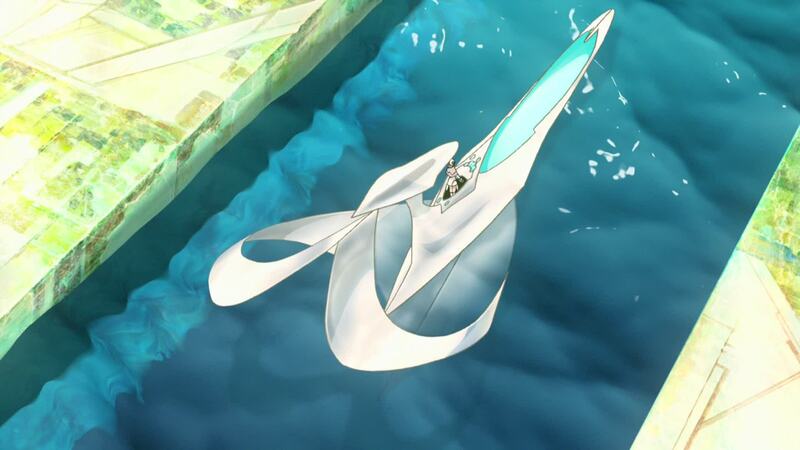 Though the men appreciate the impromptu distraction, Miyazawa just says “guys are stupid.” Outside, the two ace pilots continue their watery flight, displaying as much ability in the water as in the air. [LC]: The fan service is strong in this episode. 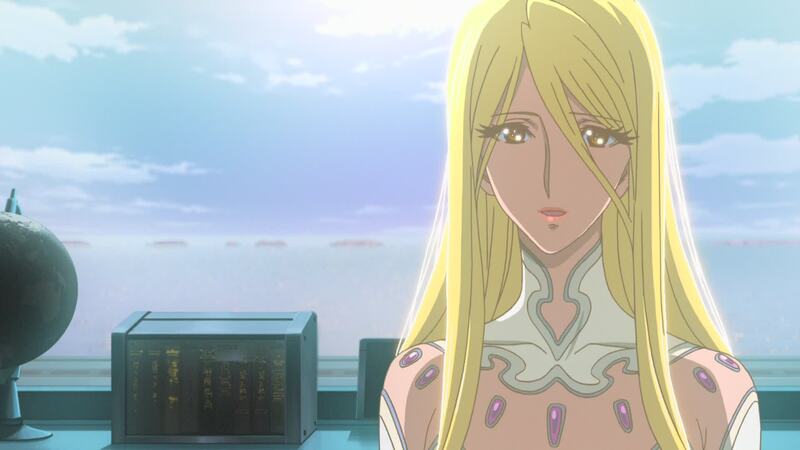 It’s a funny thing that they almost acknowledge it with Miyazawa’s quasi-fourth wall break, addressed to her crew mates and the male audience drooling over this scene. Well played, Miyazawa. Well played. On bridge one, Shima comments on how nice the moment is. 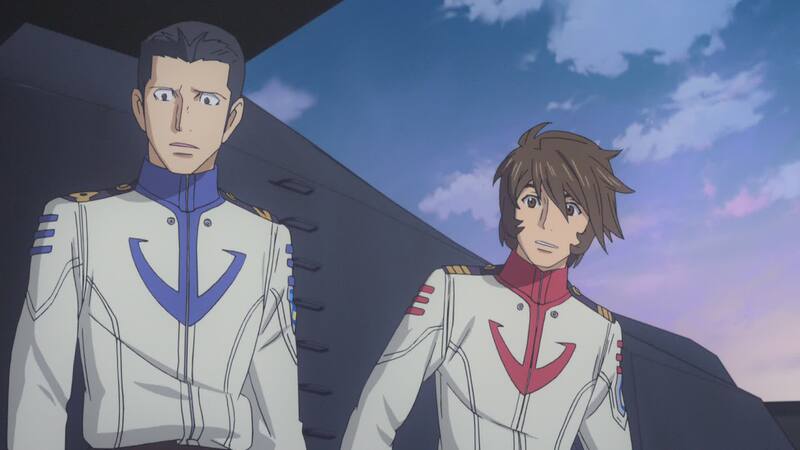 He tells Kodai that ships belong in the sea, and Kodai concurs. Through the windows they see the “seagulls” flying around the ship with the palace above them. Kodai says he’s just not very good with waiting. 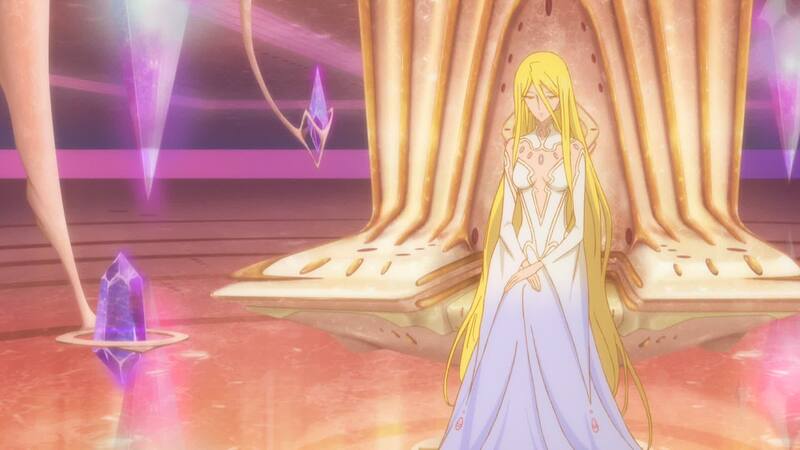 In her throne room, Starsha is in conference with Vice-President Hyss’ hologram. 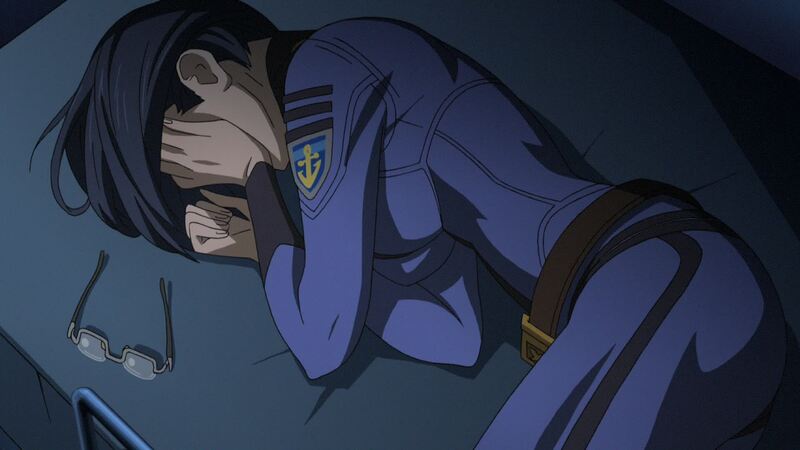 He informs her that Lord Dessler has passed away, a piece of news she receives with a certain sadness. 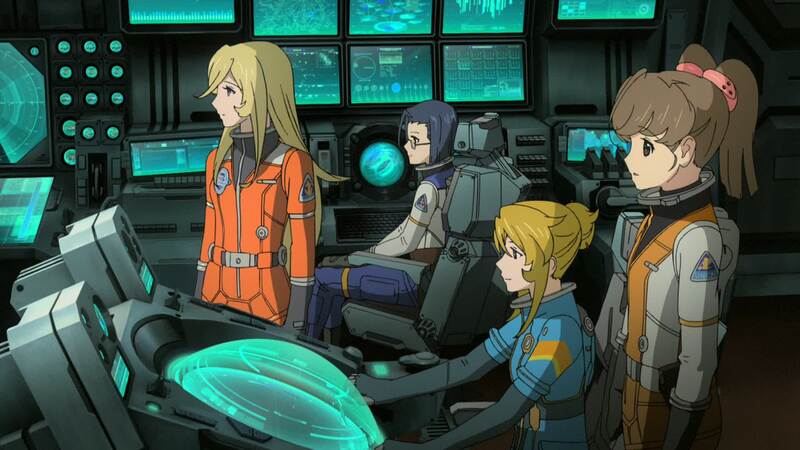 Hyss tells her Yamato saved them, and that they have no further conflict. Starsha says that even if they do not, she does. [LC]: Well, that was quick. They’ve nearly eradicated the human race and irradiated the Earth for what they saw as an act of savage aggression. 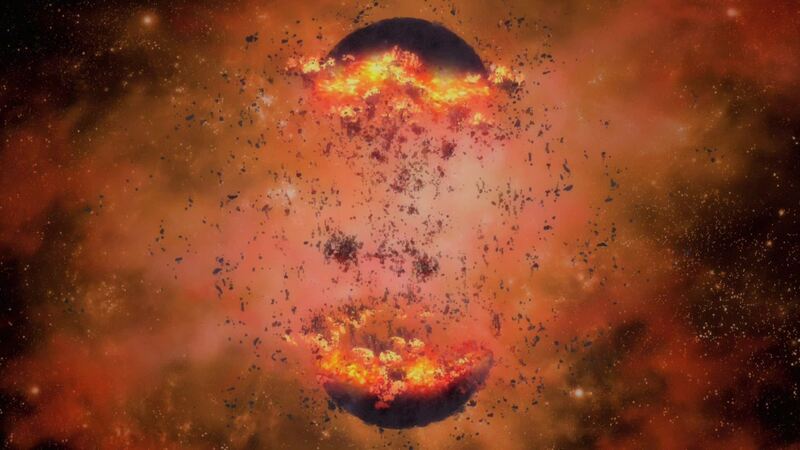 They’ve relentlessly tried to destroy Yamato across 168,000 light-years. 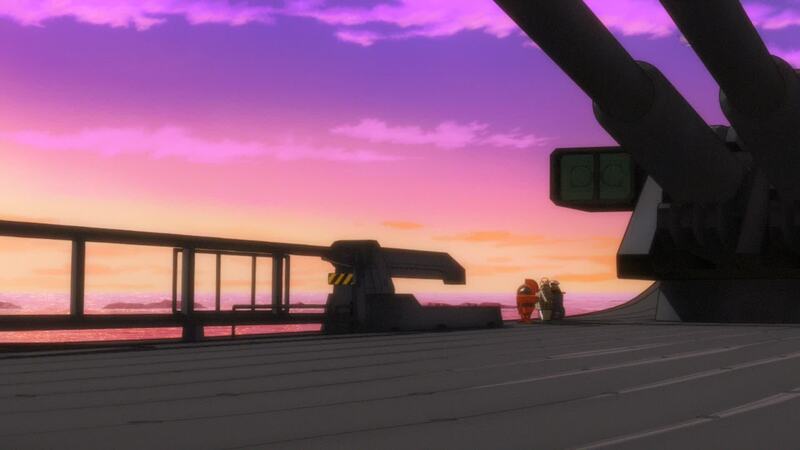 But Yamato blows a city block out of the sky and suddenly all is fine? Sure, that single act did save the capital and its population from certain death, but I don’t think it would be enough to erase everything no matter how grateful they are. [DG]: There’s a number of things to consider here. Firstly, the political situation; Garmillas is in political chaos right now. Hyss has more important things to worry about. Secondly, Hyss is a businessman, not a soldier. Therefore he looks at cost and the priorities differently. 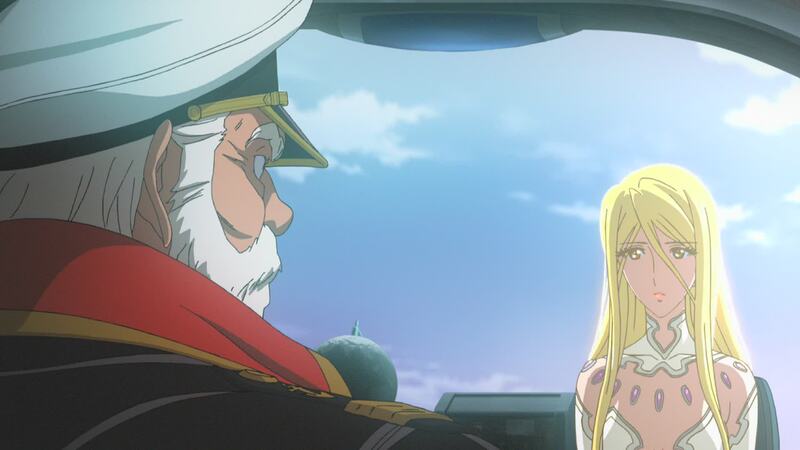 The economic and political cost of pursuing Yamato further, given prior lack of success in defeating her, wouldn’t add up to him. 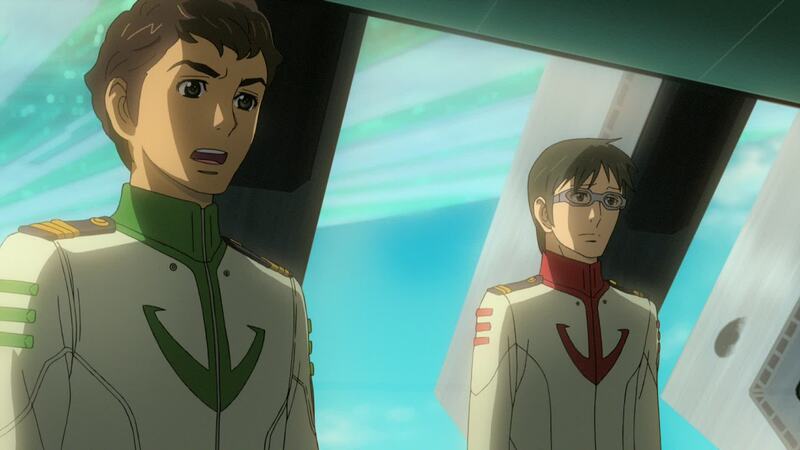 Thirdly, Hyss is probably aware by now that Yamato is there at Iscandar’s invitation. Iscandarians are treated like Gods by the Garmillans. You don’t want to annoy God. There’s a small error here. As we switch from the wide shot to the close up on Starsha, the throne changes. Notice the oval bit right behind her? It’s gone in the close up. This will happen again when Yurisha comes in. He interrupts her, saying that he shall fulfill her task and promises to grant her wish to bring peace to all the planets. He holds out his hand as we return to the present time. 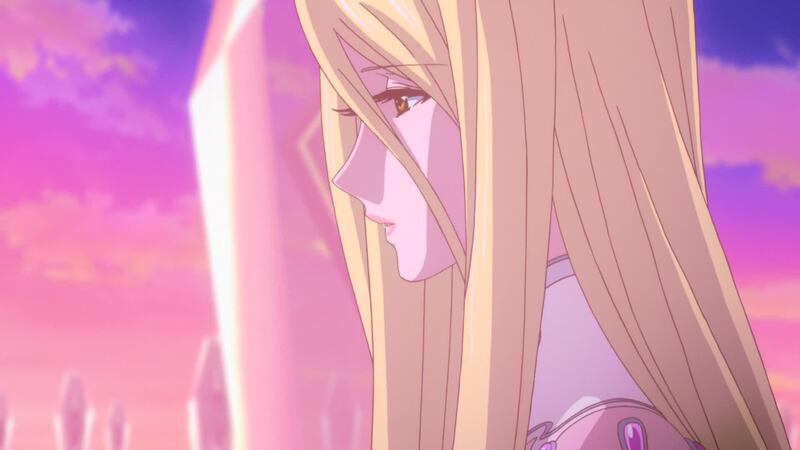 Starsha thinks to herself that even if she saves the humans, they’ll follow the same path Dessler did. [LC]: Here we get confirmation that the bird Dessler had in his chambers, and eventually killed, was indeed Iscandarian. Nobuteru Yuuki made a drawing for a promotion which featured this younger version of Dessler, holding a young Yurisha. You can see it here. Hyss adds that it was the “cannon that uses Wave-Motion Energy” that saved Baleras. Starsha remains quiet for a while, taking this information in. She tells Hyss Iscandar will handle the rest. He salutes her and hangs up. 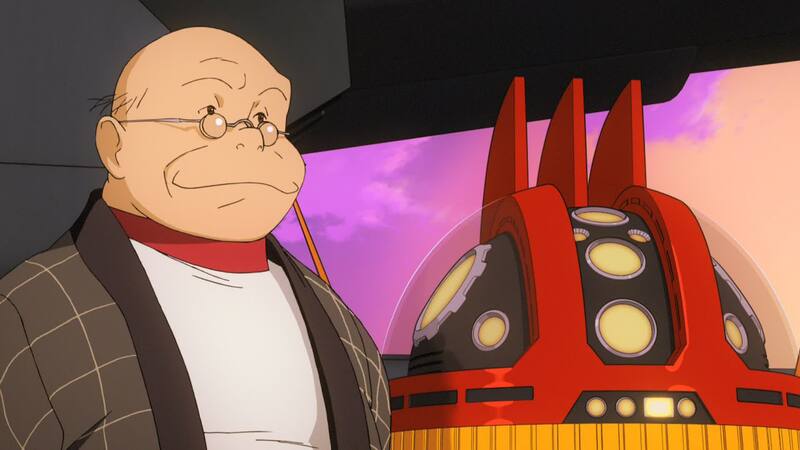 [DG]: A complete 180-degree turnabout – Garmillas no longer has issues with Yamato, and now Iscandar does. 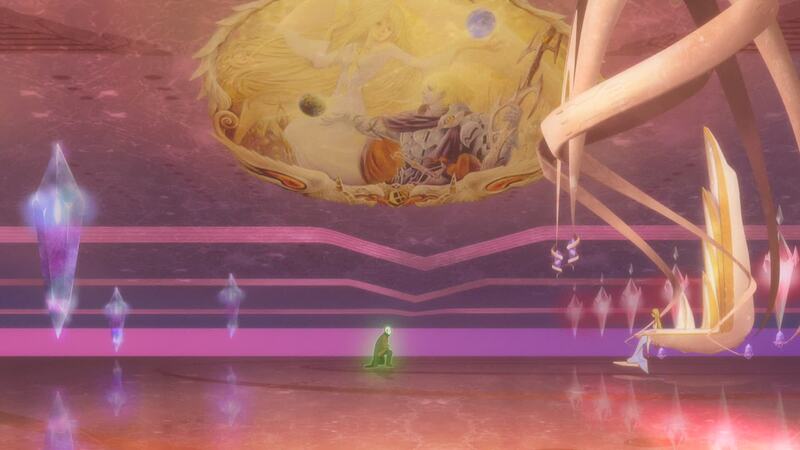 [LC]: Here we see Starsha has a matching painting to the one in Dessler’s throne room. Being that Dessler’s seems to be, as I’ve once called it, “a glorified screen saver” on a video panel, this might actually be the original painting. Starsha sits silently, immersed in thought. The sound of footsteps makes her look up. It’s Yurisha, with an unusually serious expression on her face. She asks her sister to give the Cosmo Reverse System to the Earthlings. Starsha says she’s considering it. See? The throne changes shape again, in the close up. Yurisha says they’re not like the Iscandarians, or the Garmillans. 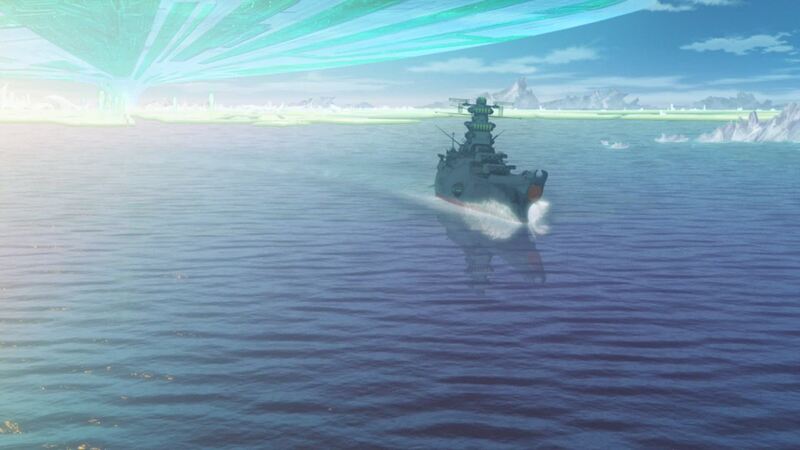 That Yamato used the Wave-Motion Gun in self-defense, in order to survive. 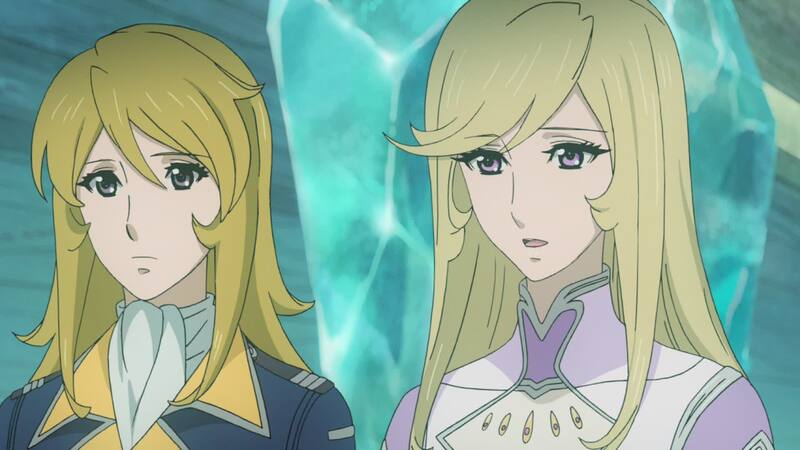 Starsha seems surprised by her sister’s words. [DG]: Does Yurisha really believe what she’s saying to Starsha, given her own experiences on Earth? Or is her memory still fuzzy about those events? The sun is setting over the city. 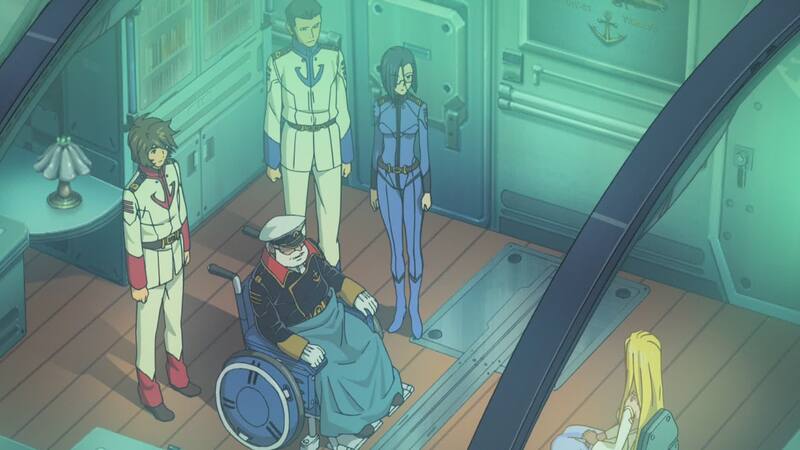 Okita is sitting on a wheel chair on the rear deck, with Sado and Analyzer by his side. He wonders when was the last time he felt the scent of the sea. Sado says he’d like to take that aroma back. Okita says that’s why they’re there. Analyzer says the smell of salt air can be replicated artificially. Annoyed by the statement, Sado tells him he’s a “boring little robot” and that he’ll teach him to drink sometime. [LC]: I never understood the logistics of this. Even if Analyzer has some port through which alcohol can be poured and even analyzed, he is a machine. He can’t appreciate it or get drunk like we saw in the original. In good 2199 fashion, this version of Analyzer relays it as a system error. Always pragmatic, Analyzer states that he cannot drink, as it has a seventy-eight percent chance of causing a system error. Sado says he really is boring. 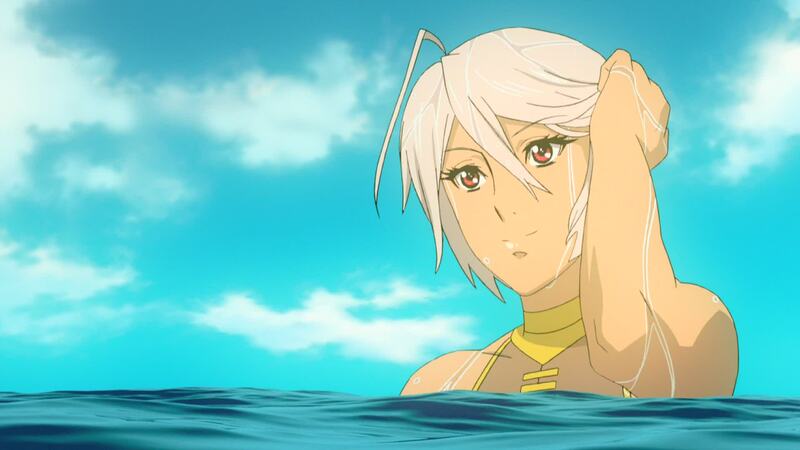 Okita sits quietly through all this, letting the smell of the ocean take him back to better days. Analyzer says it’s gotten cold and that it’s a good night for hot sake. The three remain on deck, watching the sunset. [LC]: This is a strange change of direction. First Analyzer refuses to “drink”, as it will cause a system error. But then he says it’s a good night for hot sake… Of course he can mean it as a suggestion for Sado and Okita. But the way he says it seems to imply he’ll be having it, too. [DG]: I found the statement and its context rather amusing. 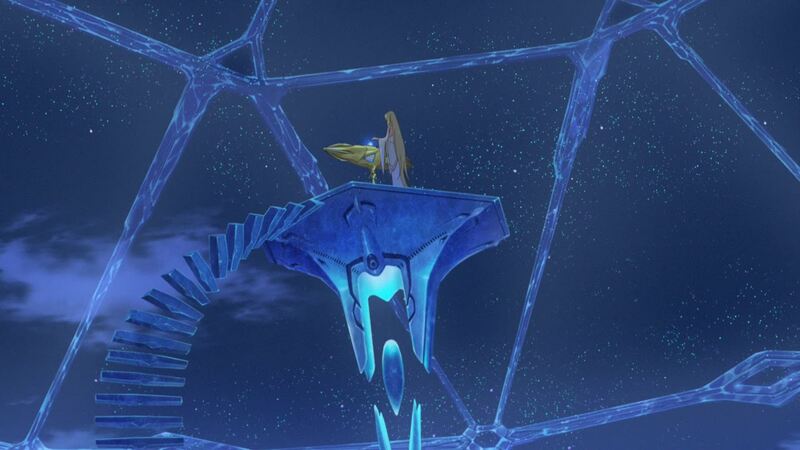 In the crystalline chamber at the top of her palace tower, Starsha seems to be engaged in conversation. But there’s no one in the room with her. In front of her is a strange golden capsule above which hovers a sphere of shimmering light. She says she understands that the Earthlings would not have made it so far otherwise. And that they used the power to save Garmillas, their enemy. But… She stops, almost as if she is listening to someone’s answer. She responds in turn, saying that they have a strong will to survive. She falls to her knees, saying she understands that. [LC]: This scene is interesting. 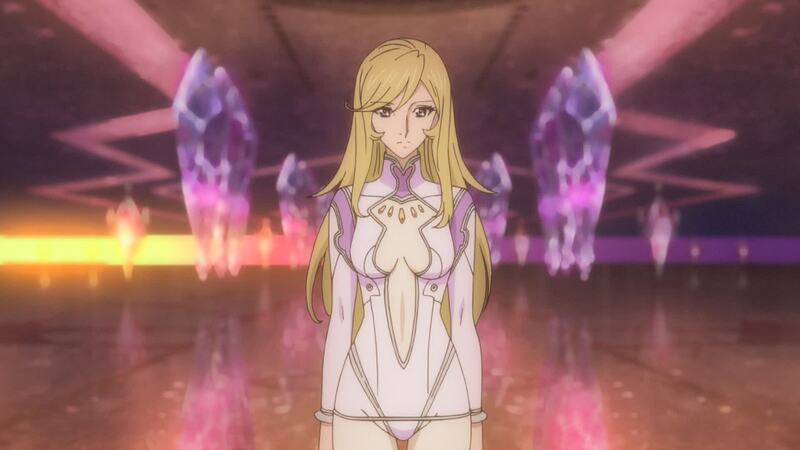 We see Starsha talking to an empty room, with the exception of the device in front of her. We soon realize she is indeed talking to the shining orb. And it’s not just talking. The pauses she makes, and the way she seems to be answering unheard questions, suggest there is an actual conversation taking place. Now… I’m almost certain that any of you reading this have already seen all the episodes at least once, so I don’t think the following comment and those connected to it will be considered a spoiler. And I’m only bringing this up now, ahead of the actual full reveal in episode 26 because it’s too much of a pain to make comments about this orb without just calling it what it is: Mamoru’s soul – or whatever you might choose to call it. His essence, his “elemental form”, whatever floats your boat. They don’t go too far into it in this episode, and the device and Mamoru’s attachment to it won’t show up in any relevant way until Episode 26. But the basics of how the whole thing works are hinted at throughout this episode and the ones following. The hints are so subtle that many interpretations can be made. The one I’ll relay is my personal take, based on whatever data is given or hinted, with an uber-tech approach to it. Yours might be different. Let’s move on and discuss it as details are given. [DG]: Starsha mentions that “she” was there, undoubtedly meaning Kaoru. The next morning, Yurisha has taken Yuki to a field covered in beautiful blue flowers which she says are called Blue Crystals. Yuki wonders if flowers like that will ever bloom on Earth again. 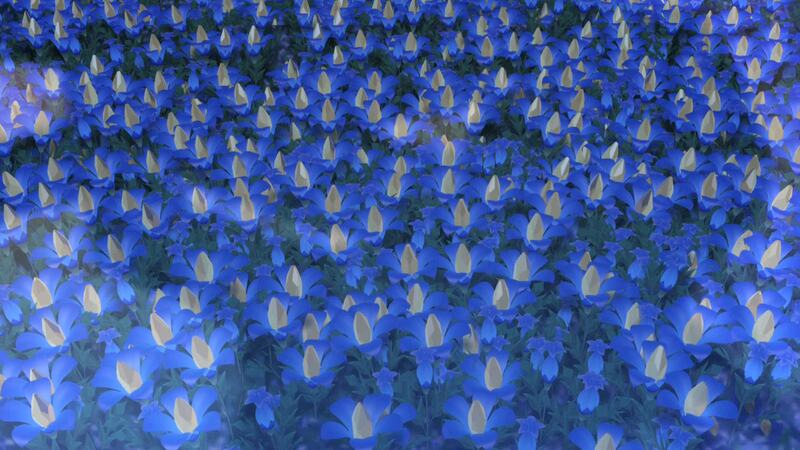 Yurisha says that in the language of flowers, their name means “hidden life” or “hidden emotion”. Yuki is curious and Yurisha explains that, when a planet bears life, its matter and the evolutionary memories of its life forms exist in a Wave-Motion state, beyond time and space. [LC]: You have to admire that they tried to give a quasi-scientific spin to the whole “soul-as-fuel” thing. They don’t go into too much detail, keeping everything on a spiritual plane, grounding it just enough to make the whole thing sound like science beyond our current understanding. The planet’s “element”, matter that contains its emotions, releases those memories. Without that element there, the Cosmo Reverse System could not be completed. Yuki is speechless with this revelation. 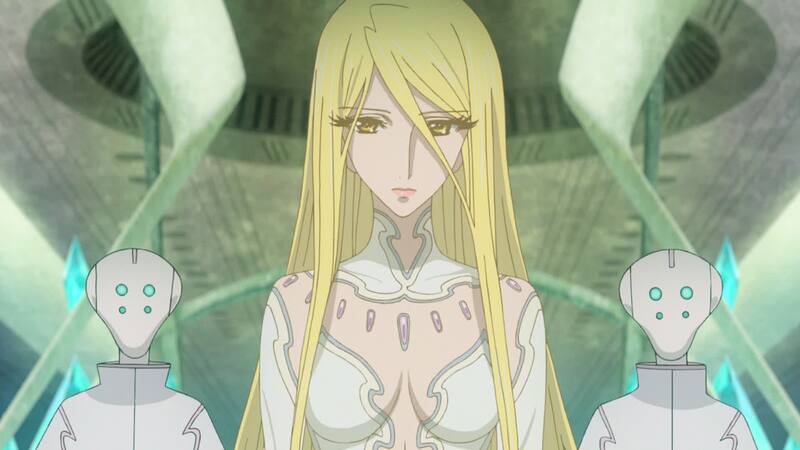 Yurisha continues, saying that the only way to save the Earth was for them to come to Iscandar. And they did, with Yamato. Yuki is astonished by the whole thing. Before she can ask any questions, Yurisha hugs her and simply says “yes”. [DG]: There’s a lot of innuendo and hinting at things about Yuki that still aren’t resolved by the end of 2199, leaving one big ball of unresolved story. What it does seem to partially explain, as Luis alluded to earlier, is how the Cosmo Reverse System works. It requires the memories of someone who knows the planet. Meanwhile, the vagueness of Yuki’s realization only adds to the vagueness of the outcome of her storyline. 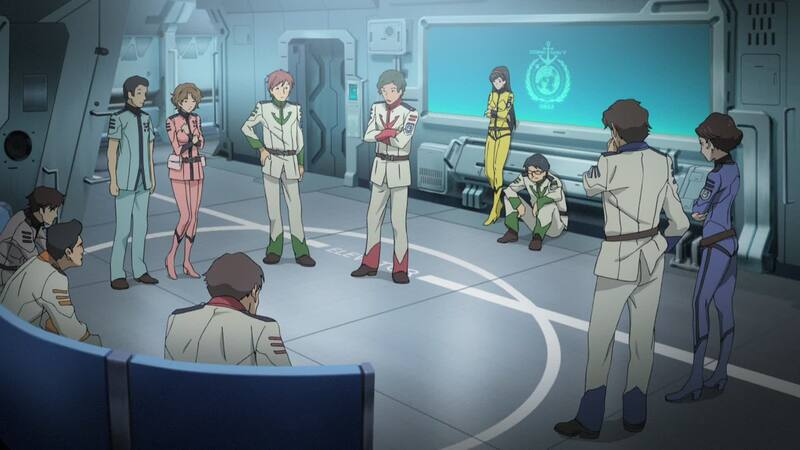 It’s since been mentioned in interviews with staff that this will be redressed in Yamato 2202. We can only hope that will be the case, and something will come out of it. This is my least-favorite subplot of 2199, because there still appears to be no clear answer one way or another. 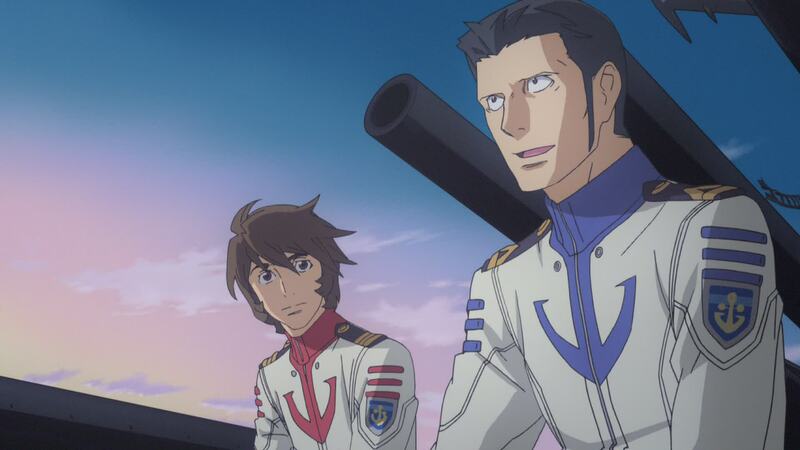 Sanada and Kodai are watching the ocean from the ship’s stern. Kodai wonders how long they’ll be kept waiting. Or if Starsha will even give them the device. Sanada says that for now, they must have faith. Kodai is surprised that such a sentence is spoken by the usually technical and cold Sanada. 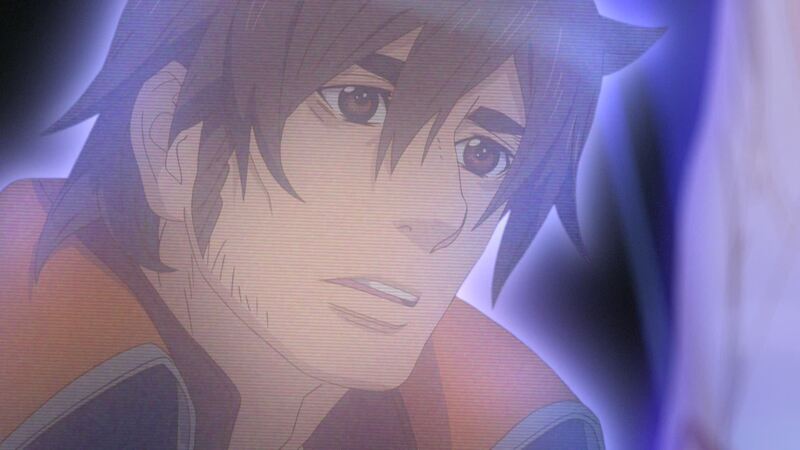 [LC]: It is indeed strange to hear the usually logical and pragmatic Sanada talk about faith. Very off character. A commotion draws their attention. The security guards on the dock spot the small Iscandarian launch approaching. 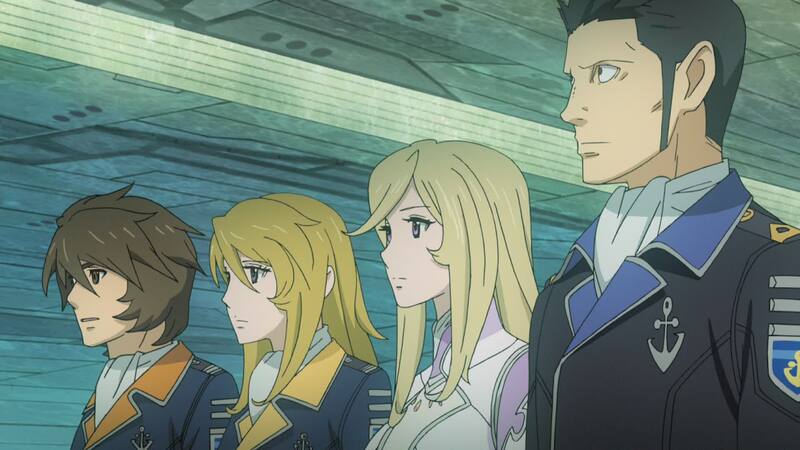 Four Iscandroids exit the vessel and Hoshina asks them what they want. 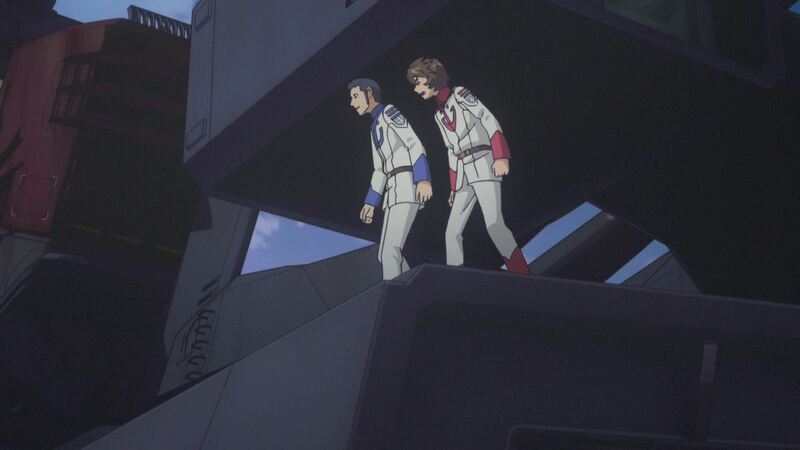 Kodai and Sanada run to the deck overlooking the area. [LC]: Good to see Hoshina back on duty. Last time I recall seeing him was at the end of Episode 22, as the captain addressed the crew before the final warp to the Salezar System. He was still bandaged and in the infirmary. Taking into account that only a couple of days have passed since then, at least from the portrayed events, he recovered more in this short time than in the month since he was injured at the Rainbow Star Cluster. This is the first time we see a female attached to security section. Whether she was part of it from the start or recruited after most of their personnel was locked up (following Ito’s failed mutiny) it’s never revealed. Her name is Makiko Wada. 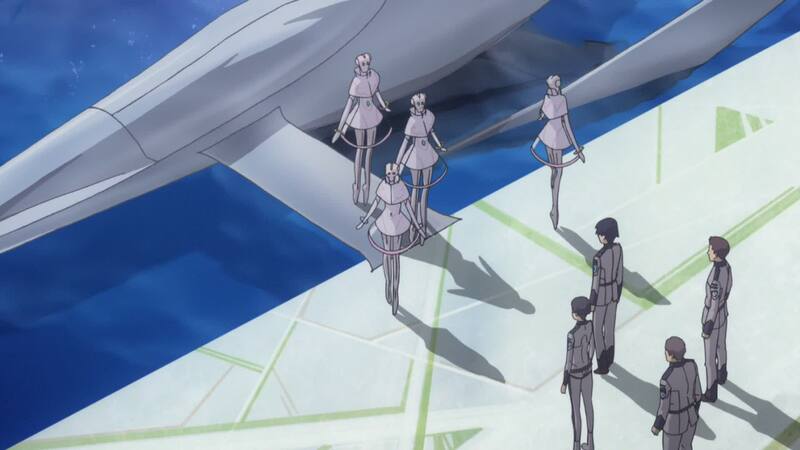 I don’t know if it’s just the way the scene is animated or if it is indeed the way they walk, but the Iscandroids are seen here walking in the tip of their “toes”, almost like ballerinas. 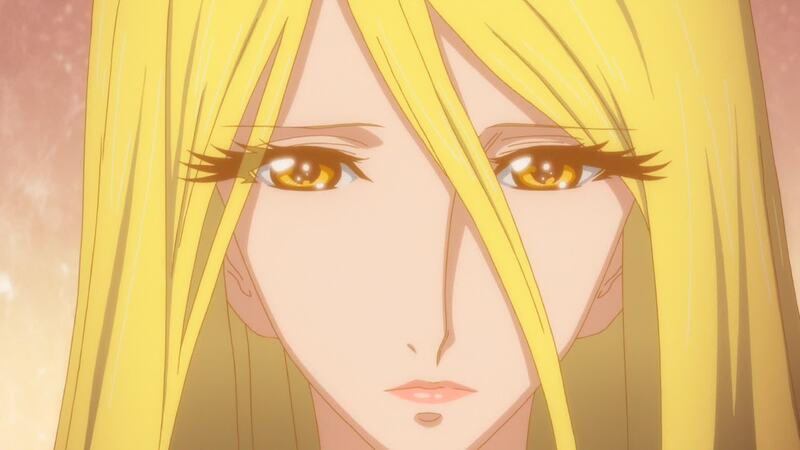 Though the Iscandroids remain silent, a soft voice from within the vessel tells Hoshina there is no need for concern. 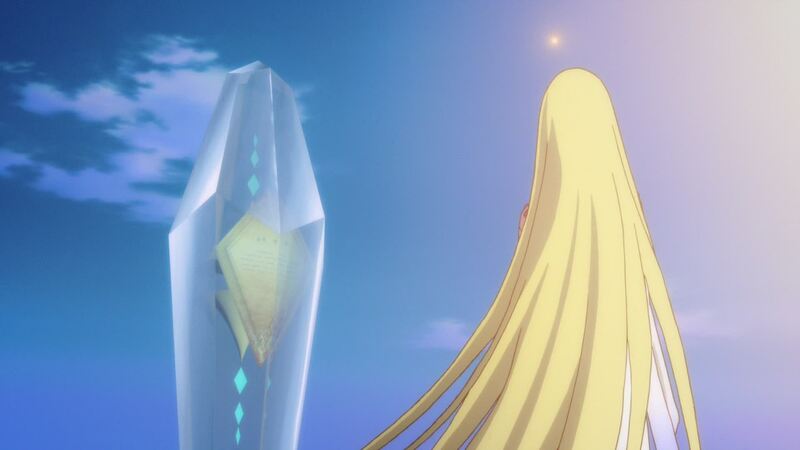 The ship’s dome slides open, revealing the golden object from Starsha’s tower, as well as the queen herself. Both men are surprised to see her, especially when she tells them she’s there to give them the Cosmo Reverser. [LC]: There’s a small animation error, here. 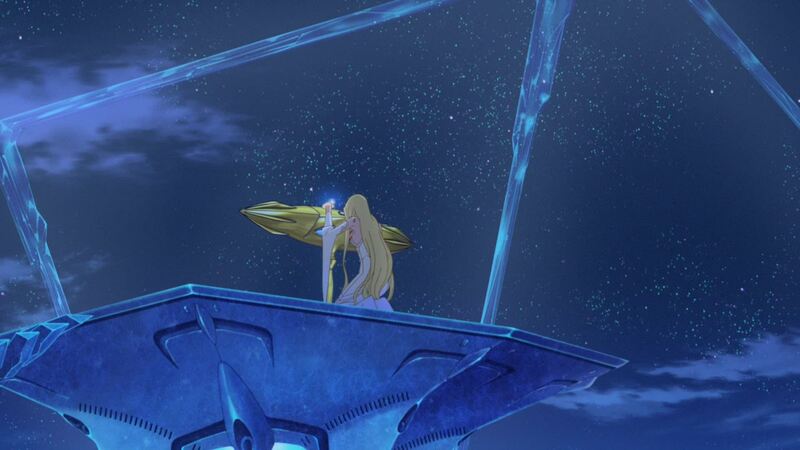 The way the dome opening is animated, it seems way too low for Starsha to be inside, even sitting down. Starsha is taken to Okita’s cabin, where she tells him the same theory Yurisha explained to Yuki. 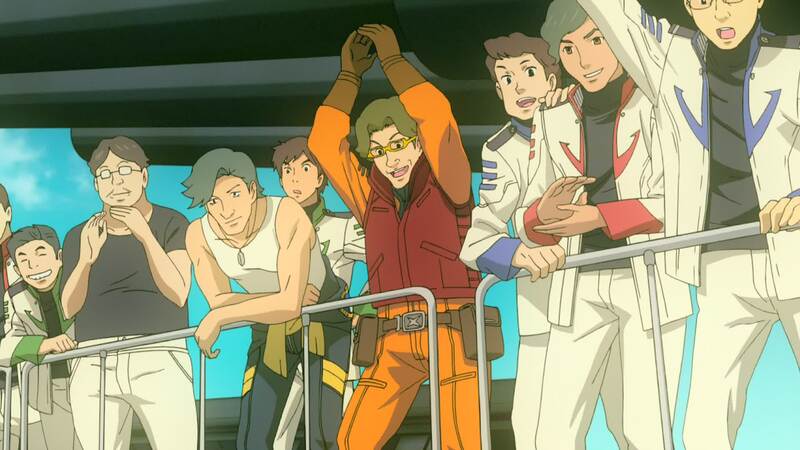 Kodai, Sanada and Niimi are there, too. Okita asks Starsha what is required for use as the “element”. Everyone is surprised when she says it’s Yamato itself. [LC]: This is quite a diversion from the original, where the Cosmo Cleaner D (or Cosmo DNA in Star Blazers) was a stand-alone device. 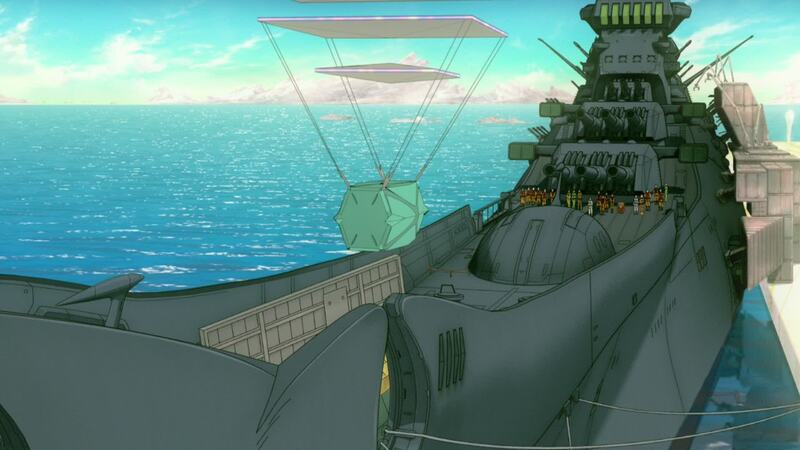 It was delivered to Yamato disassembled and Sanada and his men put it together during the return voyage. 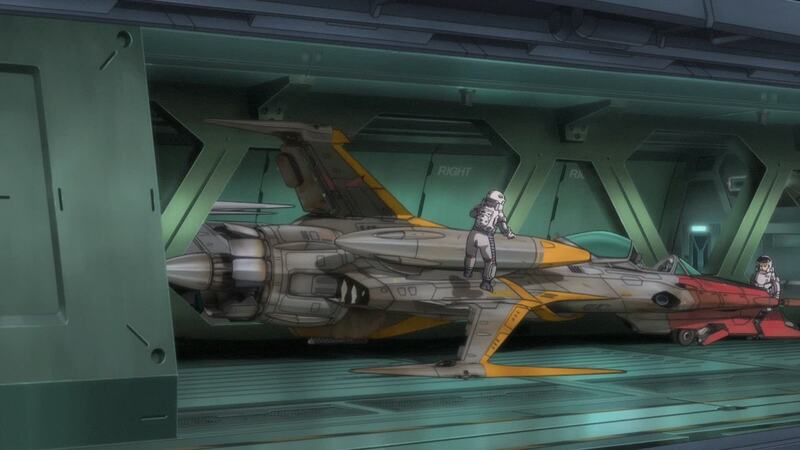 Here, the device will be built into the very body of the ship, making Yamato the actual Cosmo Reverser. 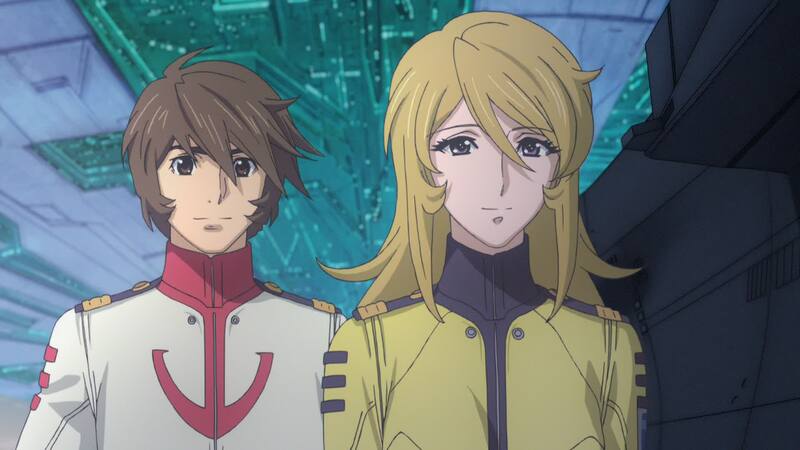 Sanada says that, in other words… Starsha takes his lead and says she’ll remake the ship, and Yamato itself will become the Cosmo Reverse System. Okita agrees. Starsha says she’ll just have to pray she made the correct decision. [LC]: This is where they go slightly off the rails with the whole “element” thing. Either that or we’re just not seeing the point clearly. From what we’ve heard so far, it seemed the “element” would be a soul, something containing the evolutionary memories of the planet that the Reverser is meant to restore. 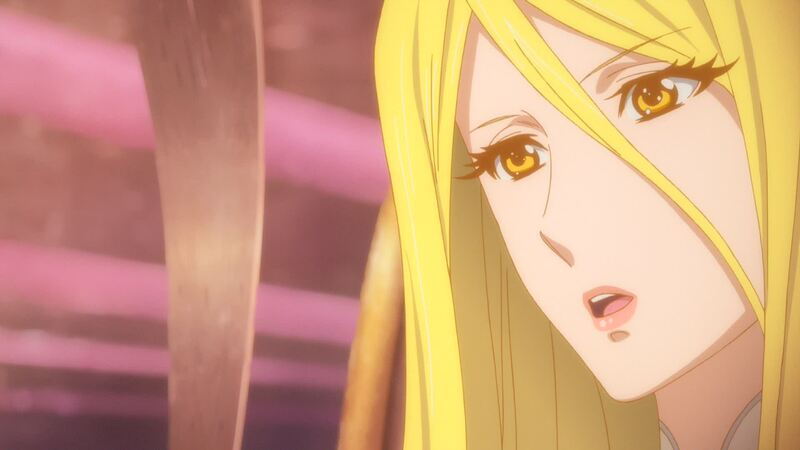 But now, Starsha says the “element” is Yamato itself. Although it is many times said that the ship embodies the spirit of the human race and its will to survive, the ship itself is an object. It has no memory to tap into, though it evokes memories in those that come into contact with it. Okita admits that they took the hand of salvation she offered them and made it into a weapon of destruction, and that they are well aware of the gravity if that deed. More at ease with Okita’s position on the subject, Starsha tells them that what they call the Wave-Motion Gun… Iscandar was the first to make it. Everyone is shocked by this revelation. She tells them that Iscandar once used the gun’s power to stain the Large Magellanic Cloud with blood, and forged a mighty empire. So they know the terror of such a weapon, more than any other. Because of that, they never gave that technology to anyone. [LC]: I never saw this one coming. Never would I have imagined Iscandar as a conquering empire, but also a veritable destroyer of worlds. That’s an impressive display of power. [DG]: I would have loved to have seen what Iscandarian warships looked like. 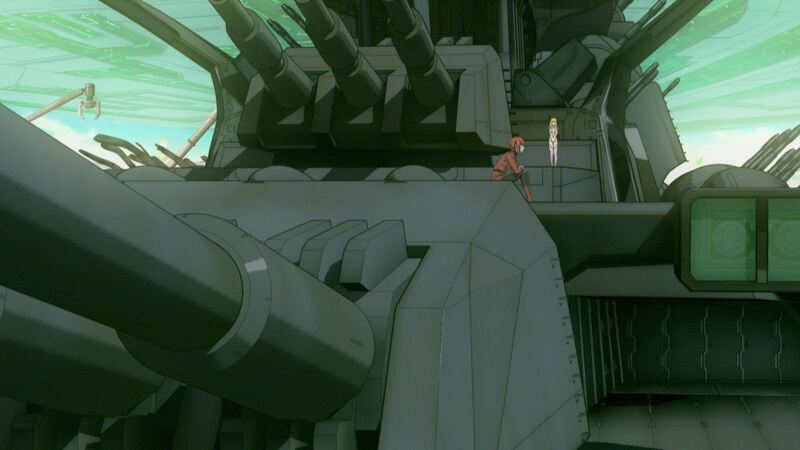 This does take us back to what we said in Episode 23, regarding the power of the Wave-Motion Gun and the Dessler Cannon. The latter destroyed Epidora with a single shot, but we concluded it was due to augmentation by Baleras II’s “firing hammer” system and the power of several reverse-engineered Wave-Motion Cores. 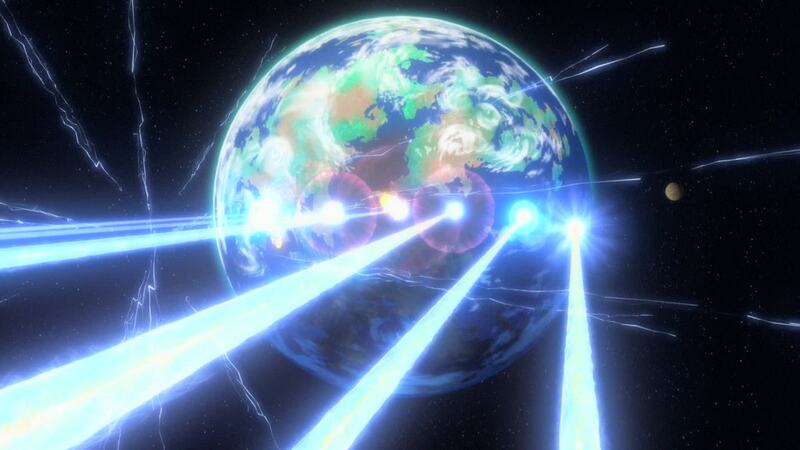 This scene seems to confirm that a “standard” Wave-Motion Gun requires several streams combined to destroy a planet, even those built by Iscandar itself. 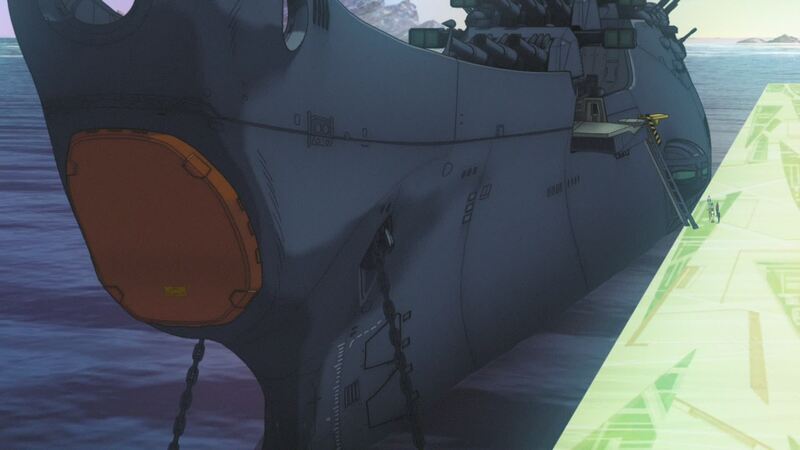 It’s also impressive that Sanada managed to create the gun after only a few months of studying Wave-Motion technology. Our resident genius is truly ahead of the curve. It’s Sanada. I find it difficult to underestimate the man’s genius. 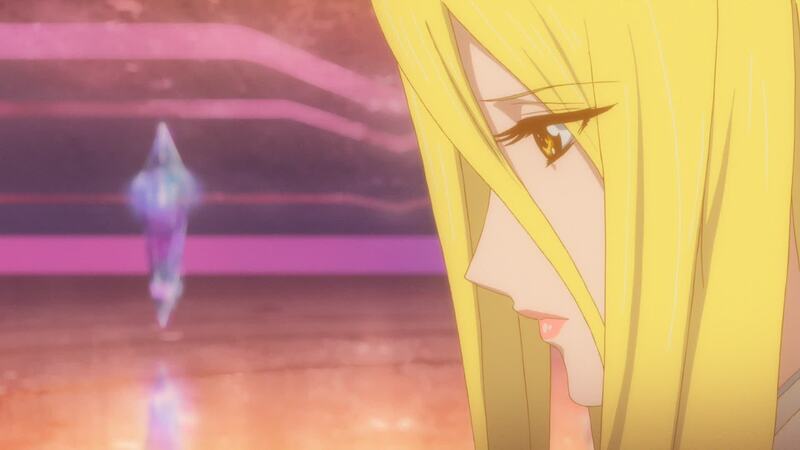 Starsha asks Okita to promise her that they’ll never repeat Iscandar’s foolish act. Okita promises. 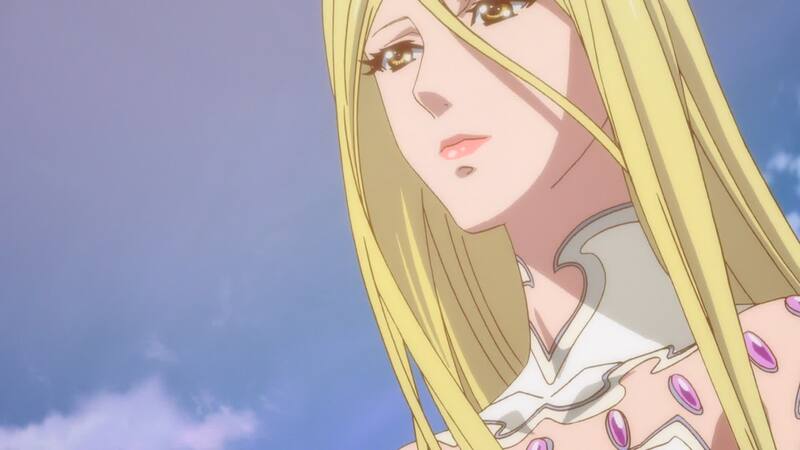 She takes a moment, then looks at Kodai. She confirms his name is Susumu Kodai and asks if she may have a private word with him. [DG]: Starsha looks a little roughly-drawn here. Another casualty of the tight schedule? I’m sure that, if it was up to him, Okita would keep this promise. But given his failing health, we know that won’t be the case. Even if he was in full health and a respected senior officer in the UNCF, it was always doubtful the politicians back on Earth would allow it to stand. 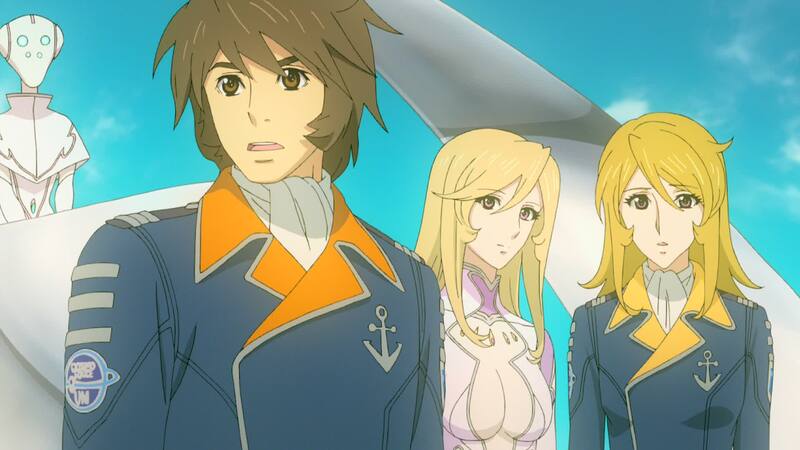 And as we’ve seen from the initial synopsis for the upcoming Yamato 2202, our doubts were well founded. 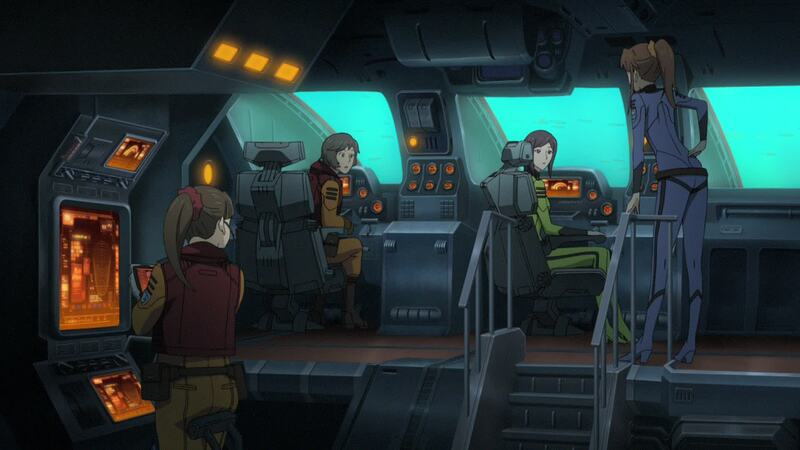 Melda sits atop gun turret number three when Yurisha approaches. Melda asks her where they’ll be going from there. Yurisha smiles but doesn’t respond. A buzzing sound catches her attention. [DG]: Note the melted AAA turret barrels on the port side. 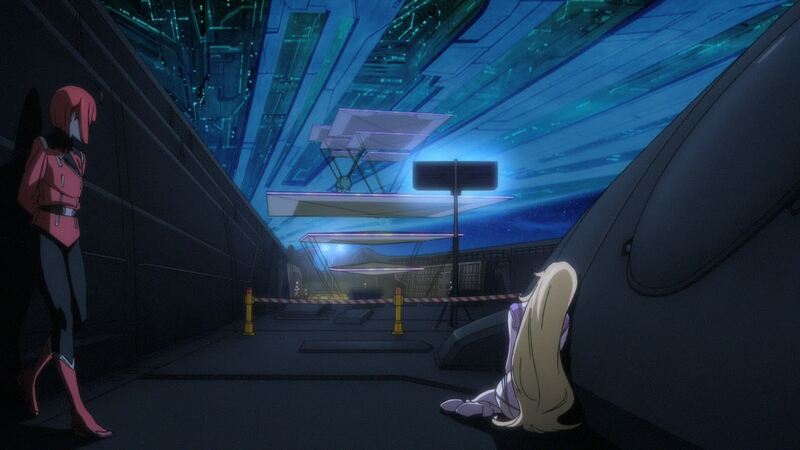 Melda rightfully contemplates the chaos on her homeworld and the direction Garmillas will take from here. 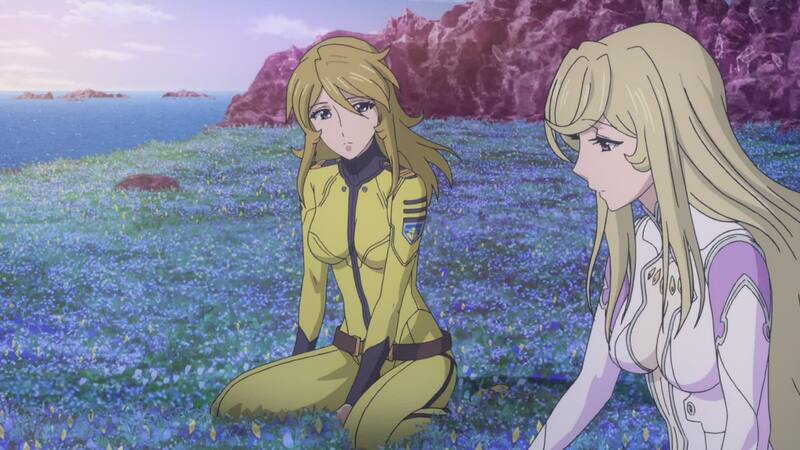 It’s an interesting question, especially in context of the storyline for Yamato 2202. Garmillas has toppled a despot, yes, but is still a military regime, where there could be no end of political infighting and power plays. Dessler is gone and Hyss is considered by many to be a token deputy leader with no military experience. Hyss faces a very tough task assuming the leadership. 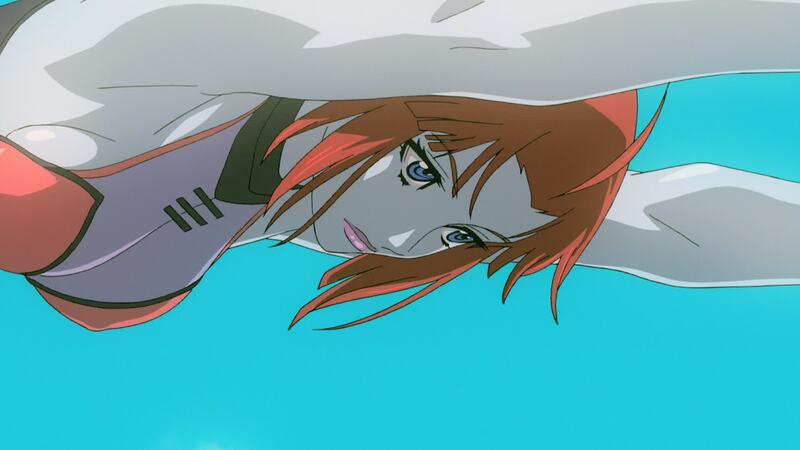 Dessler’s expansionary policty overstretched the military to the point whereby it needs androids, clones, and subjects from captured worlds. 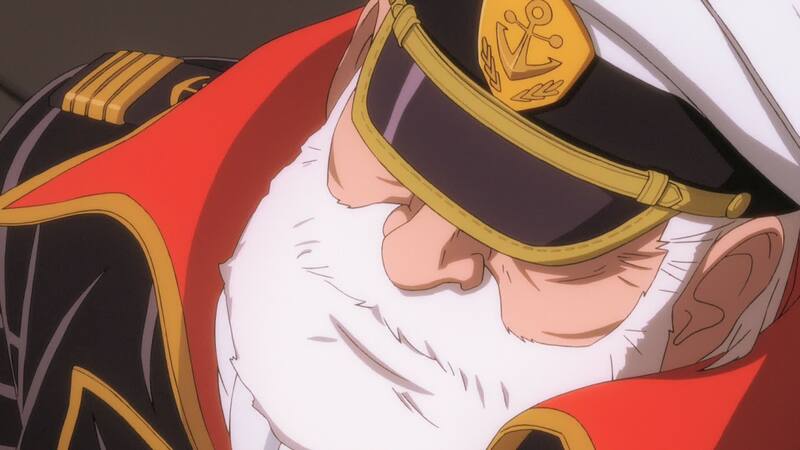 It has suffered serious losses against Yamato. It serves an Empire in which worlds are starting to dissent and object to being ruled. It’s a prime setup for a seamless transition into the Gatlantis War. 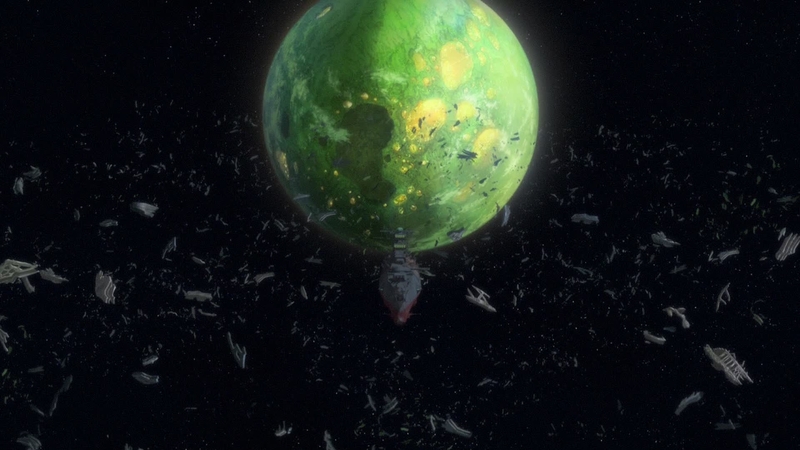 In both the opening minutes of Farewell to Yamato and the first episode of Yamato 2, we see Gatlantis conquering, enslaving, and laying waste to planet after planet. 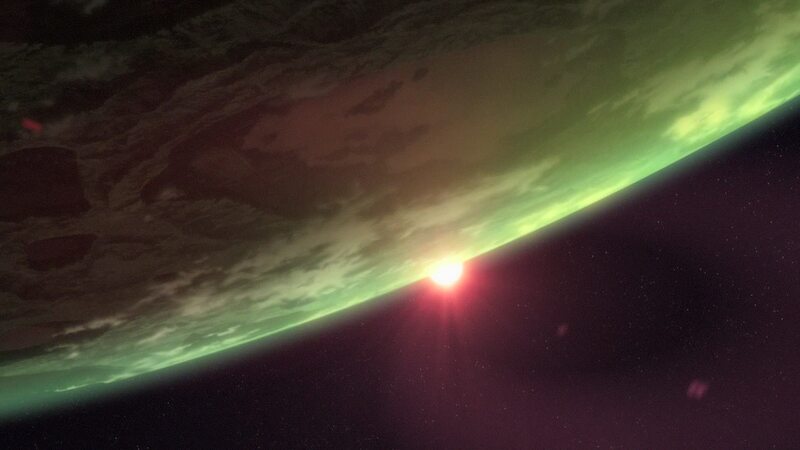 I’m thinking that in Yamato 2202, the planets we see being conquered in corresponding scenes will be outlying Garmillan territory. They’ve already established animosity between the two empires, so it makes sense for it to continue and for Garmillas to be threatened before Earth. Three strange devices approach, carrying containers to Yamato. A large hatch on the bow has been opened to reveal the Wave-Motion Gun control room. Several crew members watch as they lower their cargo. [LC]: As we’ll see in upcoming episodes, the main body of the Cosmo Reverser will replace most of the Wave-Motion Gun’s mechanism. 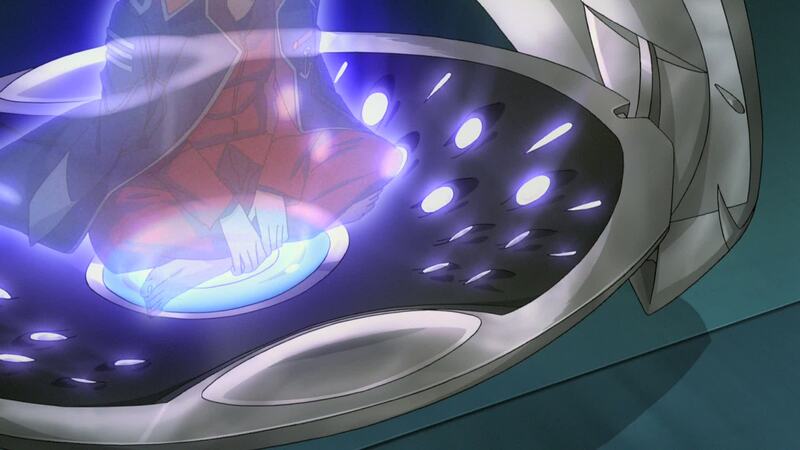 The remaining bits we’ll see are the capsule with the glowing orb and a few other devices placed in the Automatic-Navigation Room, and also the plug that will be fitted to Yamato‘s bow. Also, notice the structure assembled in the port side, where repairs are being made to the damaged sections. They sure built that quickly. Wonder how many days have passed since they arrived? 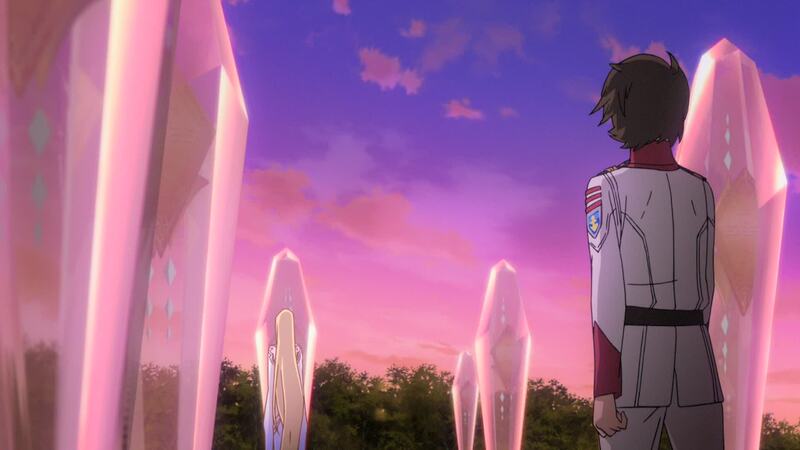 As a new sunset approaches, Starsha and Kodai go ashore into a vast meadow, surrounded by trees and covered by floating crystals. It doesn’t take long for Kodai to realize they’re in a graveyard. Starsha tells him the people of Iscandar sleep below. Everyone is there except her and Yurisha (and Sasha, of course). [DG]: It hasn’t changed from the original that most of Iscandar is dead. But this time there’s no explanation for it, and the gravestones are much more fitting of the Iscandarian aesthetic than the crude headstones in the original Episode 25. She imagines he realized that on his own, once they saw the town. 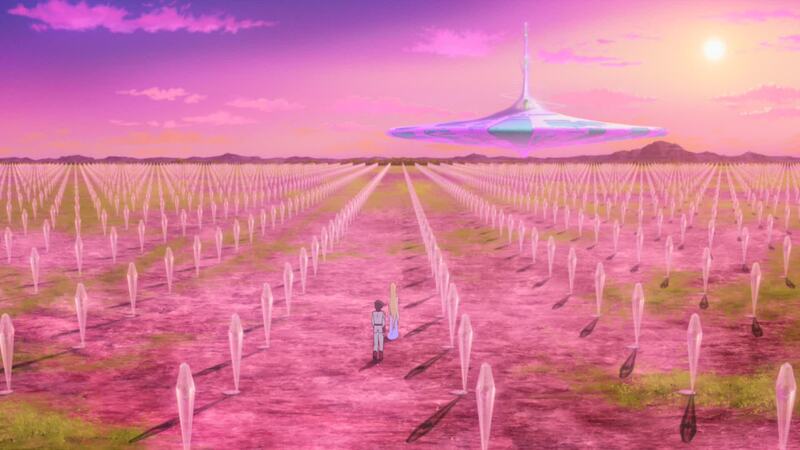 Kodai doesn’t answer, following her past seemingly endless rows of crystals. She tells him no other planet needs to suffer such sadness. Starsha finally stops next to a group of crystals. 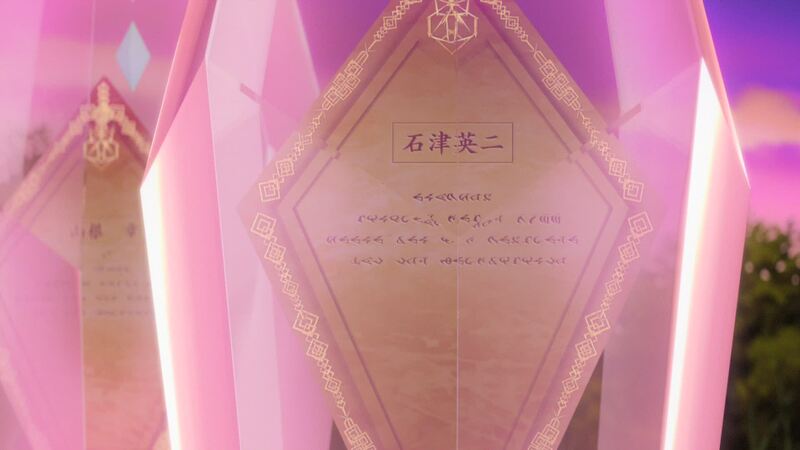 These are different, the inscriptions in them written not just in Iscandarian… but Japanese. As Kodai approaches and reads the one in front of Starsha, he freezes. His feet firmly anchored to the ground, his body rigid in shock and disbelief… His eyes, wide open, are fixated on the name inscribed within the crystal. “MAMORU KODAI”. 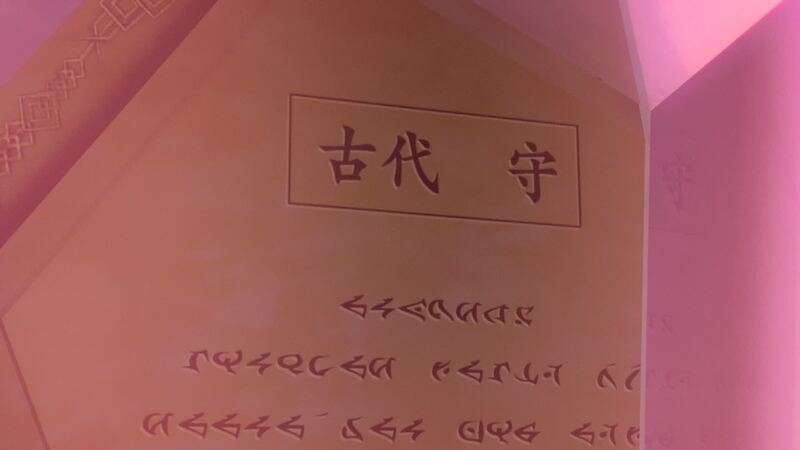 [LC]: Although they refer only to Mamoru in this episode, the names of Yukikaze‘s crew are seen on other crystals, indicating he wasn’t the only one being brought to Garmillas. But he must have been the only one to survive Operation M.
[DG]: Did Kodai even see Eiji’s grave there? You would think not, or else he should have been surprised to see the name of another Japanese person on Iscandar. Maybe he saw them, it just didn’t click in his mind until he saw his brother’s name. 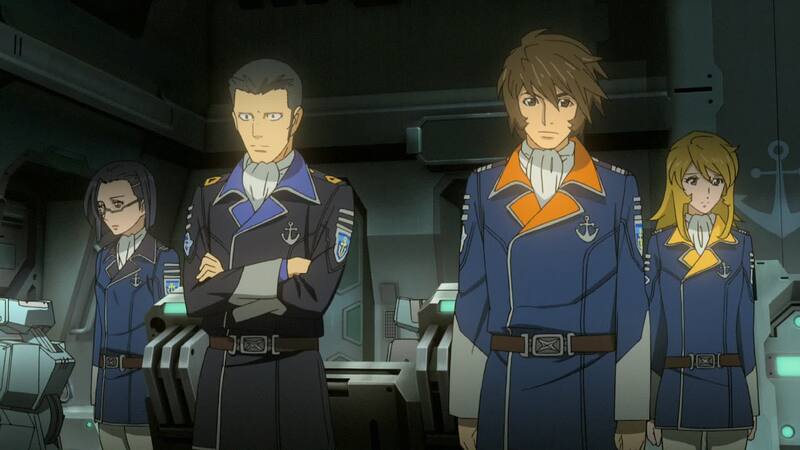 For those who don’t remember, Lt. Eiji Ishizu was Mamoru’s XO and featured heavily in the opening scenes of Episode 1. 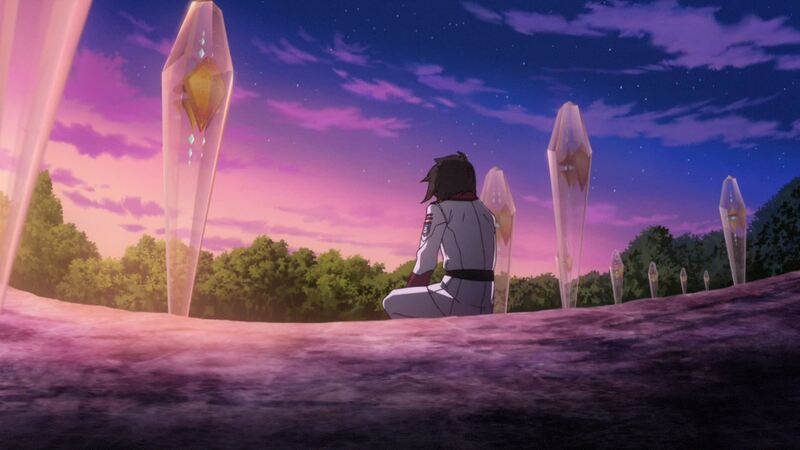 As for Kodai noticing the other graves, he gives them a surprised look, as if wondering why there are japanese names on an alien planet’s tombstones. And I doubt he would know his brother’s crewmen by name. [DG]: Ishizu’s is the only one listed in subtitle. We see one other Japanese name behind him that isn’t Kodai’s. 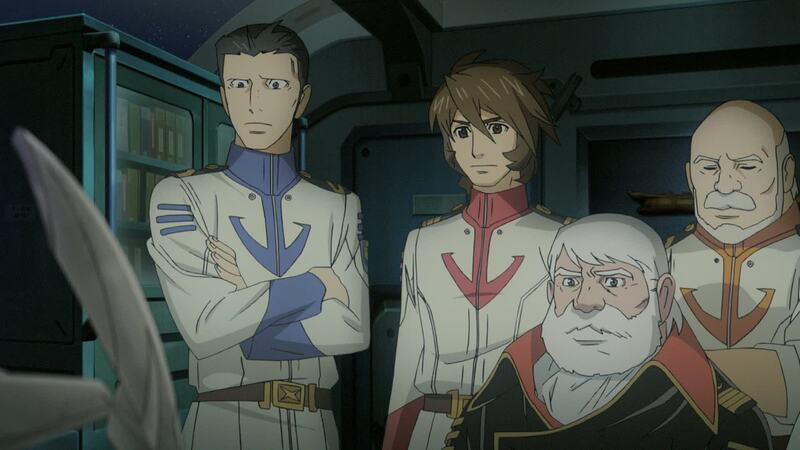 Can we assume that these three were the only crew who made it? He asks her why his brother’s name is there. 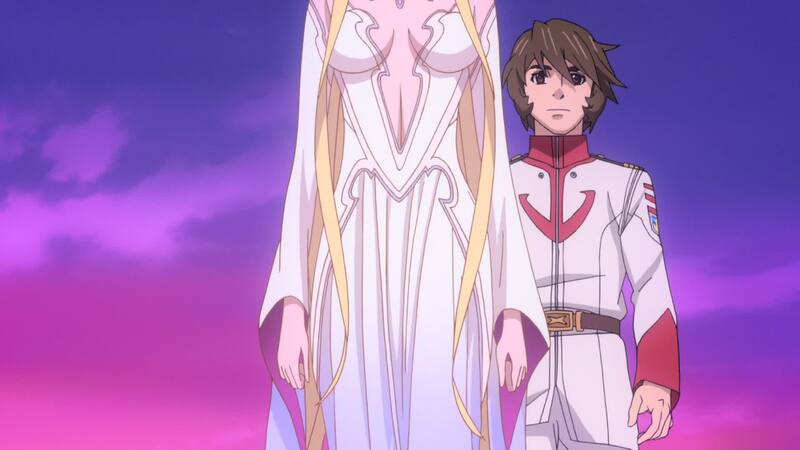 Starsha reveals that Mamoru was on board a Garmillan prisoner transport ship that crashed on Iscandar. He was being carried to Garmillas as a bio-sample of humanity and was the only survivor of the crash. 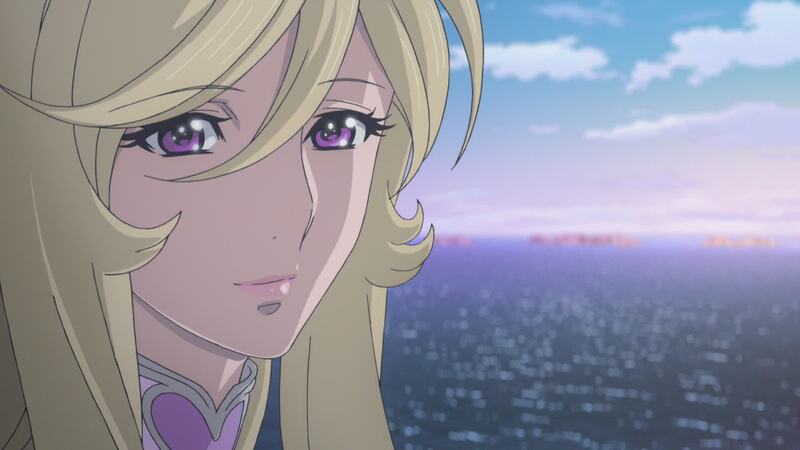 She rescued Mamoru and managed to hide him from Garmillas, but his injuries were severe and he eventually died. She laments that, in the end, she couldn’t save anyone. Kodai understands. [LC]: Mamoru’s death is a huge divergence from the original. As you may recall, he had a tearful reunion with Susumu and later with Sanada and Okita himself. He ended up staying on Iscandar after Starsha confesses her love for him. He went on to have a child with her as seen in The New Voyage. 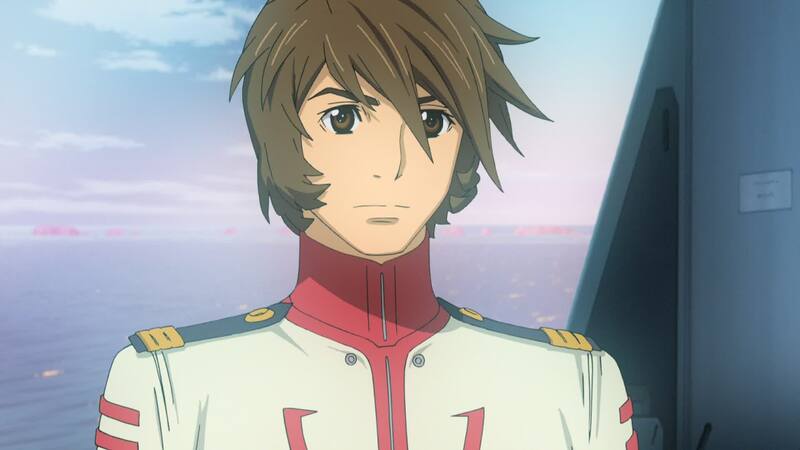 Both he and his daughter, Sasha, eventually died in Be Forever Yamato. To this day, I still hate the way he went down, basically as a suicide bomber. 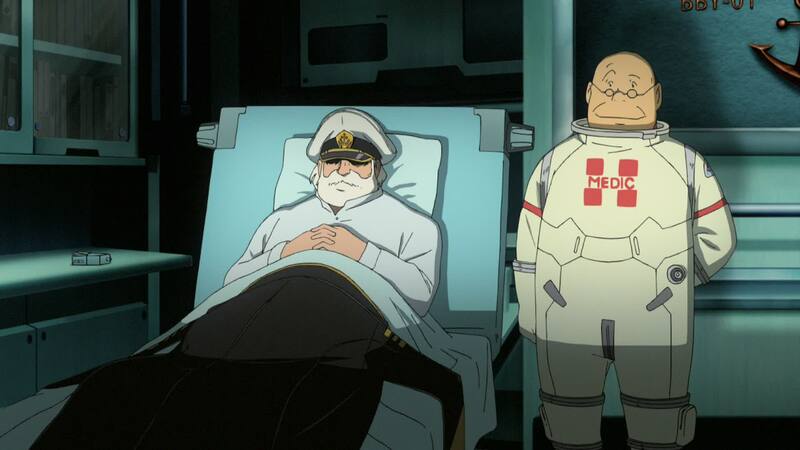 He did save Commander Todo’s life in the process, but he could have been so much more. Killing Mamoru here serves the aforementioned purpose of serving as the “fuel” for the CRS and a plot point for all the drama that will ensue in Episode 26. It cuts down his role considerably, but ultimately I prefer how this version of the story plays out. 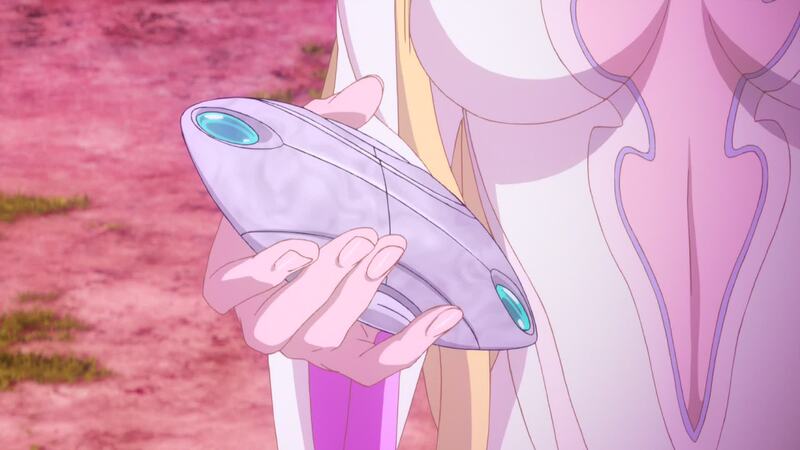 Starsha holds out a small silver device, much like the one carried by Yuki, and gives it to Kodai. 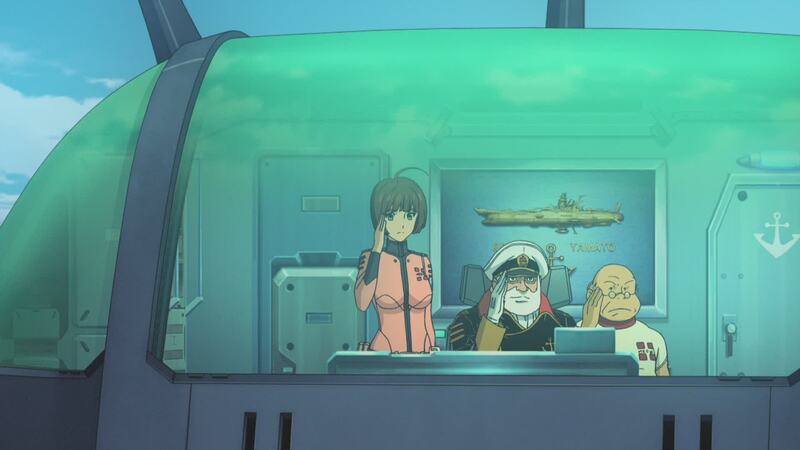 Later, the message within is played aboard Yamato. 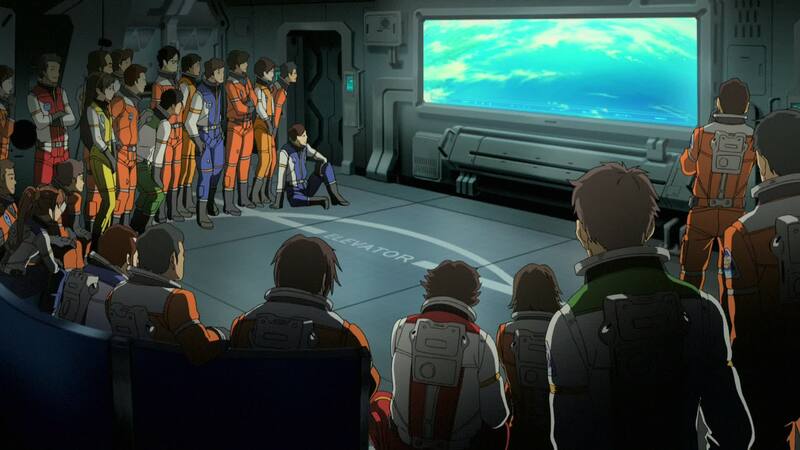 Kodai, Okita, Sanada, Tokugawa and Sado watch the hologram, but the audio is relayed to the whole crew through Radio Yamato. 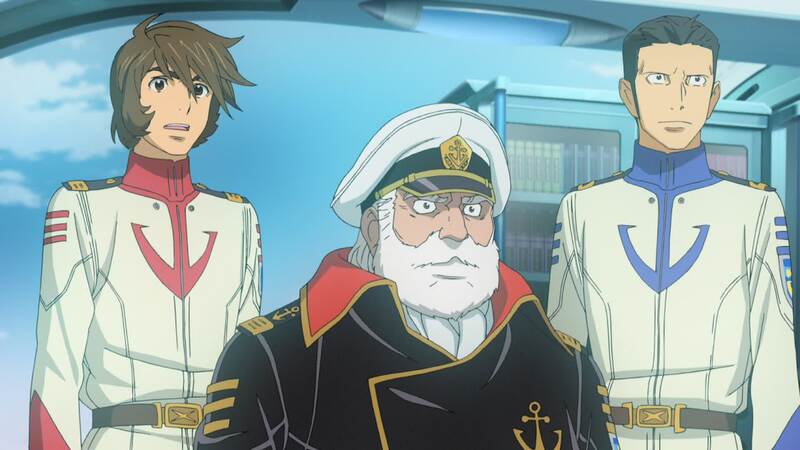 Mamoru presents himself as Captain of the Cosmo Navy Destroyer Yukikaze. He tells of how he was captured by Garmillans and transported as an experimental sample. When the ship crashed, he was saved by an Iscandarian woman. She told him that a ship from Earth was heading there. He wishes he could return to Earth with them, aboard their ship. But it appears he won’t last that long. 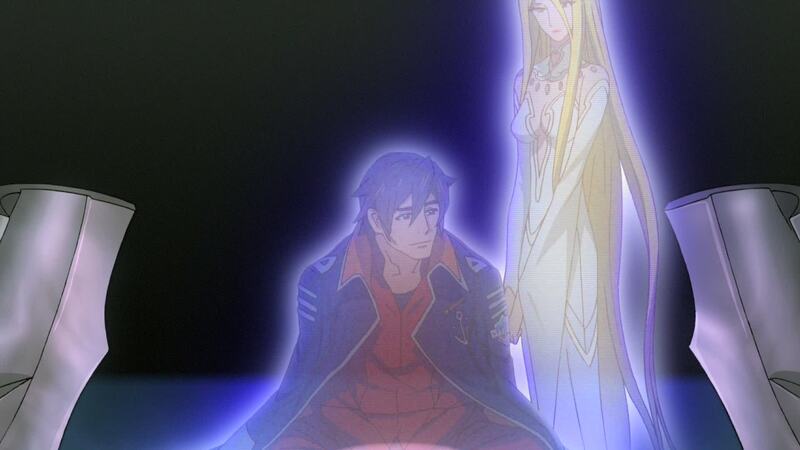 [LC]: There’s a curious edit in this very first shot of Mamoru’s hologram. Just as his face is about to come into frame, they cut away to Shima and Yuki listening to his message. They take their time on the pan up and it just seems wrong to leave the poor guy’s head out of it. [DG]: A few things here. 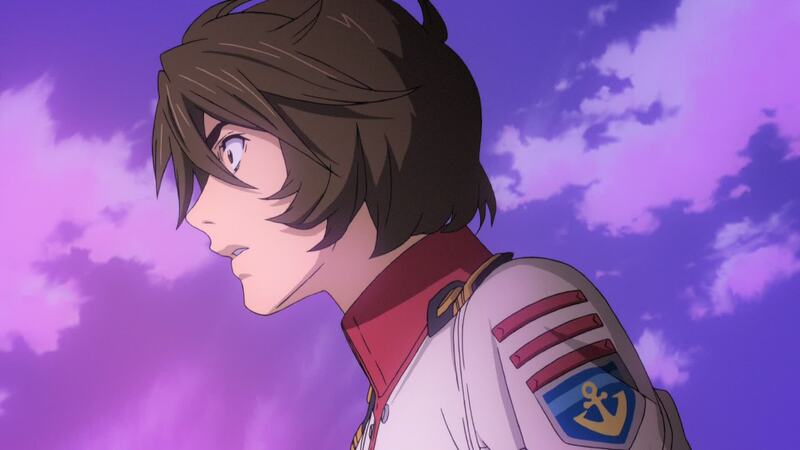 First, Mamoru’s words suggest that he was surprised to learn that an Earth ship was headed to Iscandar, meaning that he wasn’t on a need-to-know level regarding the Yamato project. Of course, he didn’t know that Operation M was a suicide mission either, so this adds up. If, as Okita said in Episode 2, Mamoru had been slated for the Tactical Officer’s seat, you’d think he would have been scrubbed from Operation M – and perished with the rest of them in the ground attack. The only way it makes sense would be if Mamoru had been the backup for the Tactical Officer that perished in that attack. Second, for someone who is so severely injured or ill that he can’t be saved, he’s sitting amazingly upright. Better not even mention other physically demanding “activities” he supposedly had to go through in this version! (You know what I’m talking about!!!). 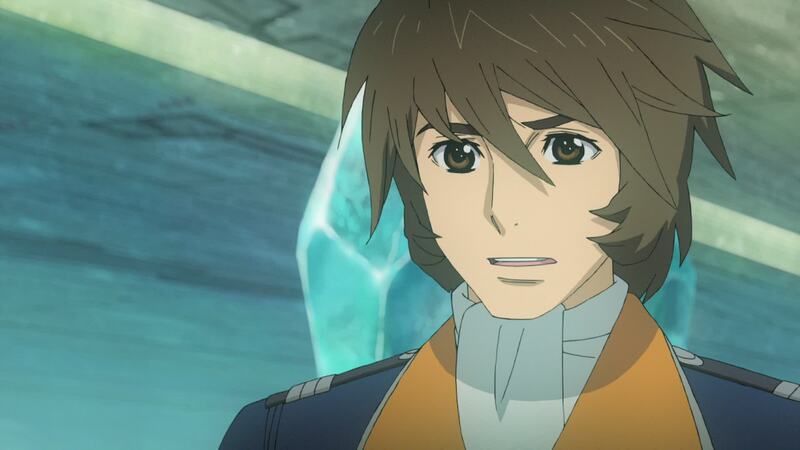 Third, this is Mamoru Kodai, who was always stupidly self-sacrificing in the original – to the point where he appeared to have died (original series), and finally actually did die (Be Forever). It’s not beyond the realm of possibility that his wounds weren’t fatal. Maybe his sense of self-sacrifice for the greater good meant that he sacrificed himself for sake of the CRS. To me, there is a reasonable degree of logic to this. You’d think that a civilization capable of building a machine to restore a planet’s ecosystems would be able to heal physical injuries. One other possibility is that maybe Garmillas had already started experimenting on him during the trip from Enceladus, and he’s infected with a disease too advanced for Iscandar to cure. Of course, given that Starsha and Yurisha are the only remaining living Iscandarians, perhaps medicine has never been their strong suit. Everyone listens to Mamoru’s words in solemn silence, touched in some way by his words. His message hits very close to home. In Yamamoto’s case, not only because of those she lost but because she probably knows what Kodai must be feeling right now, listening to his brother saying goodbye – something she never had. Even Melda and Yurisha listen intently on the exterior deck, watching as more parts are brought for the Cosmo Reverse System. Mamoru wishes to say two things to the crew before he dies. The first is that they can come to an understanding with the aliens, something he learned since he arrived. He looks complicitly to Starsha as he says that. [DG]: If only Mamoru knew that his little brother was ahead of the curve at that point. He hopes they don’t forget it. 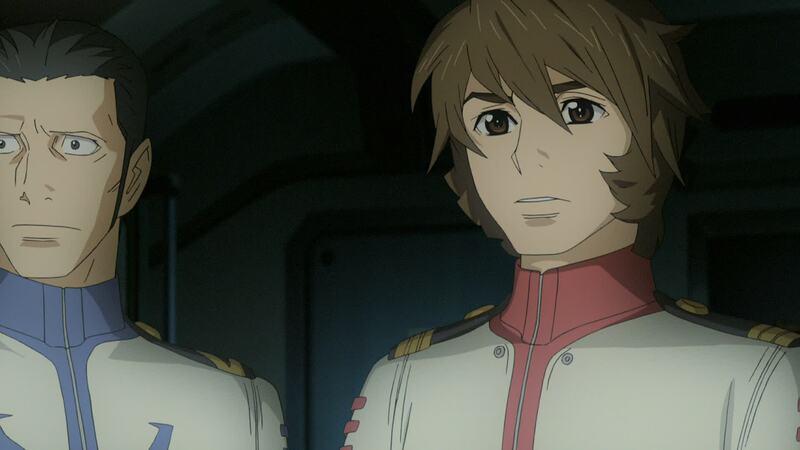 The second is a message for his brother, Susumu… Kodai shudders at the mention of his name and as he listens to his brother’s words. “Susumu, live for me, as well! 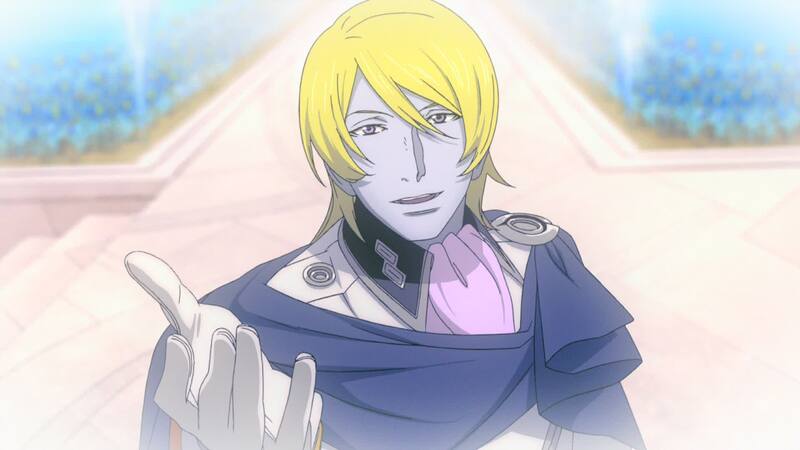 Live, and see the Earth when it’s become blue once more!” Kodai nods in agreement. 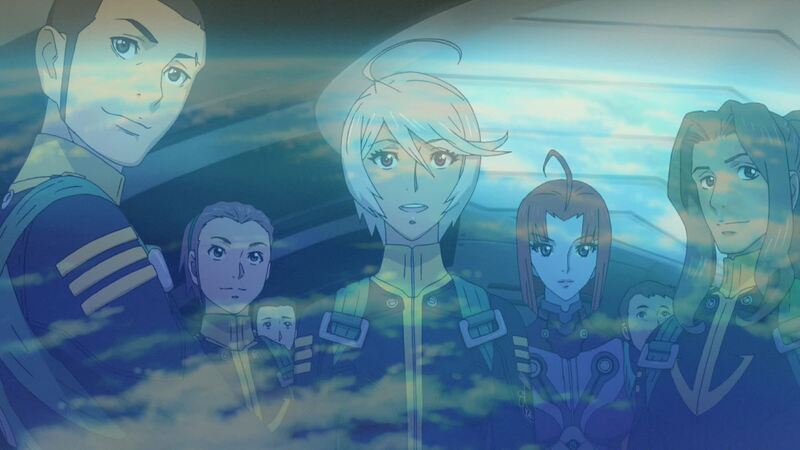 The message ends with Mamoru saying he will pray for their safe voyage and return to Earth. 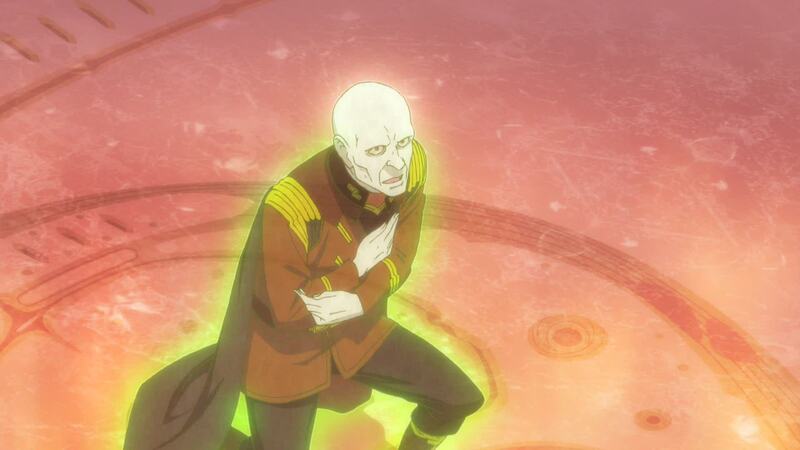 He salutes them as the hologram goes off. Susumu recalls a moment he sat alone by his brother’s grave. [LC]: Not sure if this scene is actually Kodai recalling his earlier visit to the cemetery with Starsha or if he went there after seeing his brother’s message. Okita finds some solace in the revelation that Mamoru passed away there. Sanada comments that his friend sleeps peacefully on that land, instead of the coldness of space. 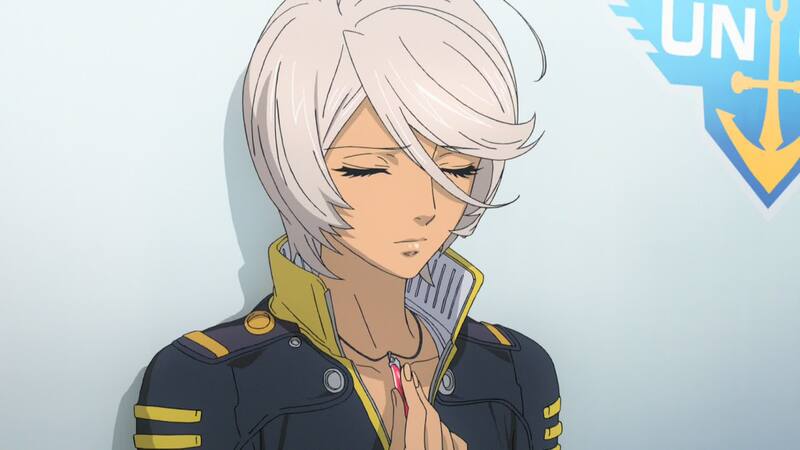 Locked in her room, an inconsolable Niimi lets out the feelings she kept hidden for so long, crying for the man she loved. [DG]: Sanada is sounding awfully poetic here for the “computer human” as Kodai first labelled him back in Episode 4. [LC]: This is the good old cliche that the deceased didn’t suffer or, as is the case, died in better circumstances than originally thought. It’s a classic, quite grounded in reality. It doesn’t ease the grief of death itself, but it seems to help. Much like the thought of the opposite horrifies us, which horror or thriller films use to great lengths. 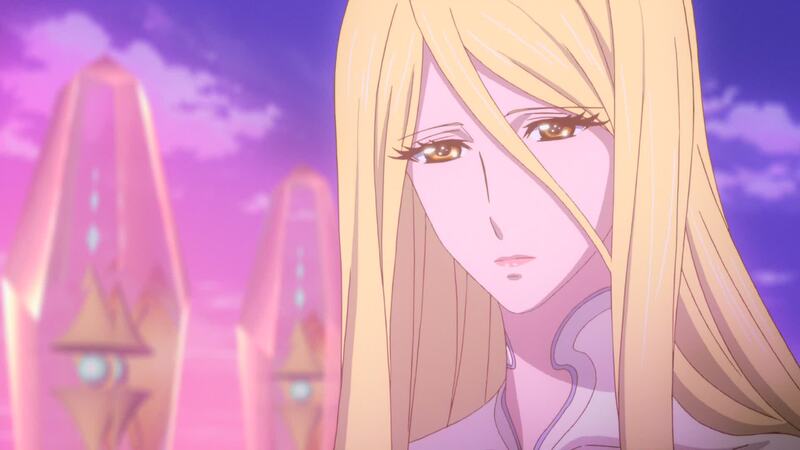 Meanwhile, after 20 episodes and 168,000 light-years, Kaoru gets to let go with her grief, because, well, spoilers before then. Maybe she was just still holding out false hope that somehow he had survived, given they hadn’t found a body. 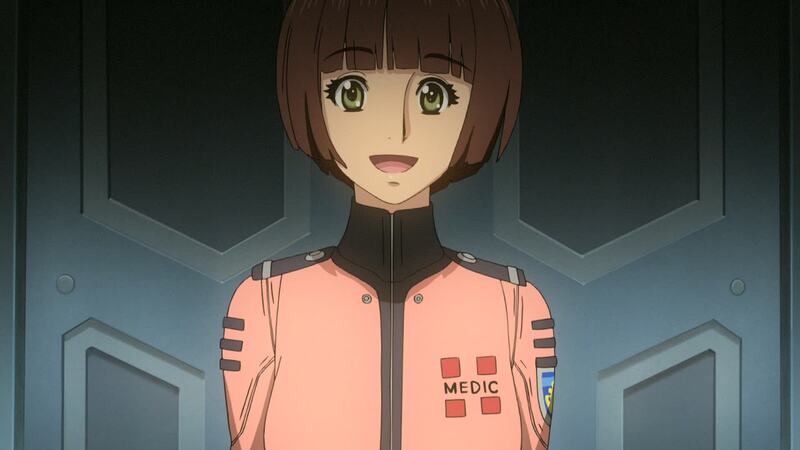 Given Niimi’s personality, it might not be so a straightforward as holding onto hope. But we saw Sanada earlier, very off-character, holding to such notions… so who knows? I’ve seen it like this. 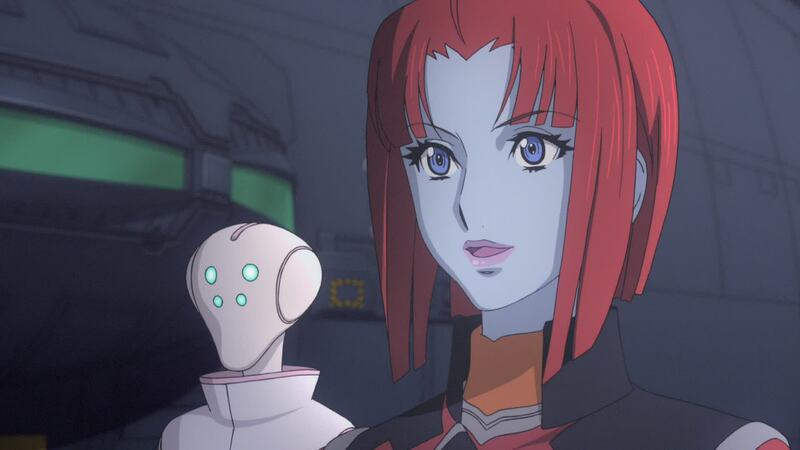 She was aware that Operation M was a potentially suicidal mission and broke up with Mamoru rather than telling him the truth about his chances. 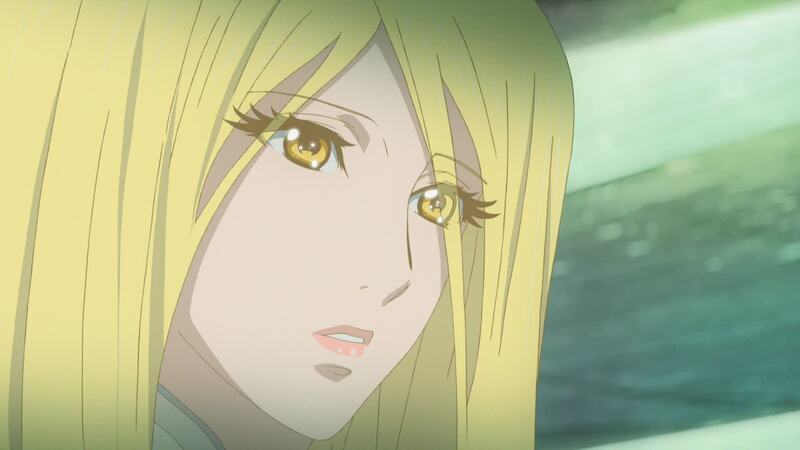 When the worst came to pass, she was too busy with both the Yamato and Izumo plans, so not much time for grieving. Or maybe she did, off-screen. At the time we hardly knew who she was, so it wouldn’t have this kind of emotional impact. 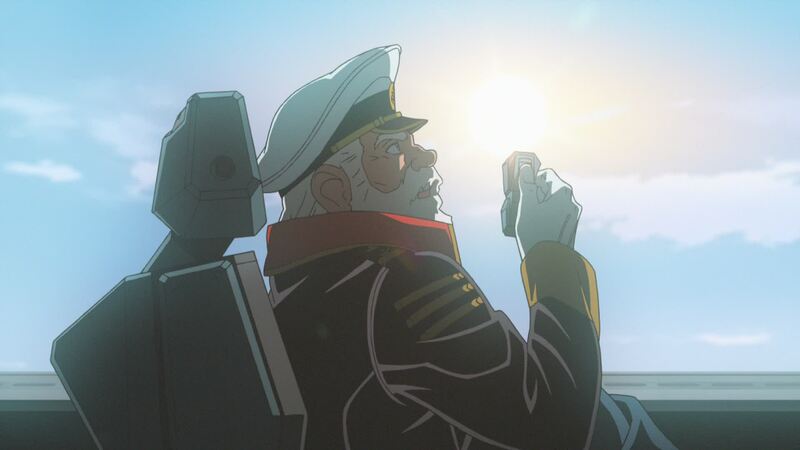 At Enceladus, we saw her in the shadows, watching Sanada salute the Yukikaze. Again, not much back story and little impact from any visible signs of grief. 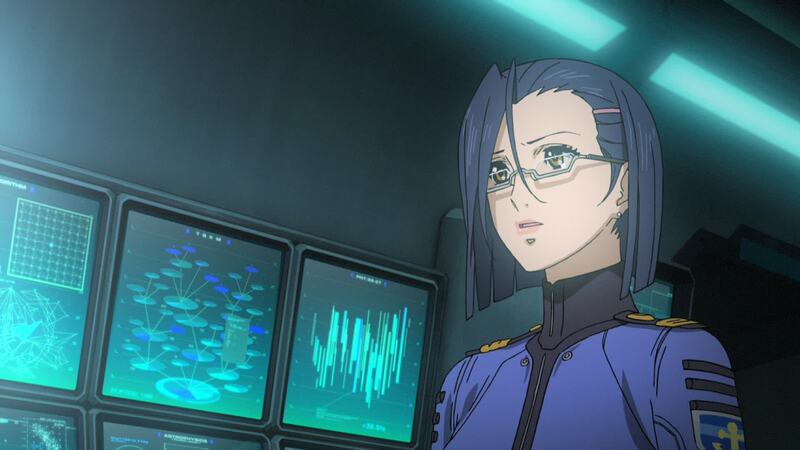 And again, still busy playing nice to Sanada while gathering intel for the Izumo faction. Things took a hard and emotional turn for her since then and she mellowed a bit. 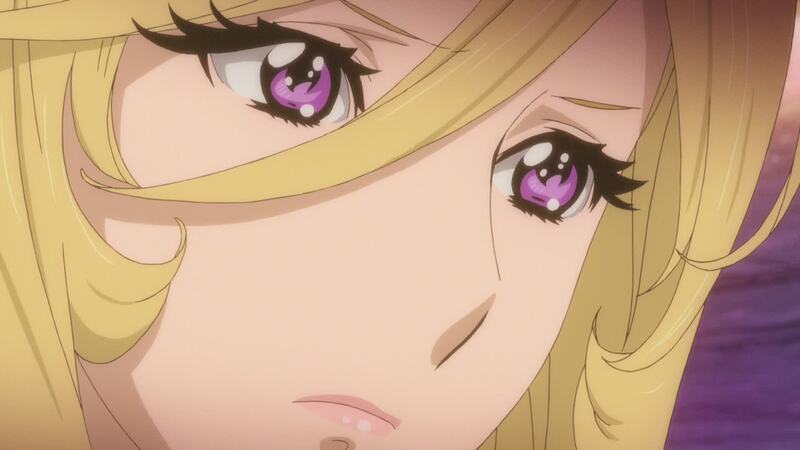 Now, she’s here, listening to Mamoru’s voice, basically saying goodbye. Guess that was just the final drop. And now, seeing this reaction from her does tug at the viewer’s heart strings. Later, Okita is alone in his cabin with Sanada. He tells the XO they should return to Earth. That was Mamoru’s wish and their task. Sanada agrees. Morning comes and work on Yamato is finally completed. On the ship’s bow, the firing gate of the Wave-Motion Gun has been capped by a bright orange plug, the only outward sign of the changes made to the ship. Kodai, Yuki and Yamamoto are on the dock with Yurisha and Melda. Yurisha reveals she will travel to Garmillas so she can help the people. Melda thanks her (“Irun Yurisha”). 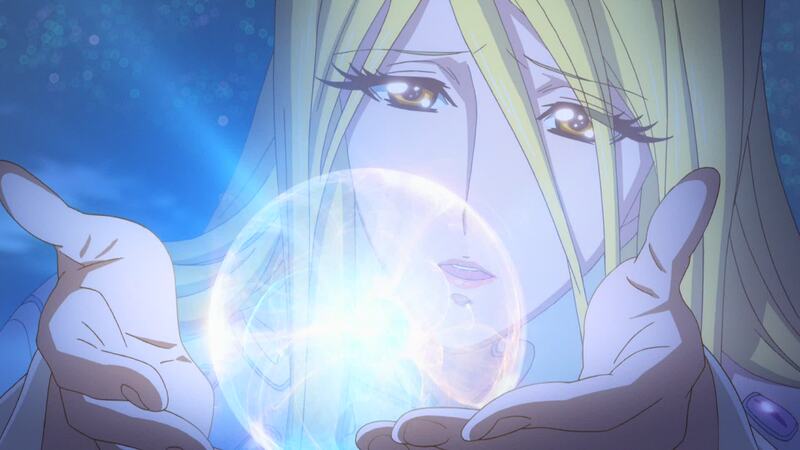 She then presents Yuki with a gift, a vase with Blue Crystal blossoms, meant as a sign of the bond between them. [DG]: The Iscandaroid looks almost like it’s on a pogo stick the way it appears to be bouncing. 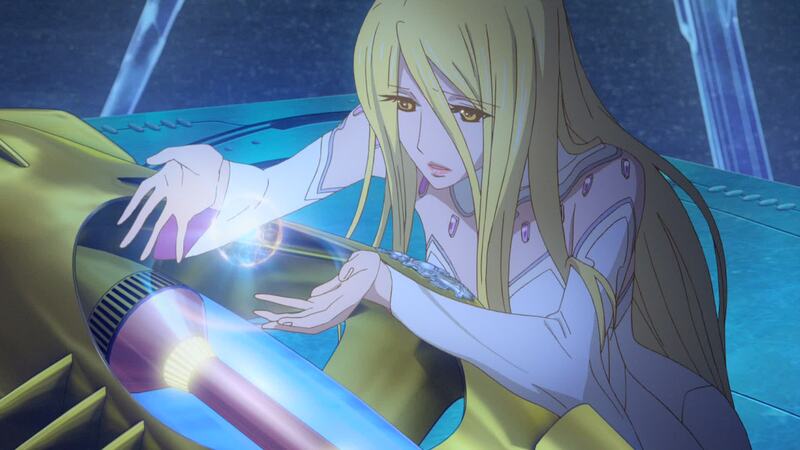 As she hands Yuki the vase, she recalls the flowers’ meaning of hidden life and hidden emotions. 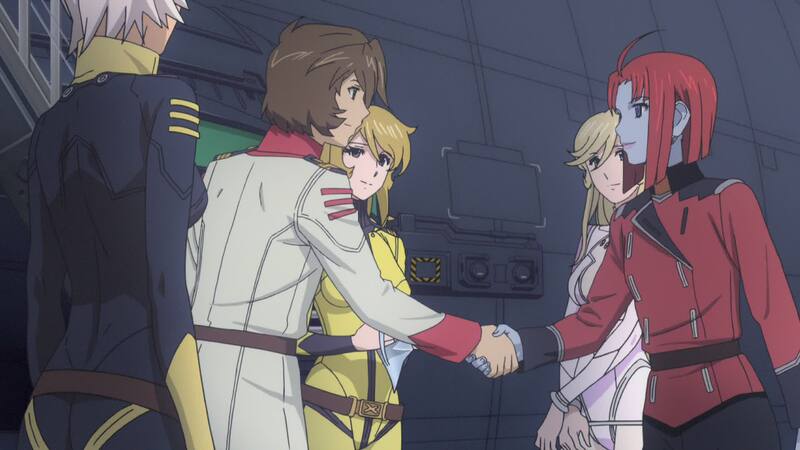 Kodai steps forward and extends his hand to Melda. [DG]: The flowers and Yurisha’s words: more red herrings? This isn’t the last we see of those flowers. In the background, the AAA turrets to the stern of the portside have been repaired. 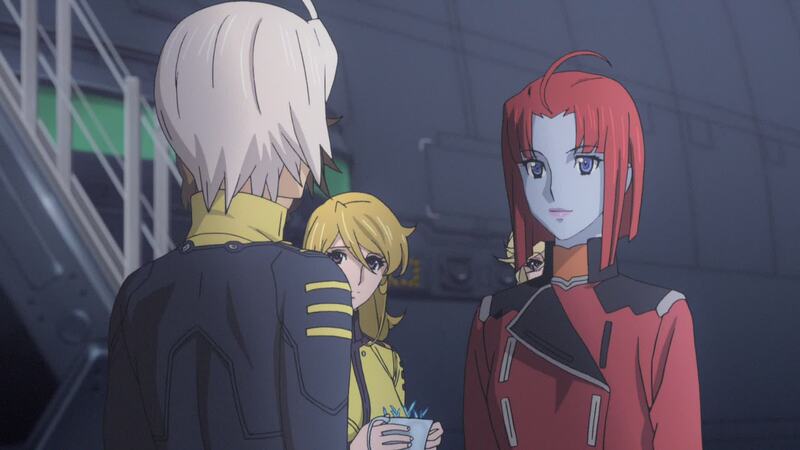 Melda looks surprised by Kodai’s gesture but eventually smiles, saying they share the same mentality. The same words Kodai told her months before, as they released her. Kodai remembers and says that’s his line. Melda finally steps forward and they share a fond handshake. 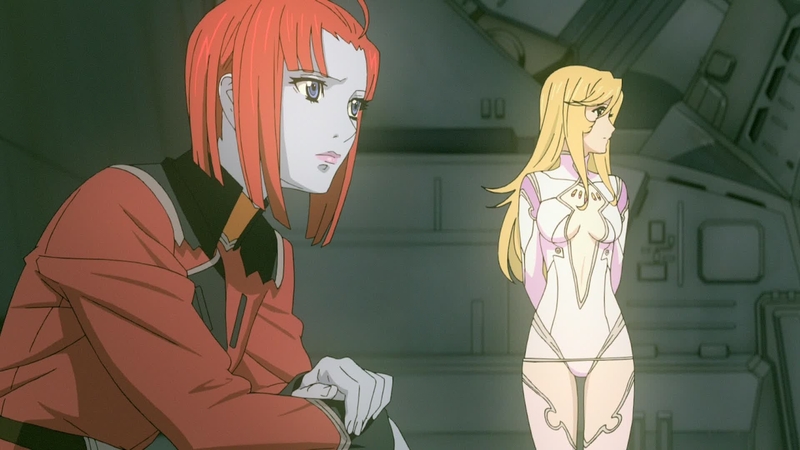 Yamamoto smiles as she witnesses this, but looks surprised when Melda turns to her. 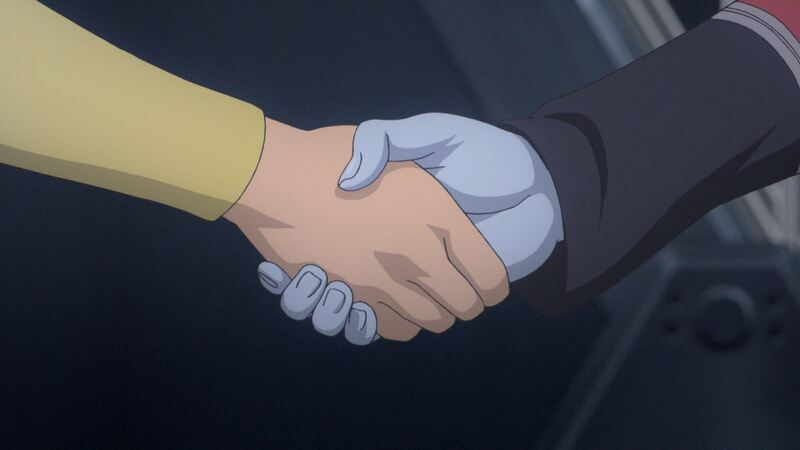 Eventually the two pilots shake hands as a sign of mutual respect and perhaps… friendship. [LC]: In A Voyage to Remember, this scene is not just cut slightly but modified to fit the cut. They cut Yamamoto’s bit and replace her arm with Kodai’s in the close up of her handshake with Melda. 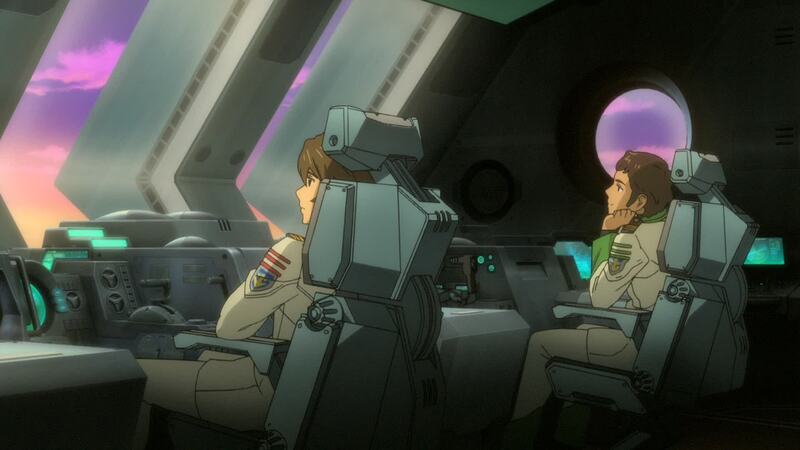 [DG]: This is one of my favorite moments in 2199, seeing the step Kodai took in Episode 10 (trusting Melda’s word) culminating with the end of the war and Melda parting ways as friends with Kodai and Yamamoto. This is the final part of “what if we took a different path” from the original, and I think it’s a better ending. [LC]: This is one of the plots that was resolved properly. 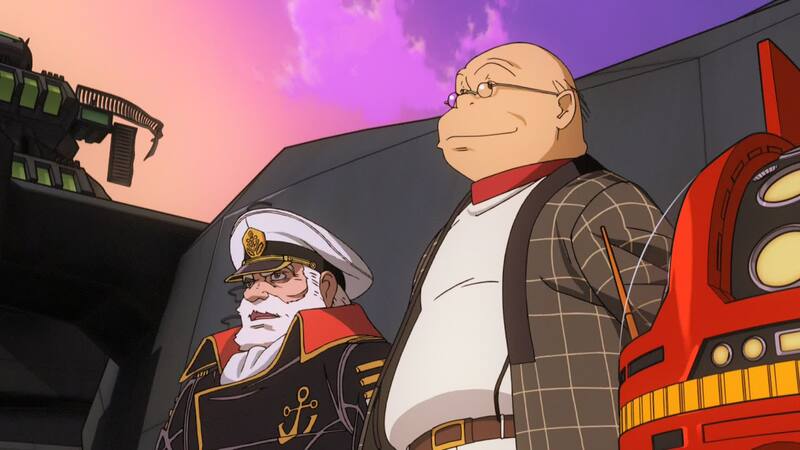 I love that it encapsulates the general attitude of humanity toward Garmillas, in that both Kodai and Yamamoto resolve their feelings of revenge and hatred, learning that war is not as black and white as we sometimes make it. 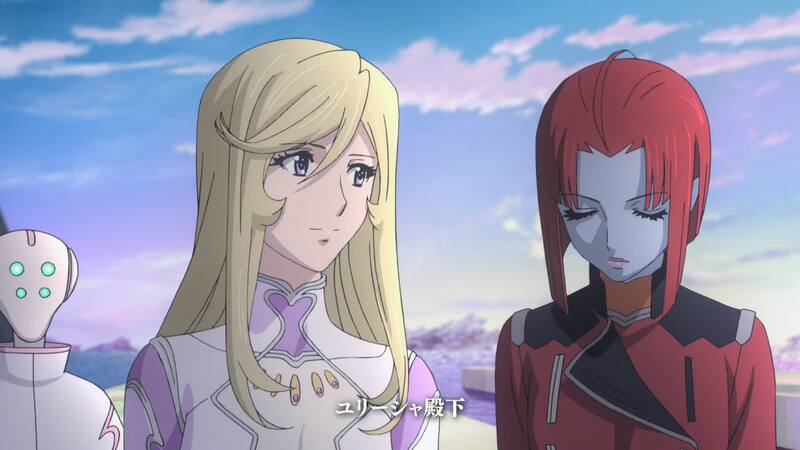 I hope both Melda and Yurisha show up in 2202. For now, they have a hard task ahead of them. Okita takes the PA port in his hands and addresses the crew. He announces they’ll now finish the reception of the Cosmo Reverser and return to Earth. 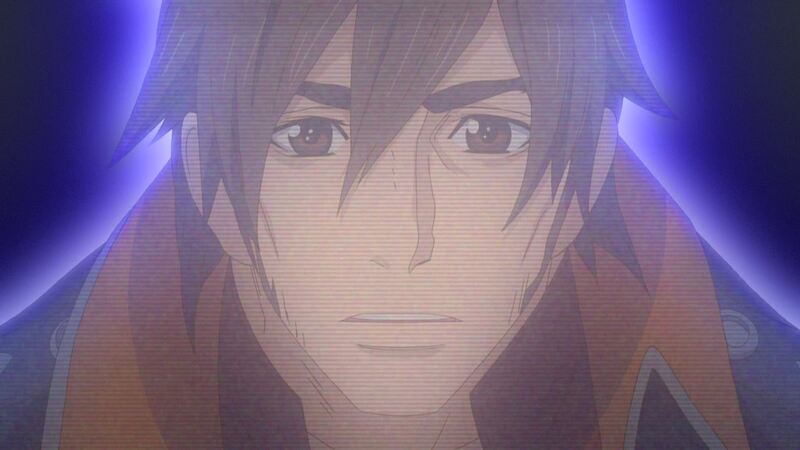 He says “Let us return home.” Sanada orders Shima to weigh anchor. The anchor is retracted and the ship slowly moves away from the dock. 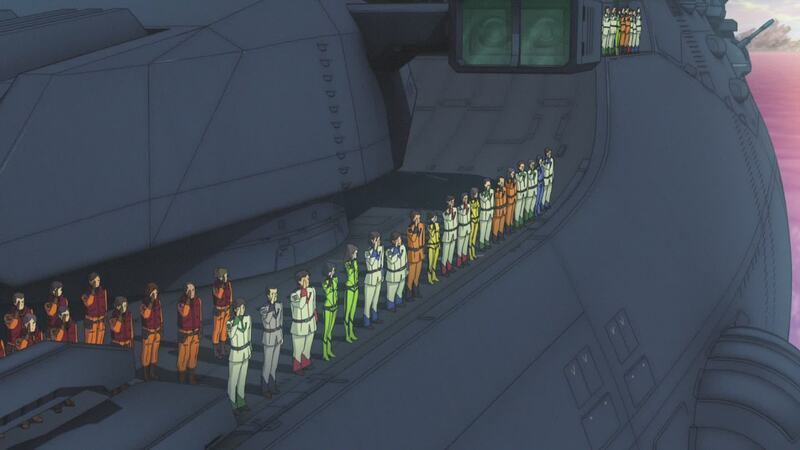 The entire crew stands to attention on the decks or at their posts, saluting their host as they move out. [LC]: Now that that rear stabilizer is fixed, the problem I pointed out earlier is quite apparent. 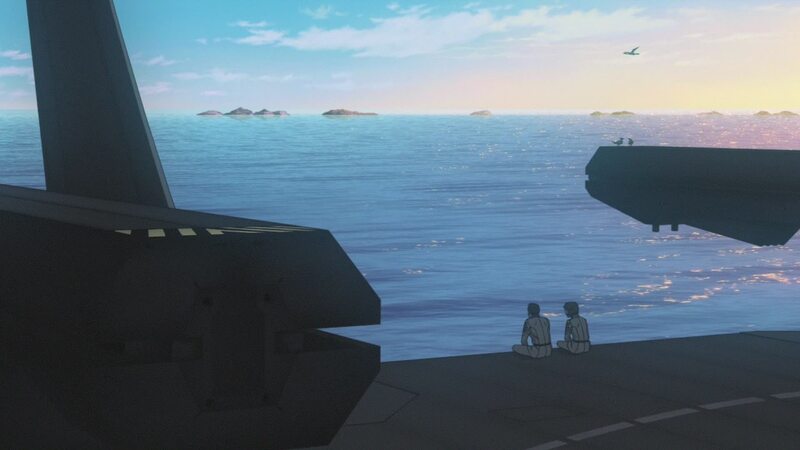 Well, not very much because they kept it under water, but if you look carefully, there’s no way Yamato could be so close to the pier without breaking it off again. 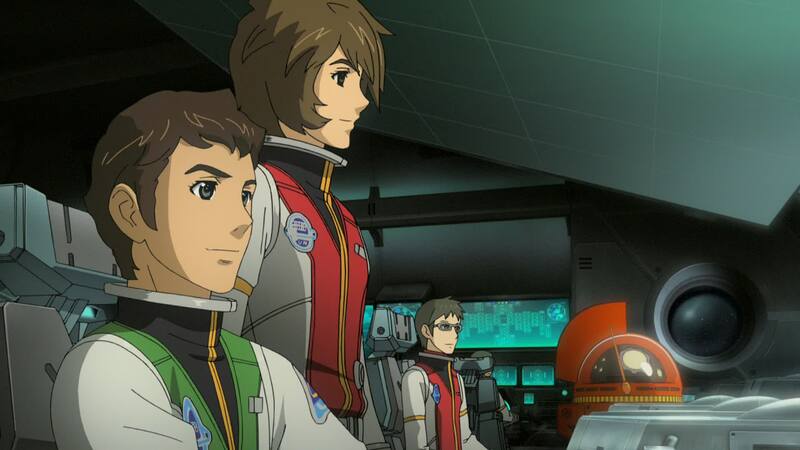 There was a slight change in music from the theatrical release and the original series as Yamato weighs anchor: Yamato Sleeps in the Setting Sun was replaced with Yamato Launches From the Earth, keeping with 2199‘s usage of the latter in terms of it being “milestone” music. 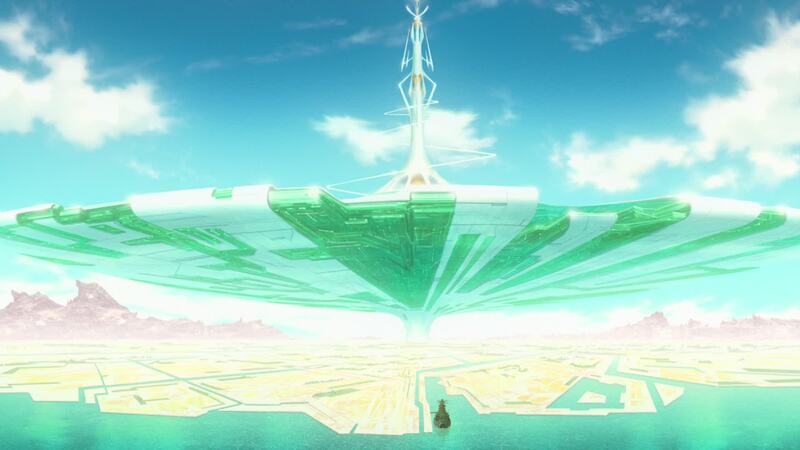 While using it for both arrival and departure at Iscandar would have been overkill, it really didn’t suit the mood either of the end of Episode 23 nor of the start of Episode 24. To be honest, I like both pieces here, and find it hard to judge which one is more appropriate. 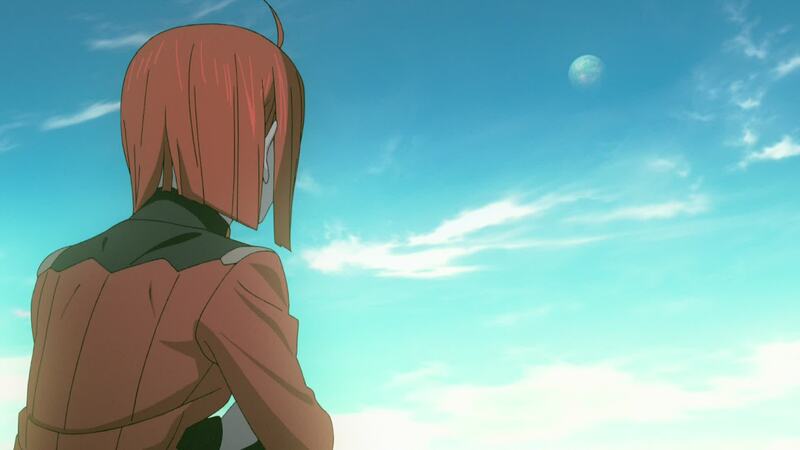 As she looks out the bridge windows, Niimi says farewell to Mamoru. 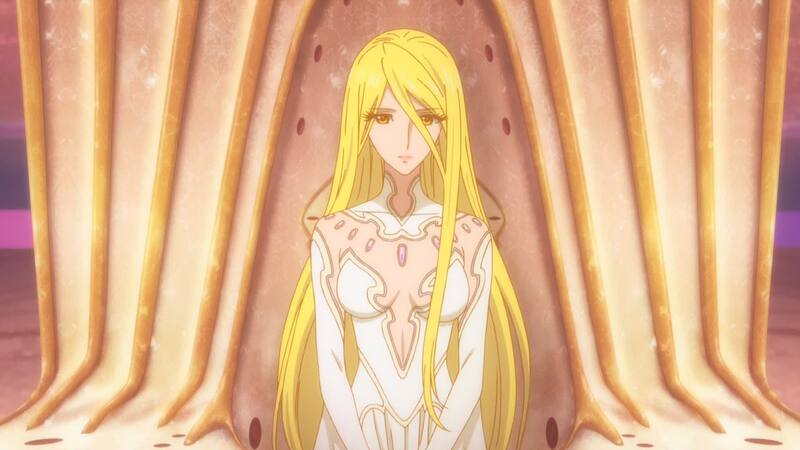 In the room where Yurisha once slept is now the golden capsule that was in Starsha’s tower. 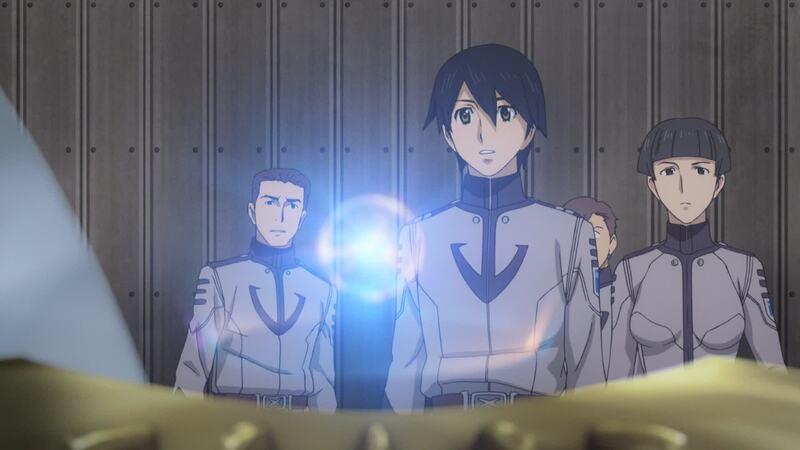 The bright sphere of light seems to pulse in response to Niimi’s farewell. [DG]: Ah, Kaoru. If only you knew. 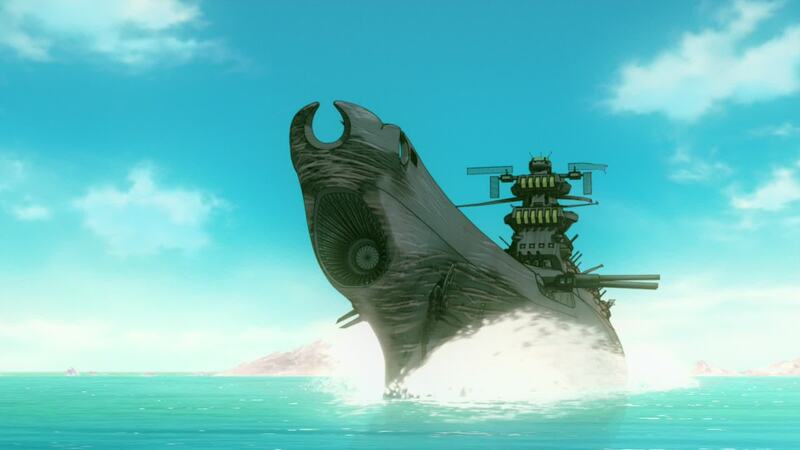 Yamato sails away from the city, gaining speed until it takes to the skies. 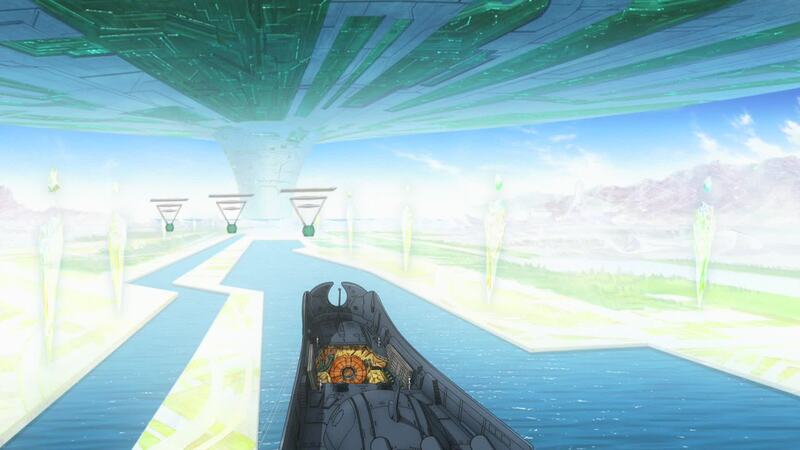 They break free from the ocean and climb skyward, leaving the gleaming capital of Iscandar behind. 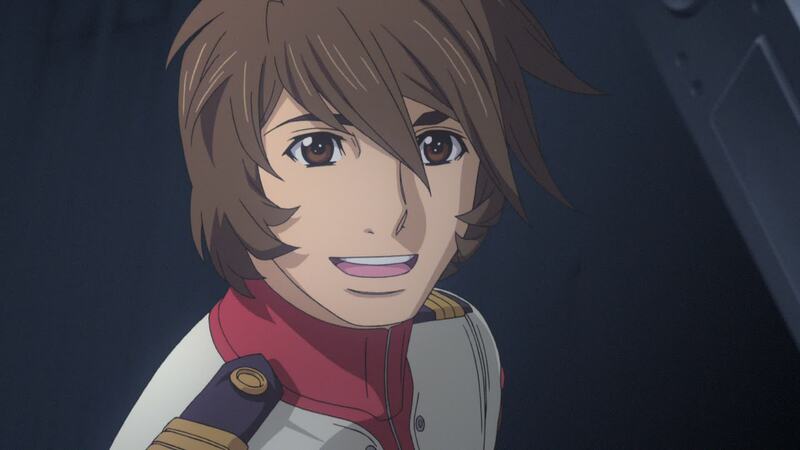 Yamato is now the instrument of hope and salvation for mankind. Its long journey of 168,000 light-years back to Earth has begun. [LC]: There were actually two music cues in the theatrical version. 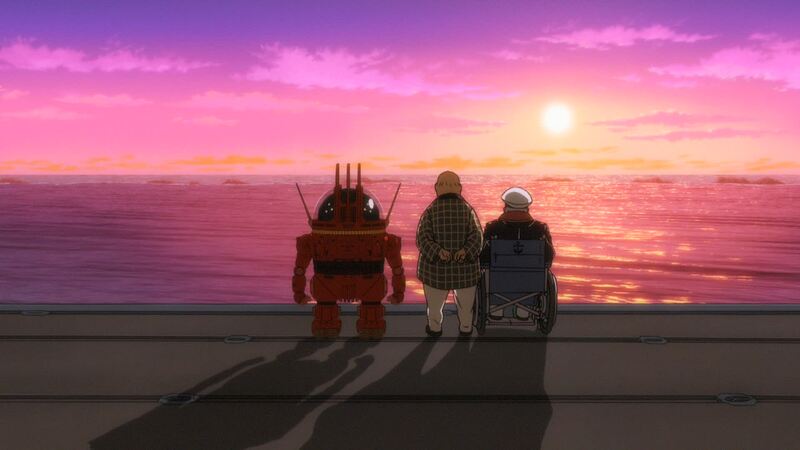 Yamato Sleeps in the Setting Sun plays until Niimi says goodbye to Mamoru, with Pioneering Yamato starting as the ship moves away from the dock, all the way to the fade out. 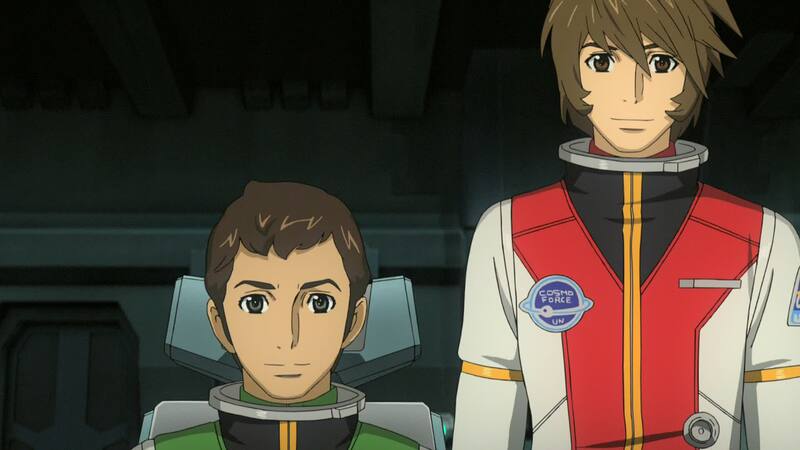 Because Pioneering Yamato is a personal favorite of mine, I do admit I prefer the theatrical version. 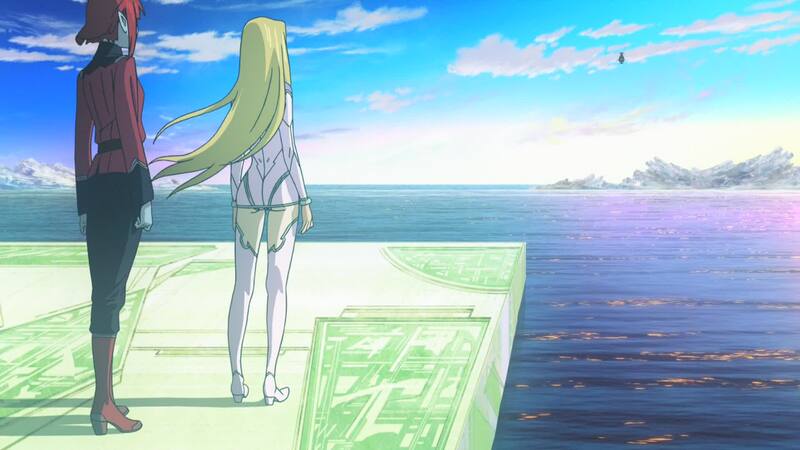 But ultimately I agree with you, the track used in the final version ends up having a greater meaning to the story by perfectly portraying the start of both legs of Yamato‘s journey. Click here to see this sequence with the theatrical score. 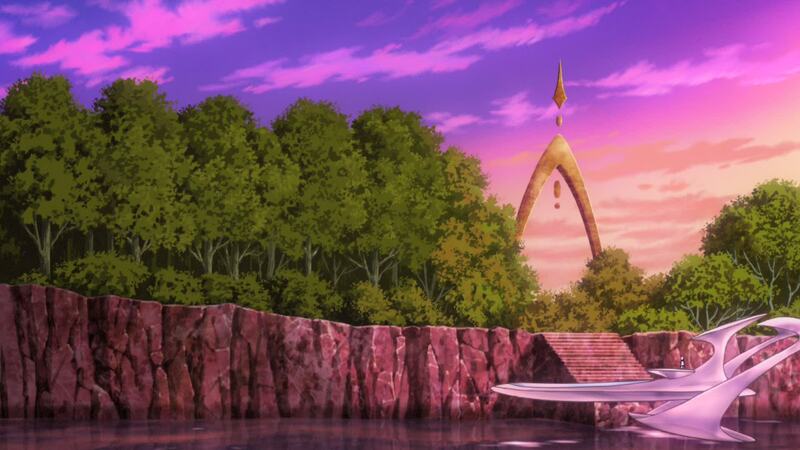 I must also give kudos to the artists involved in making the water effects for this episode. It doesn’t look photo realistic by a long shot, but… man, does it look good. Some truly fine work that perfectly fits the animation style of 2199. [DG]: Another vague statement from Yurisha. “My other self,” I guess we’ll have to wait until 2202 to find out if it means anything, because we don’t get any answers in the rest of the journey here. [LC]: I admit these cryptic, nonsensical lines from Yurisha do make it hard to put the “Yuki is an alien” thing to rest. Personally, I chalk it up to just that, nonsense under the guise of cool mysterious writing. Part of me hopes 2202 proves me wrong. 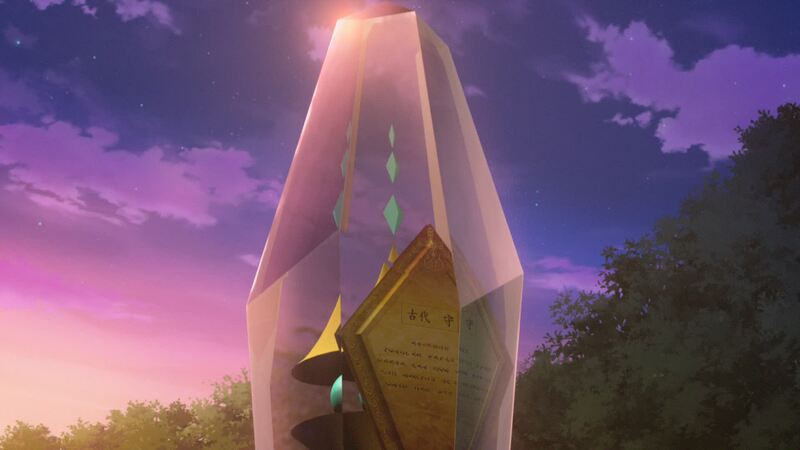 Starsha is standing beside Mamoru’s grave. 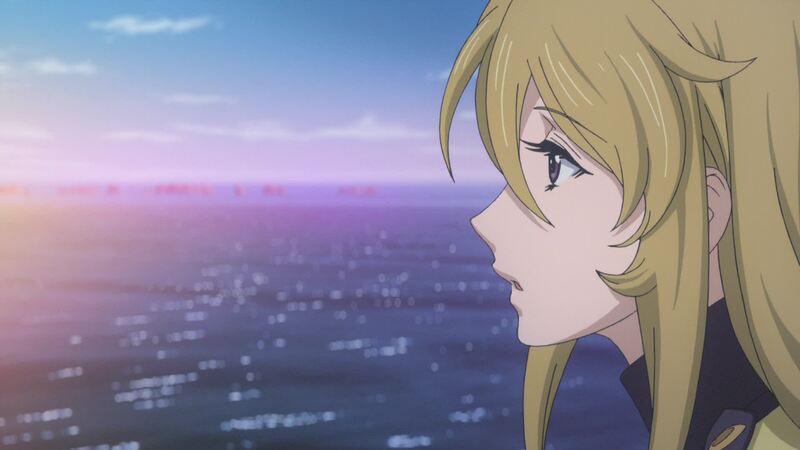 She looks up at the speeding Yamato, now just a dot of light in the distance. 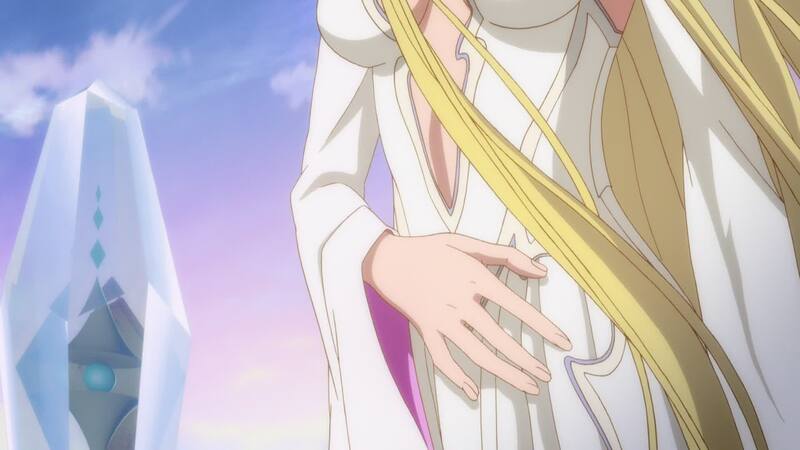 As she places her hand gently over her belly, she bids farewell… to Mamoru. Her expression is filled with sadness and longing. 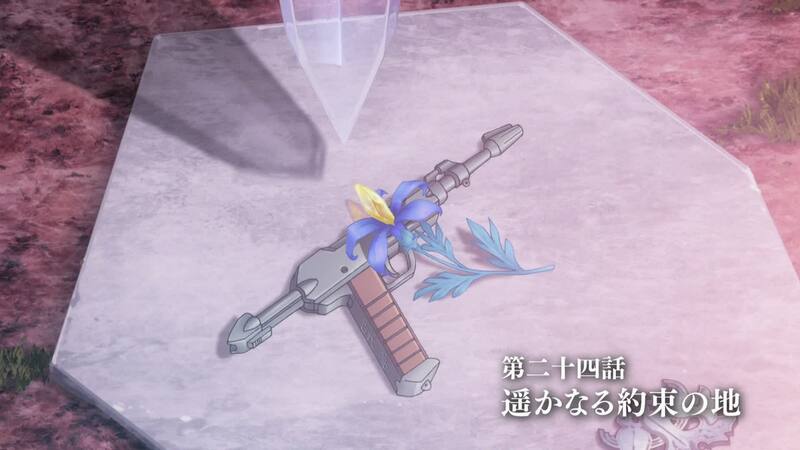 Placed on the fallen officer’s grave is a Blue Crystal blossom, atop the Cosmo Gun that once belonged to him, a memento from Susumu. 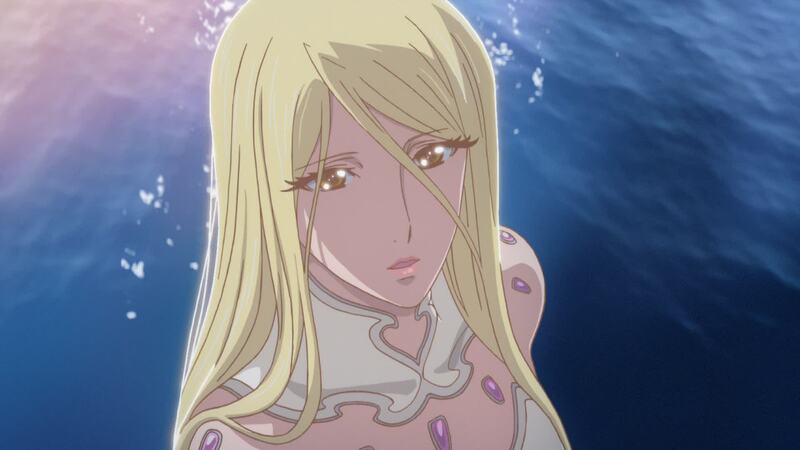 [LC]: Yeah… I had a hard time with that bit too… If she is indeed pregnant with Mamoru’s child, it’s one hell of a stretch to believe he could bed Starsha in the condition he was supposedly in. And it makes Starsha look at bit “easy,” too. 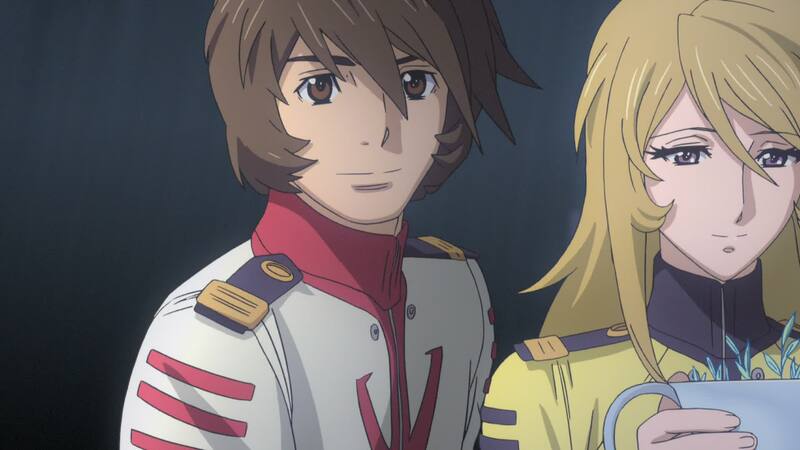 I mean, in the original they only professed their feelings for each other here, before Yamato‘s departure. Then they were alone on Iscandar for over two years, during which Sasha was conceived and born. 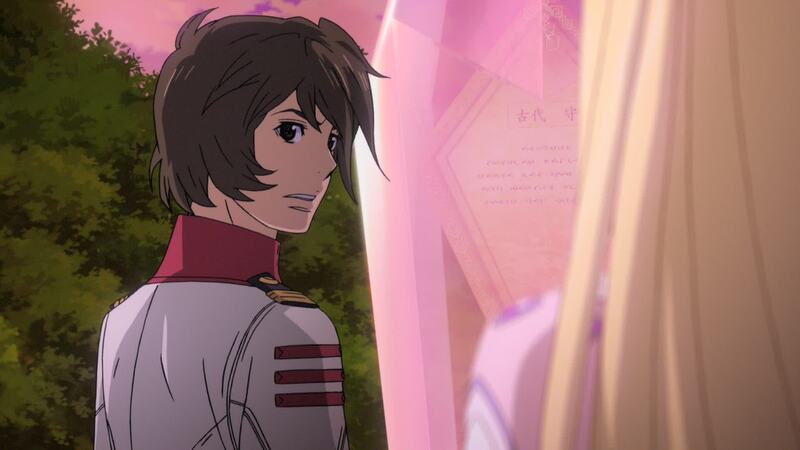 I’d like to point out that there are probably numerous other explanations as to how the gene extraction happened, but I doubt it based on the look he gave Starsha in the hologram. Meanwhile, Kodai left his brother’s gun behind. 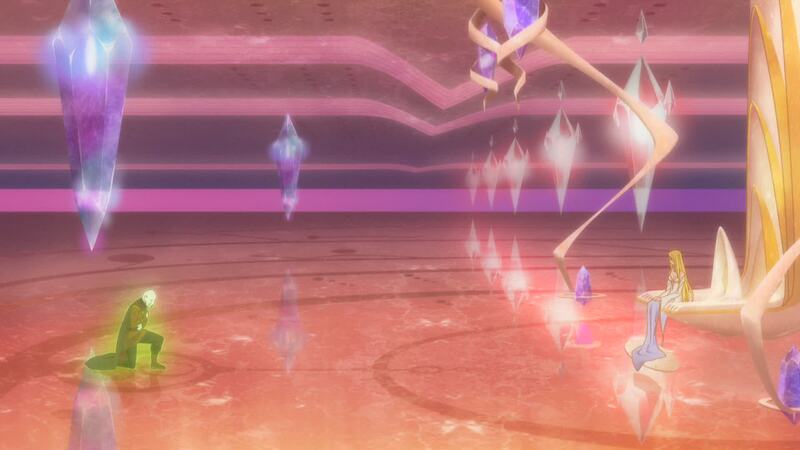 I’d assume Starsha left the Blue Crystal there. He didn’t leave the harmonica though. If we take the memories seen in Episode 14 at face value, Mamoru gave him the harmonica and it’s been a keepsake from his brother for a long time. His gun, on the other hand, was found at the place where Kodai believed him to have fallen. So it is fitting that it is return to its owner, in his actual resting place. Though, as we’ll learn, he’s not really at rest… yet. [DG]: Yamato leaves after what appears to be a very short stopover of two nights. They seem to have completed all the repairs in that time, since all gun turrets are intact again. [LC]: I think a little more time went by, at least close to a week. They just skipped the greater part of those days ahead. But going by the sunsets and sunrises, at least four or five days go by. Of course we don’t know how long Iscandarian days are, so it’s hard to put an Earth-day count to it. Though a number of events from the original series changed in this episode, it was better overall in my opinion. The absence of Yuki’s kidnapping by a handful of crew members led by Yabu (who all went to their deaths while Kodai rescued Yuki in a dramatic scene) was not at all missed. Well, I think I speak for most fans when I say we’ve had enough kidnapped Yuki in 2199 XD. 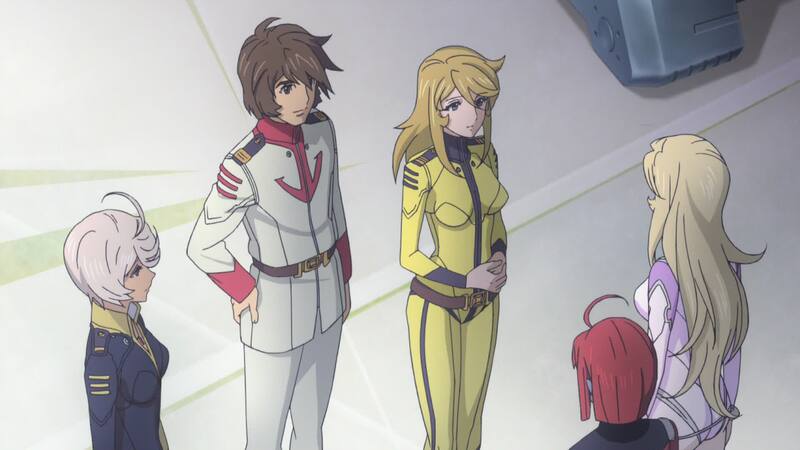 I do like that Yabu gets a more heroic destiny (which we’ll learn in the next episode) and part of Yamato‘s crew didn’t behave like jerks in front of Starsha. 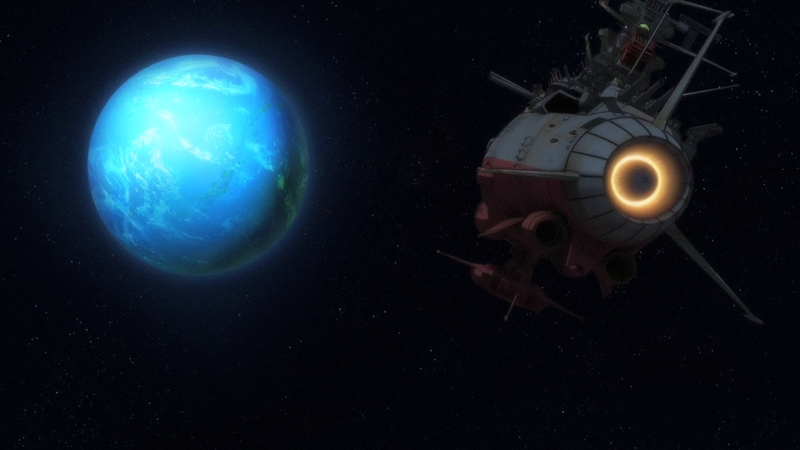 From here, chronologically, the next stop in Yamato‘s journey is its battle with Gatlantis forces on the return journey. But our commentary will continue through the series rather than sidetrack to Ark of the Stars. We haven’t even started it yet, but 25 is already giving me headaches. Not just for the content, but for being the most modified episode in the entire run, from theatrical to final version. Well, into the breach! 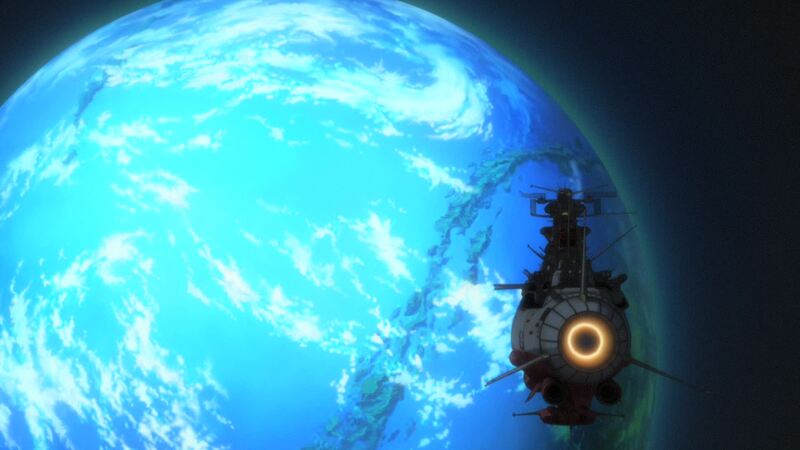 And on to Earth, Yamato. 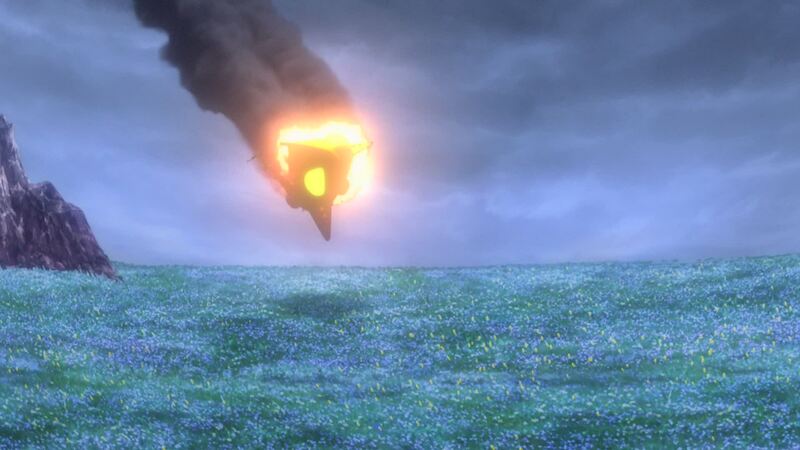 With Iscandar behind it, Yamato hurries back to Earth. Will they make it? 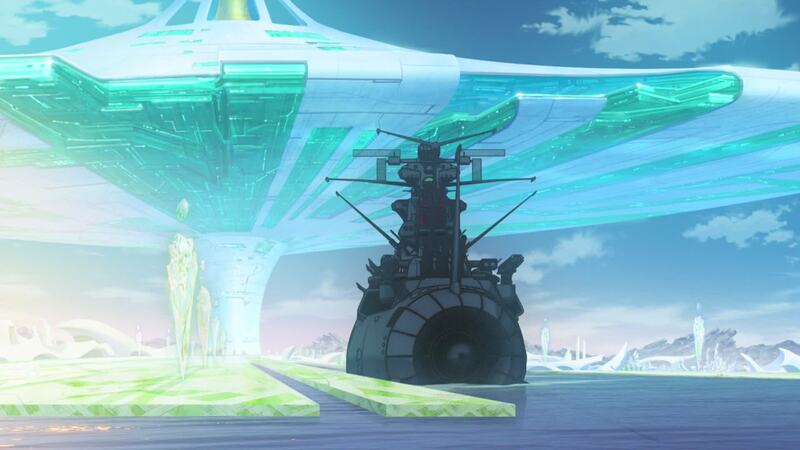 They arrive at the Balun gate, hoping to speed up their return. But there, they see that man… their enemy. Can they see a future beyond him? Next time: The Forever War. There are 143 days left before humanity becomes extinct. 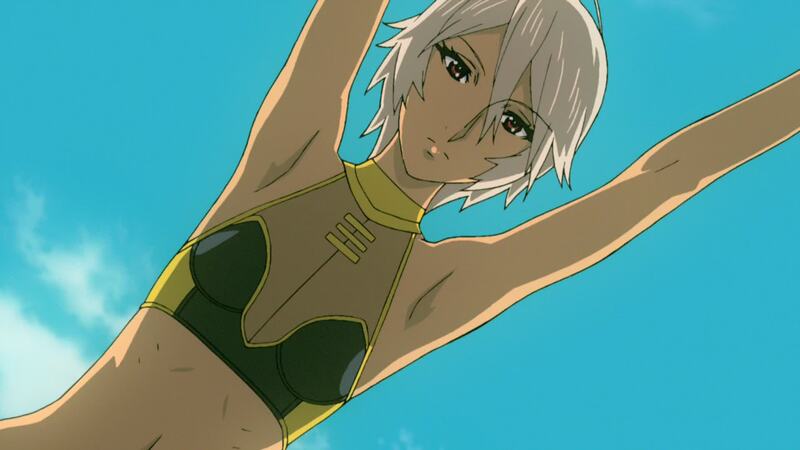 [Sigh] Fan service can get corny, especially when juxtaposed with the act of kicking someone into a 20 meter belly-flop! And leaning on the fourth wall is certainly indicative of the development team recognizing that some in the audience may think about something not appropriate for public discussion. 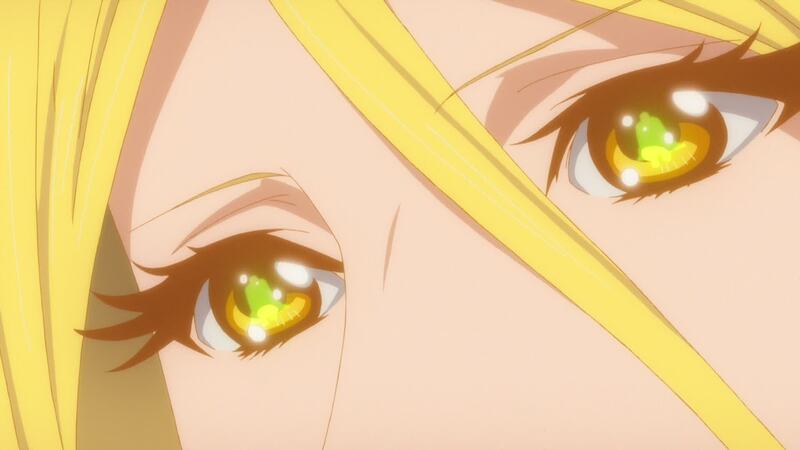 Why do you assume that Mamoru seduced Starsha? What makes you believe a space-woman alone on a world would not want to take advantage of such an opportunity? Anyway, I don’t like this reworking of the port call at Iscandar at all. By having the Yuki-napping and the mutiny earlier in the series, they let Yabu off the hook. 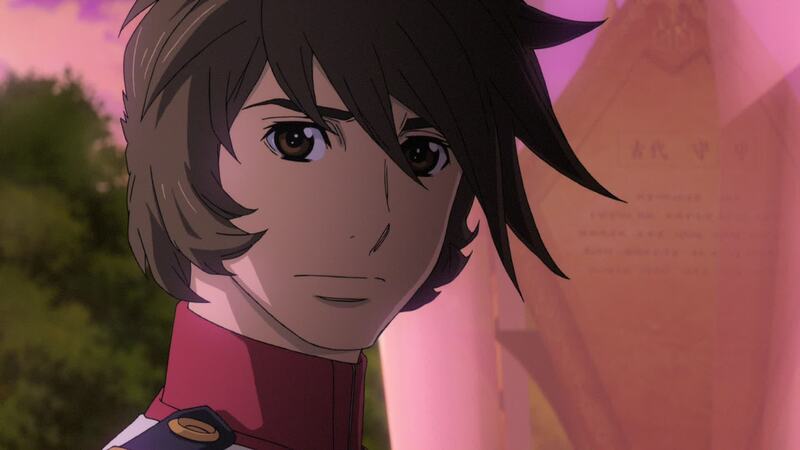 That sequence would have more sense with this version of Yamato, as it would have confirmed what Starsha already knows about human behavior. Would she have saved Earth, regardless? Yes, because of Mamoru’s influence. For the length of the Iscandarian and Garmillan day: the two planets are likely tidal-locked with each other, as Pluto and Charon, and thus the length of the day must be the same of the revolution period of the two planets around the barycenter of the system. 6.4 Earth days in the Pluto/Charon system. If the two planets have a similar mass to the Earth, and if we can have a figure of the distance between them, a calculation of that period is pretty easy. I think that it can be still in the range of some Earth days.